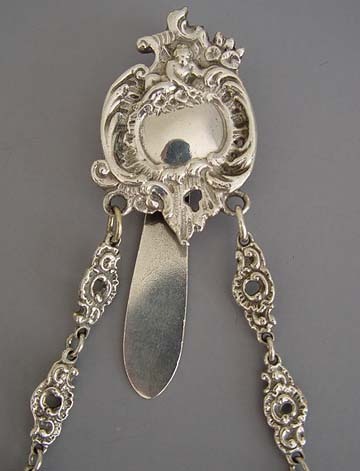 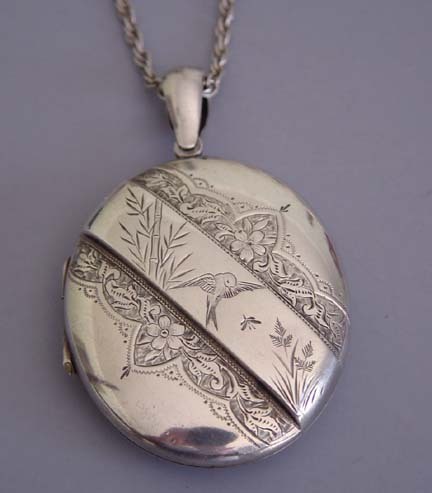 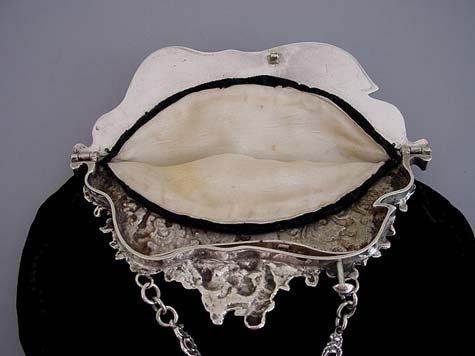 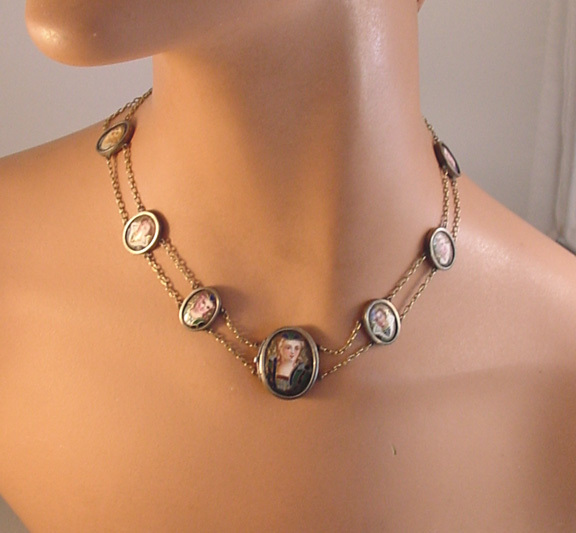 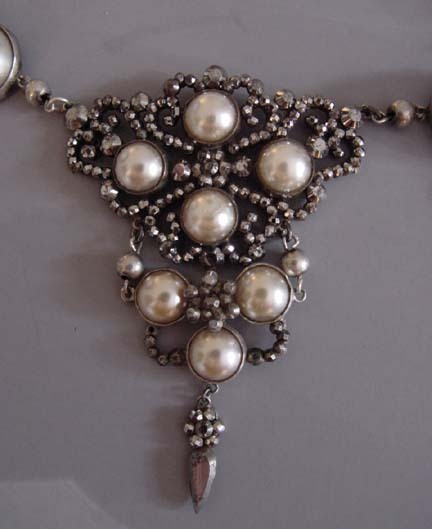 Victorian jewelry is as complex in it's symbolism, sentiment and design as was the fashion, architecture and decor of the time. 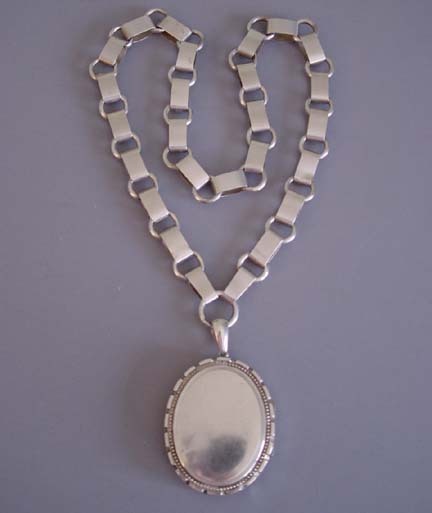 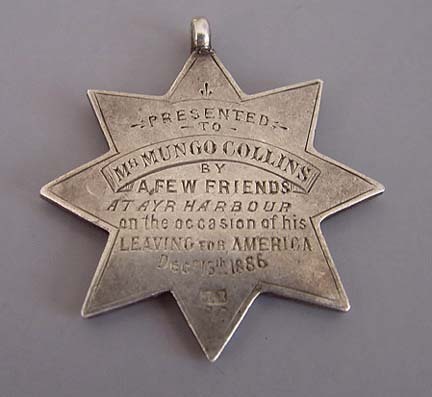 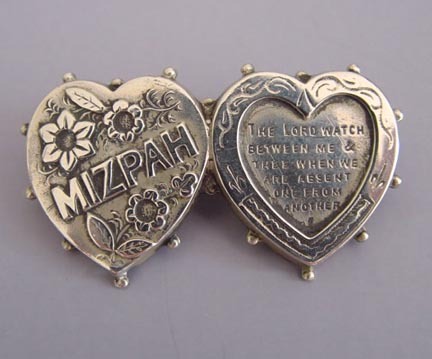 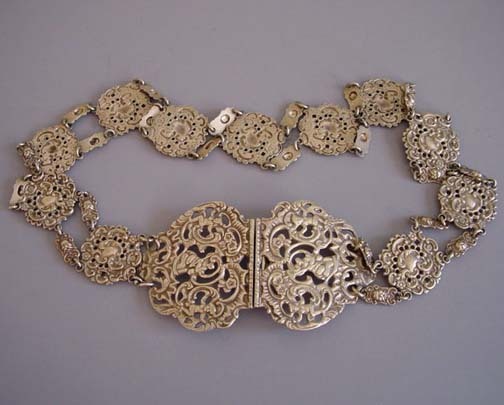 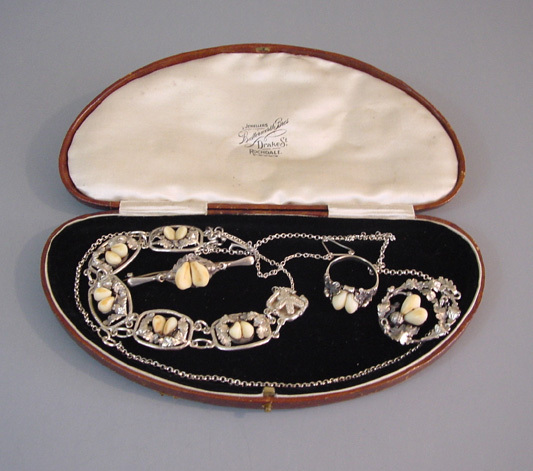 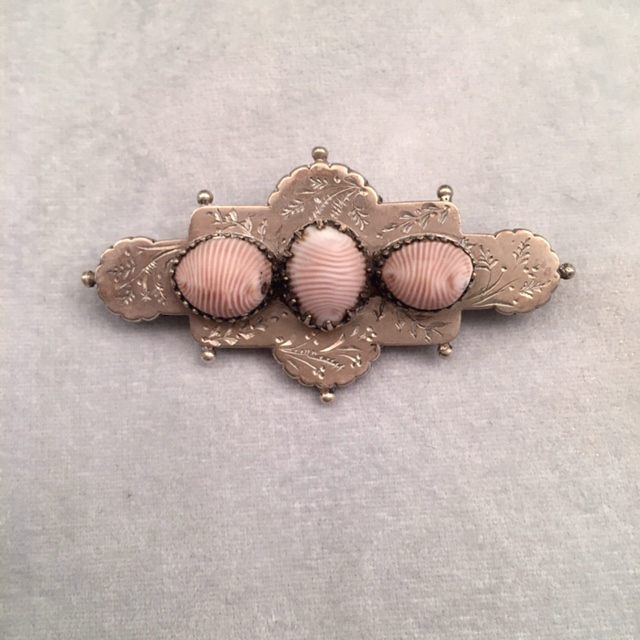 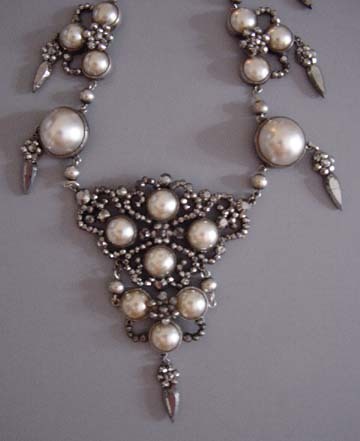 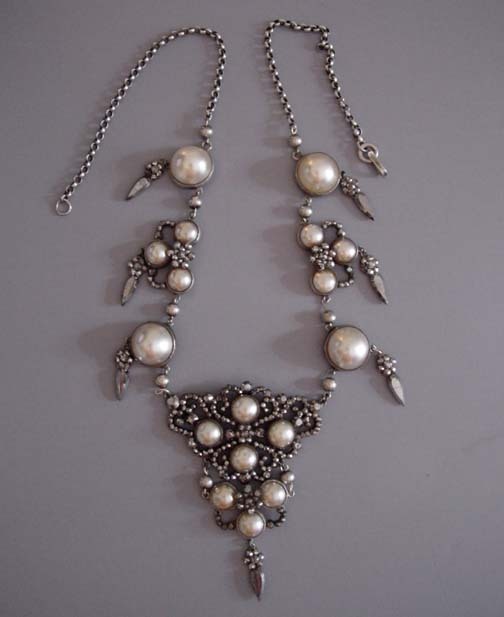 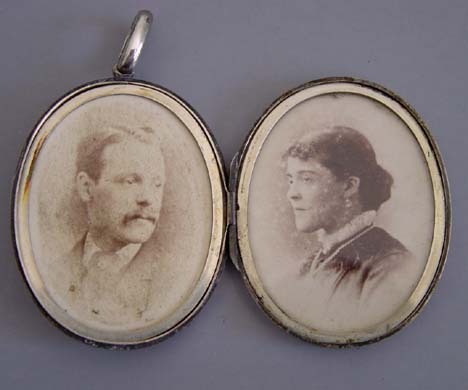 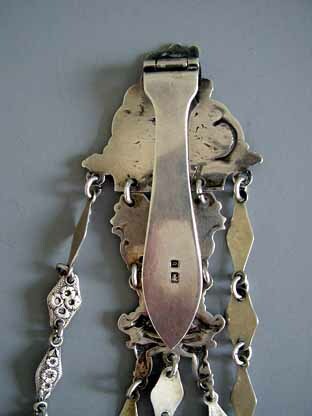 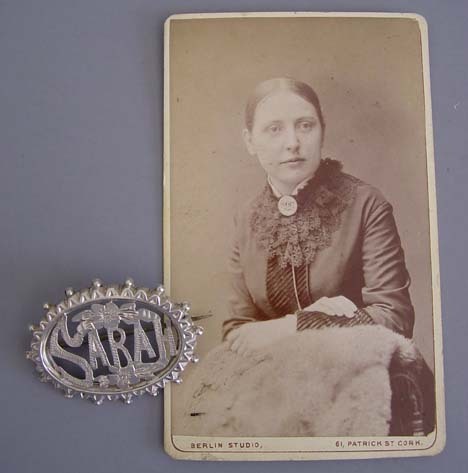 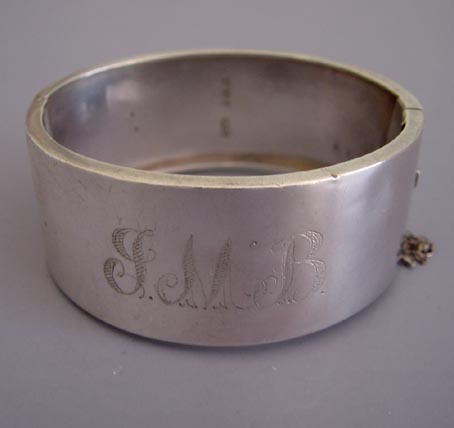 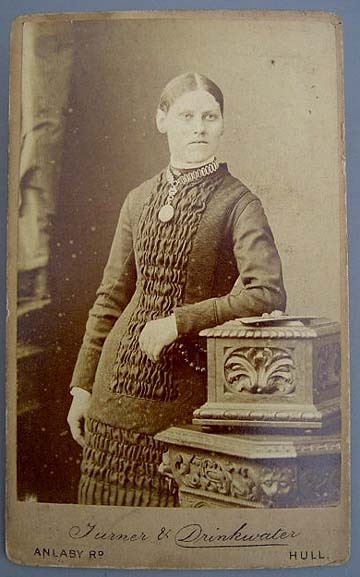 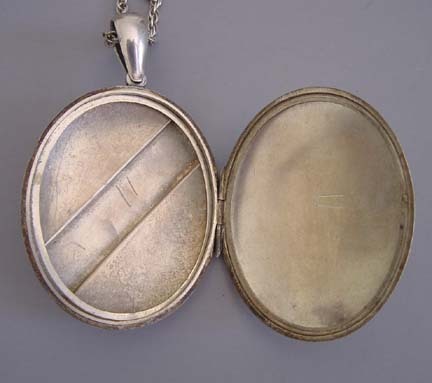 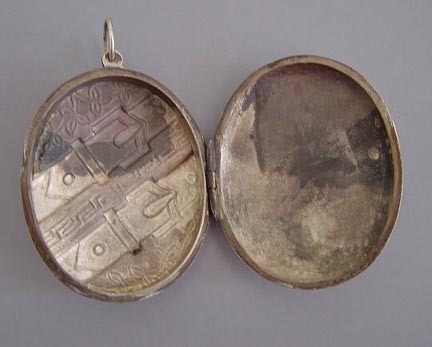 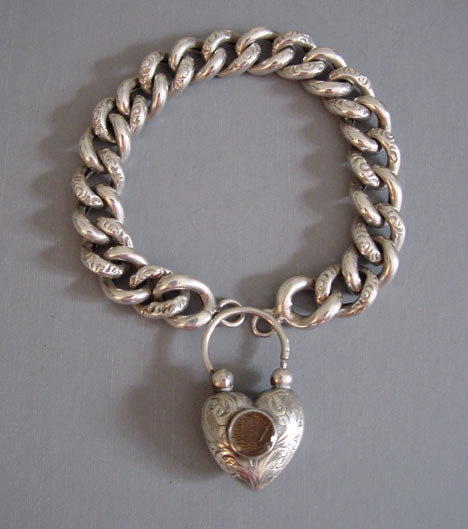 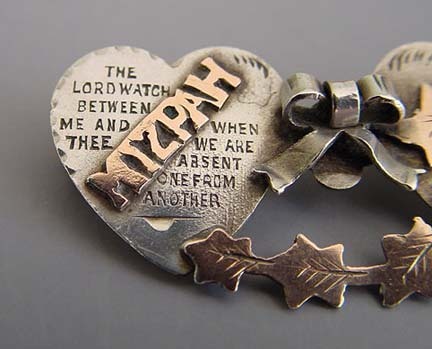 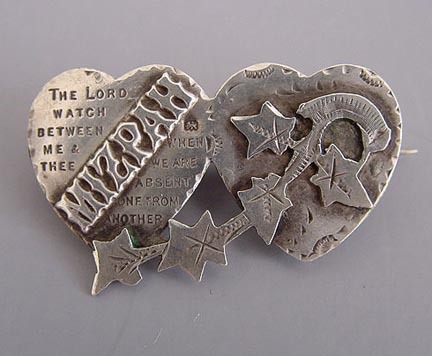 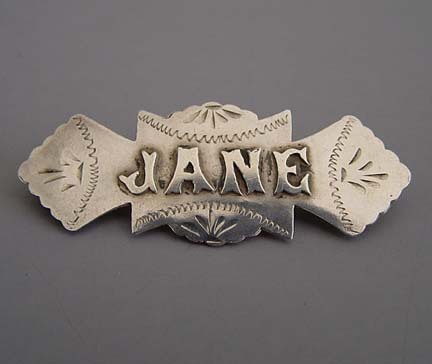 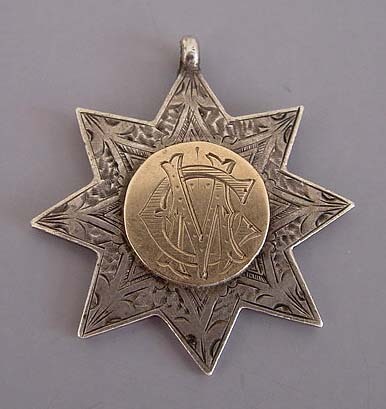 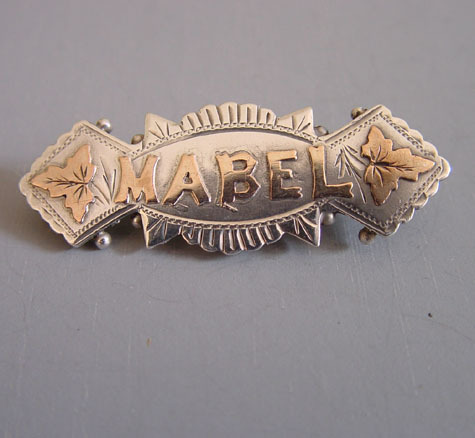 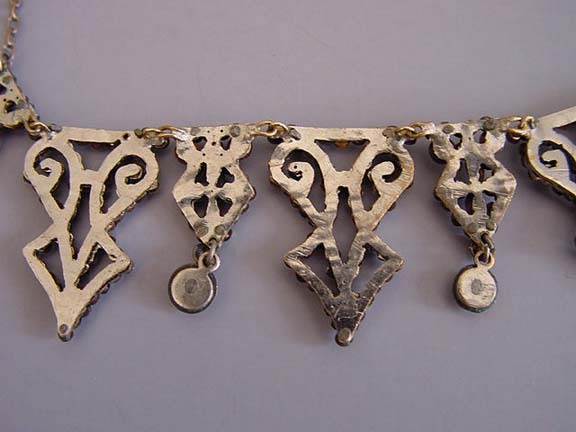 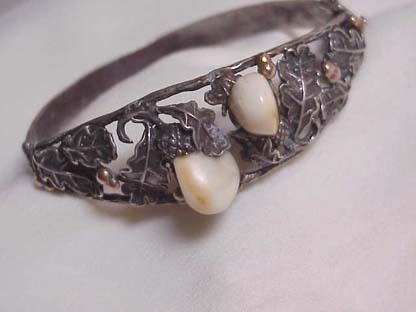 Worn as an ornament, a love token or a remembrance, jewelry not only completed the well-dressed lady's costume but also denoted her position in society, her marital status and her sense of self. 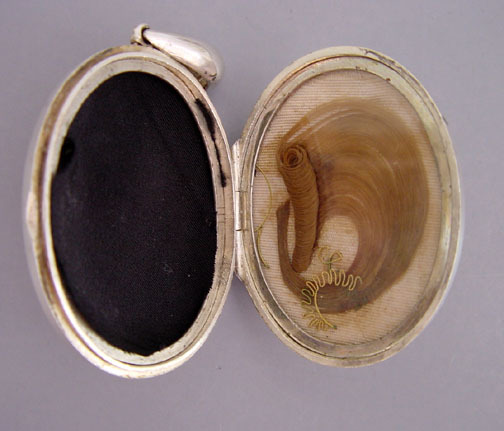 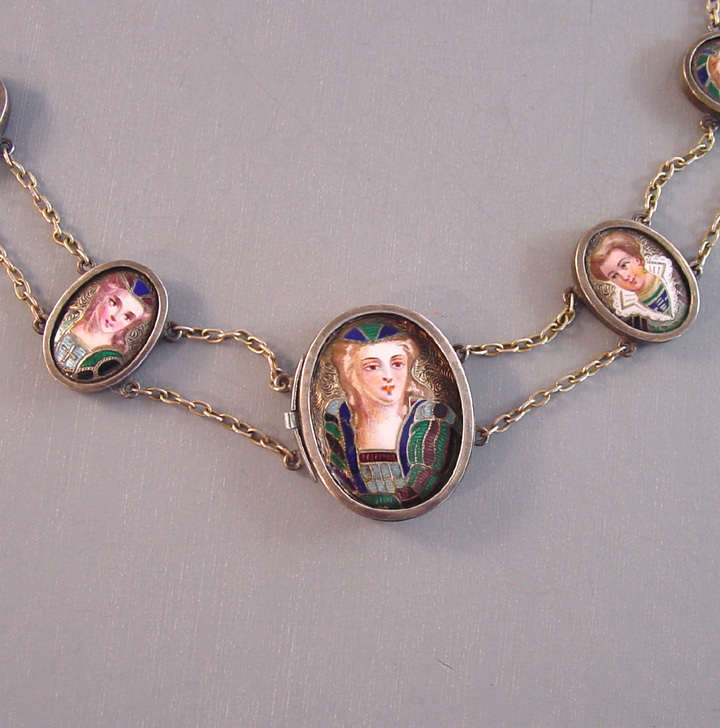 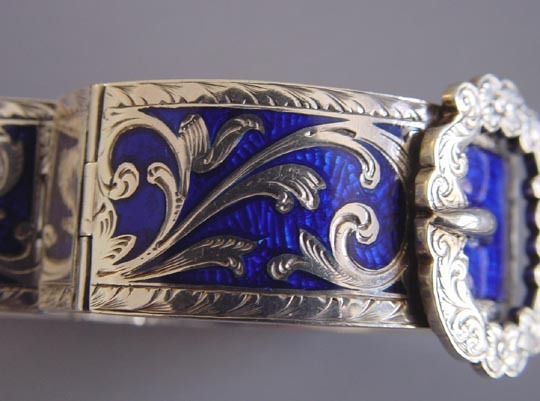 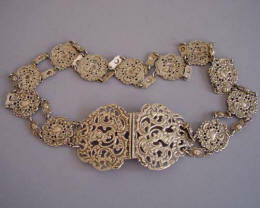 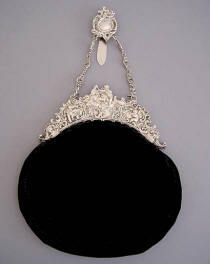 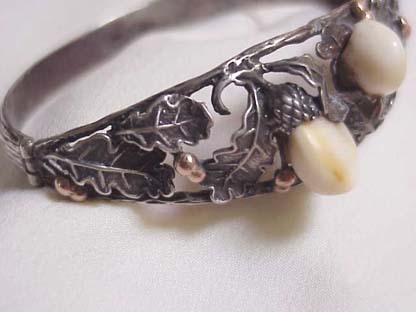 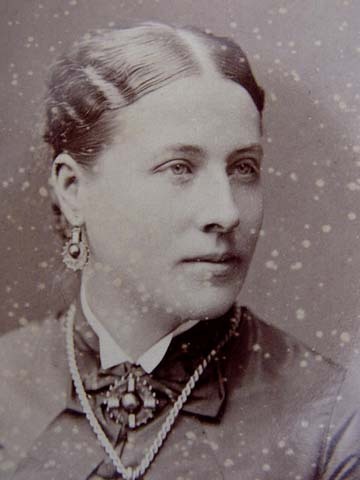 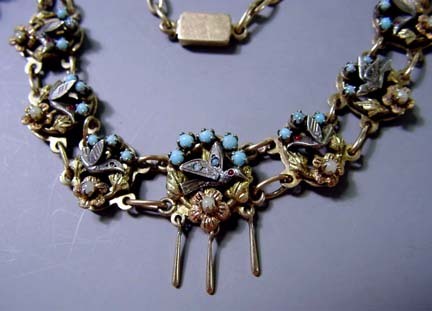 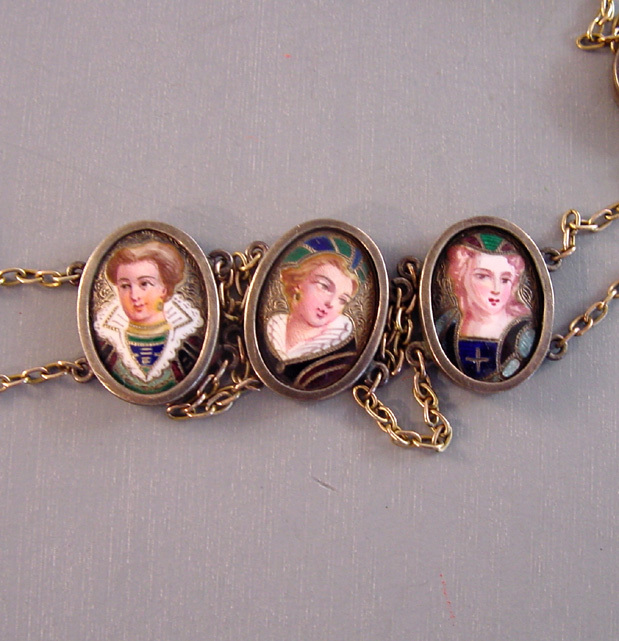 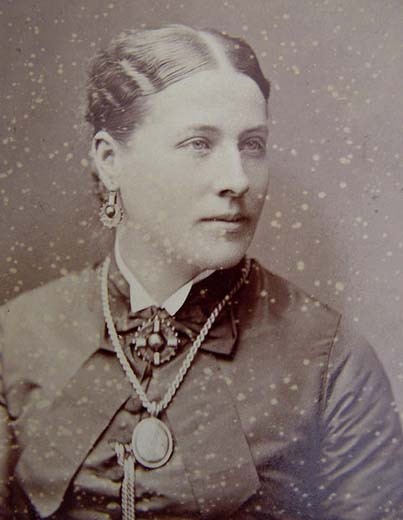 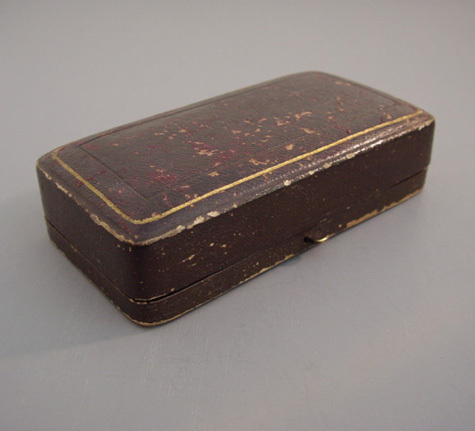 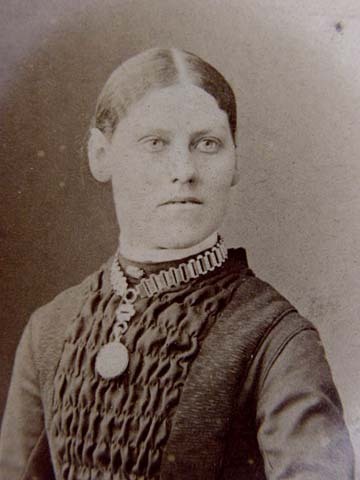 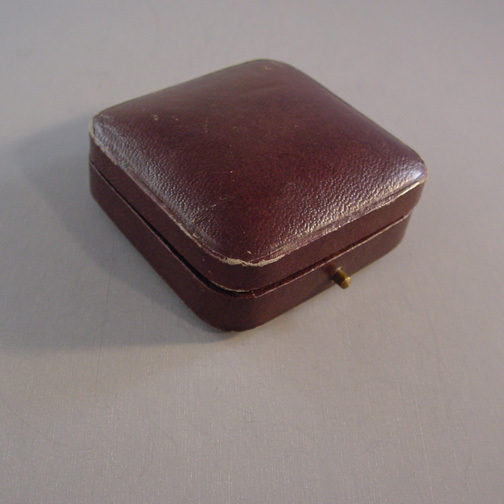 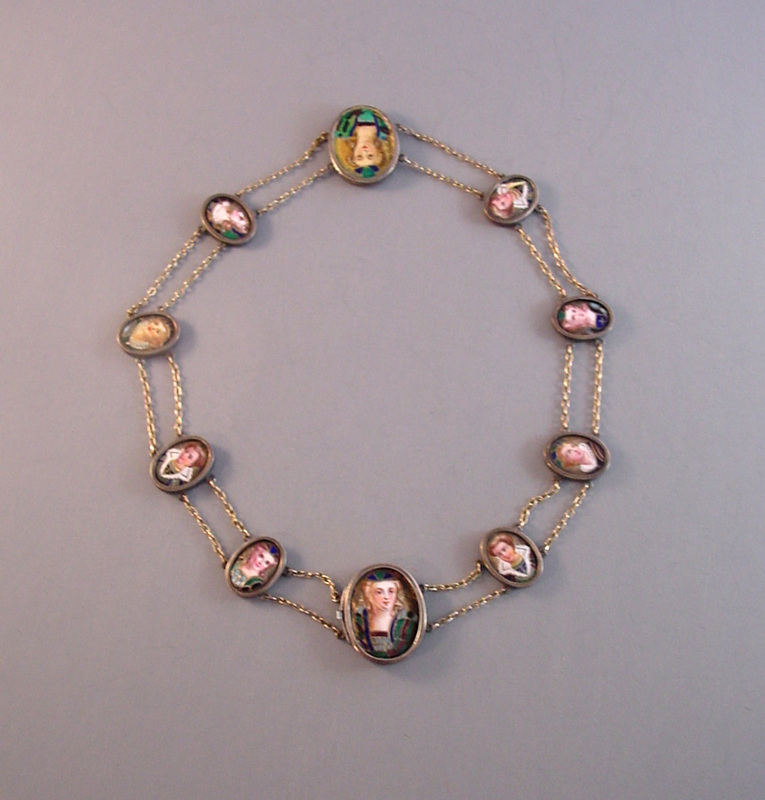 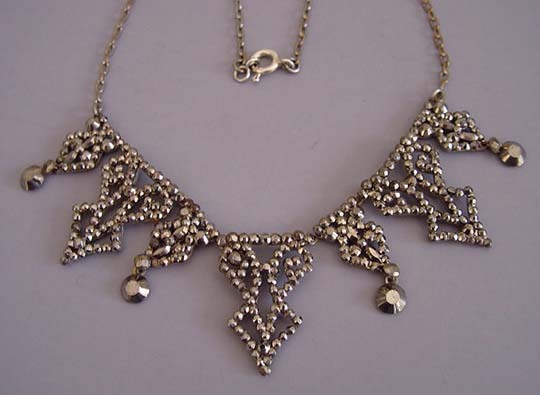 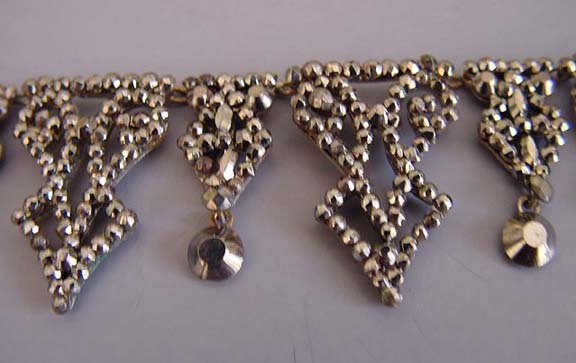 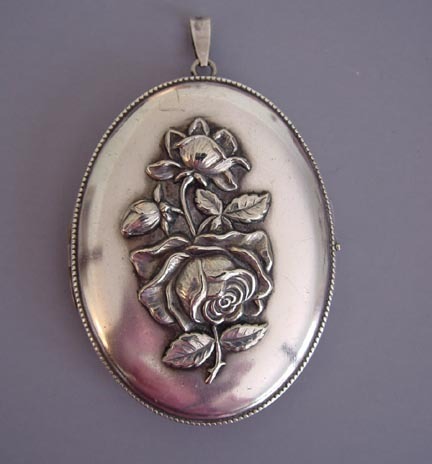 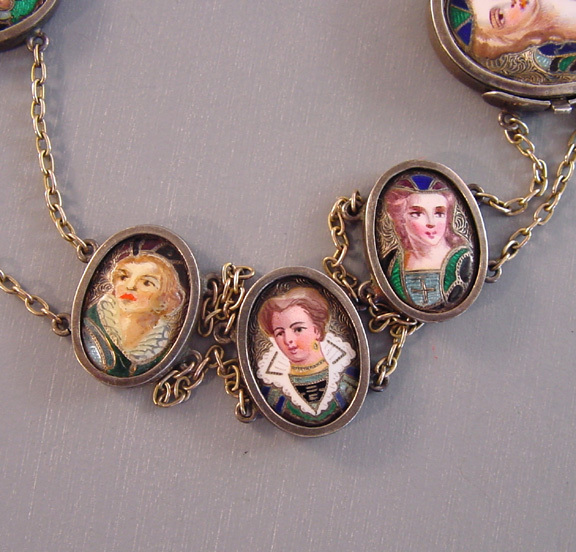 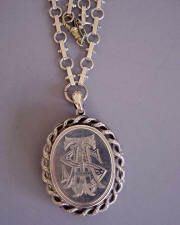 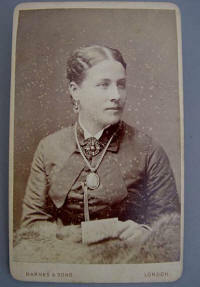 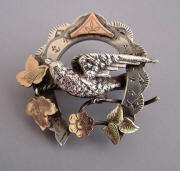 Since the Victorian era stretched over six decades, many types of jewelry came and went in vogue. 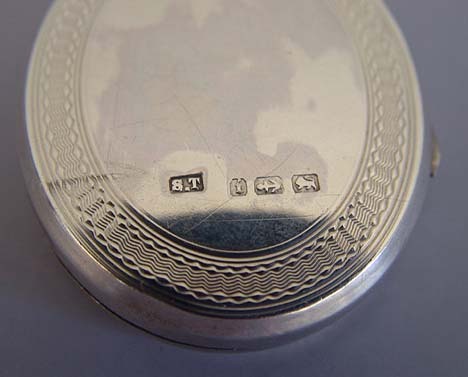 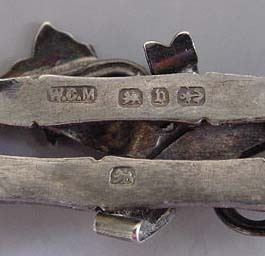 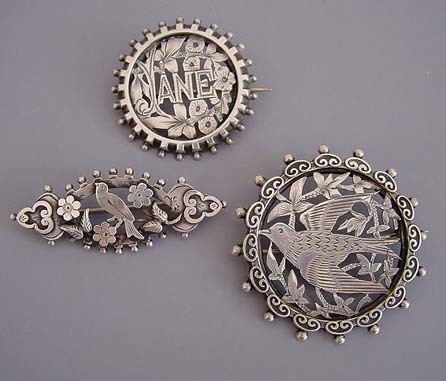 Mass production made jewelry available to the widest number of buyers in the broadest range of designs ever seen before in history. 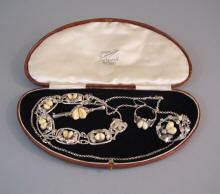 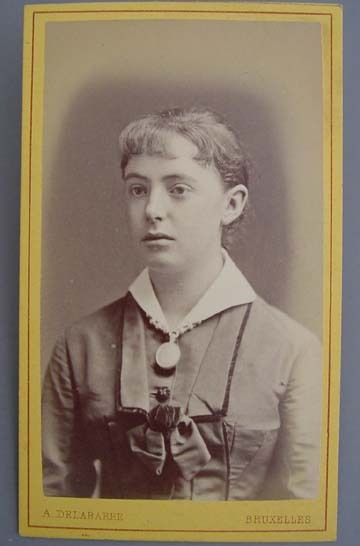 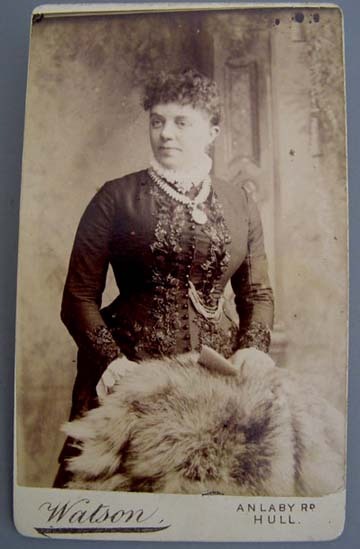 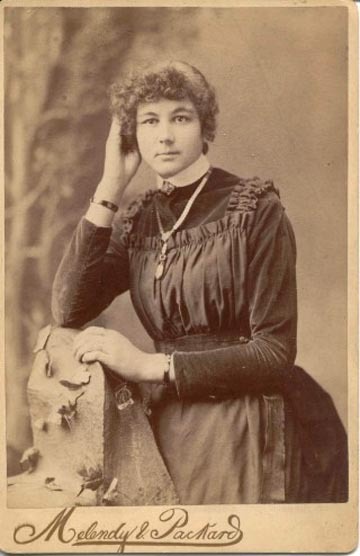 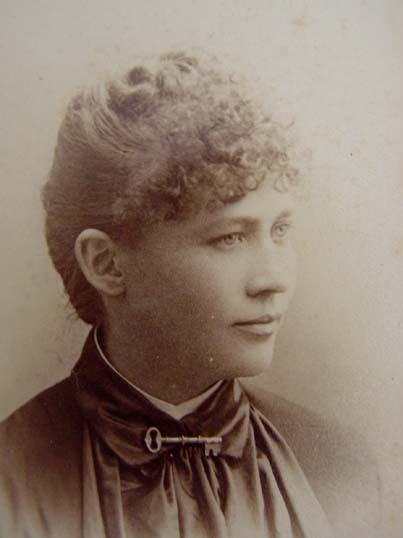 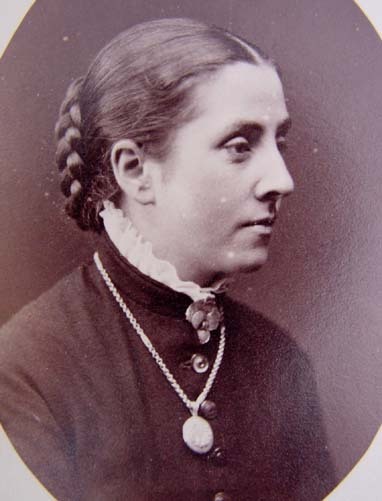 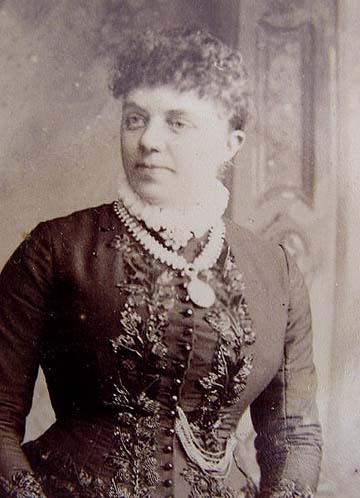 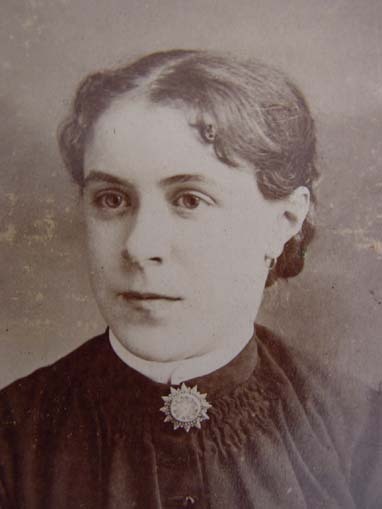 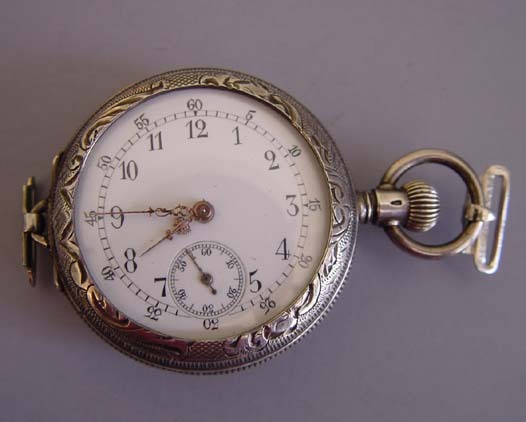 When it came to formal occasions, the "more is better" theme of the Victorian era carried over into how jewelry was worn by royalty and the aristocracy. 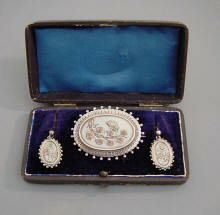 Paintings of Queen Victoria and other royals at state occasions show multiple brooches, swags, earrings, bracelets and hair ornaments. 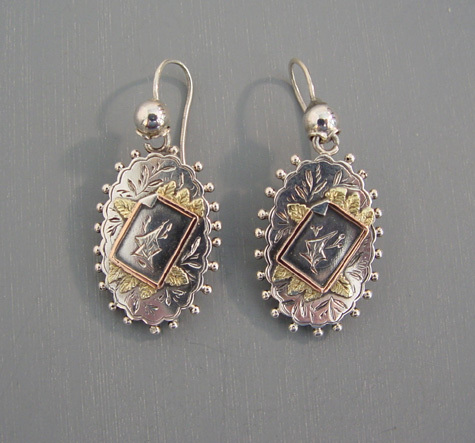 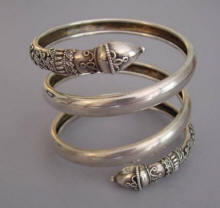 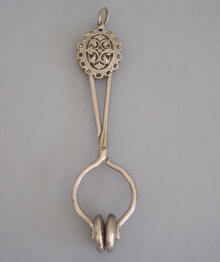 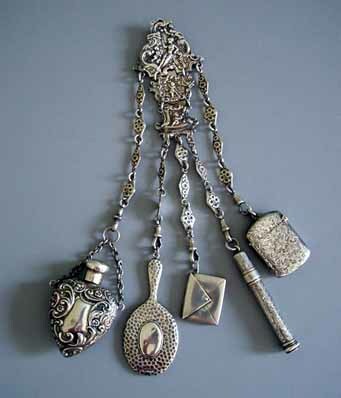 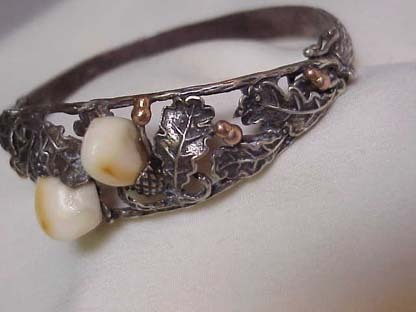 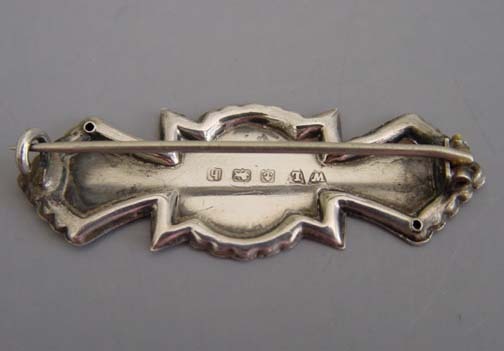 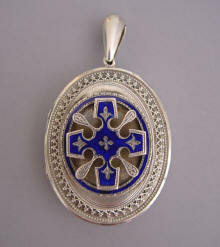 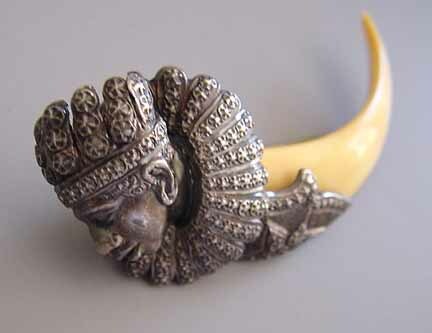 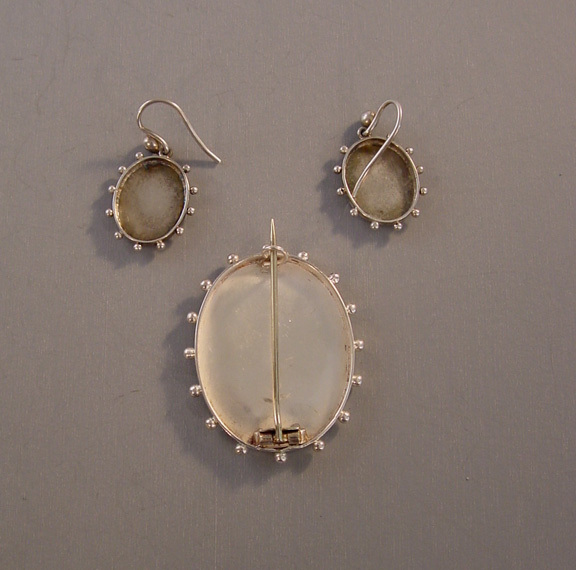 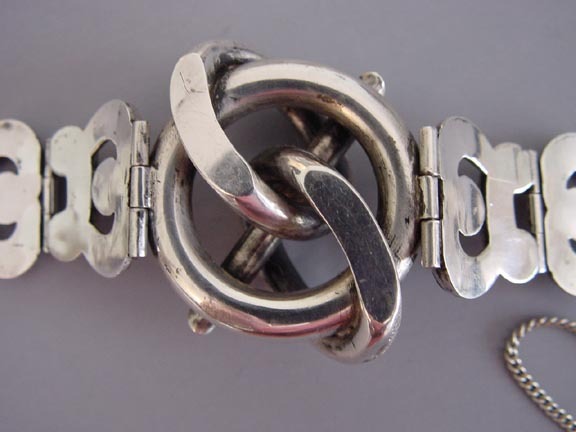 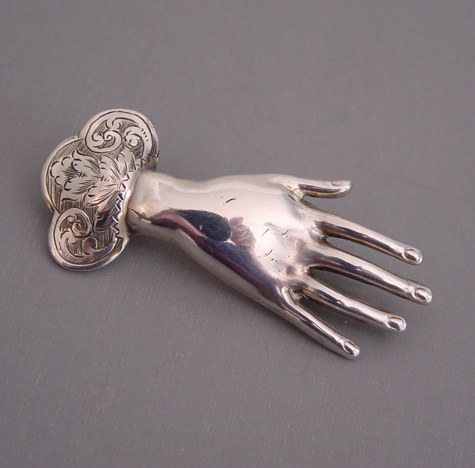 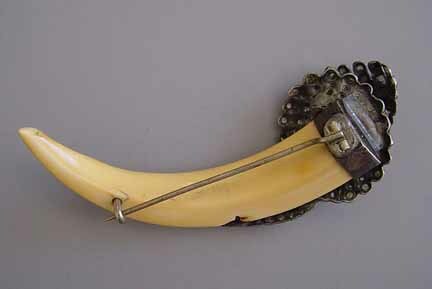 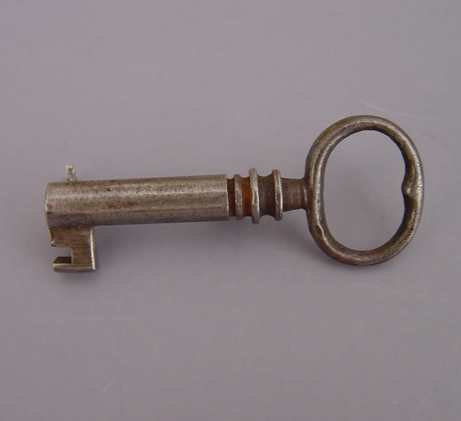 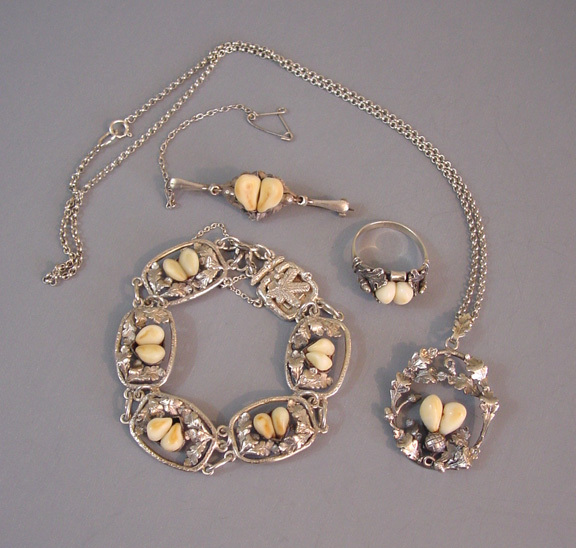 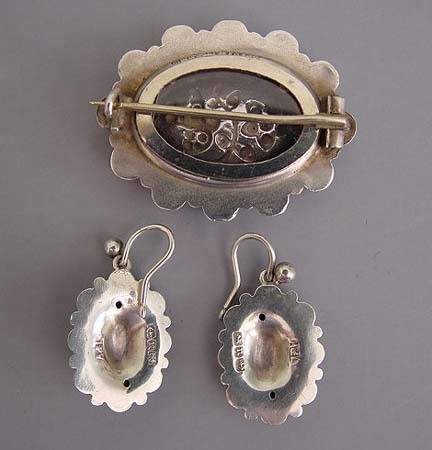 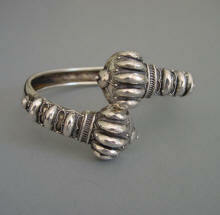 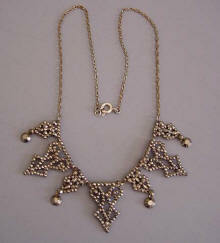 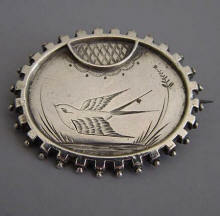 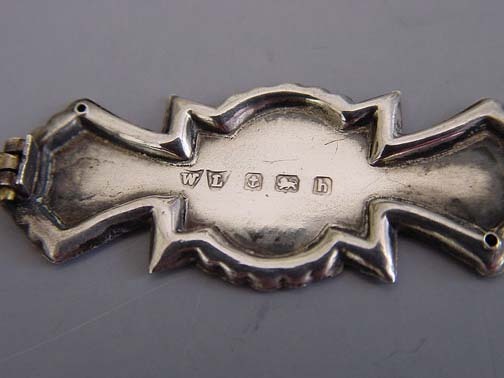 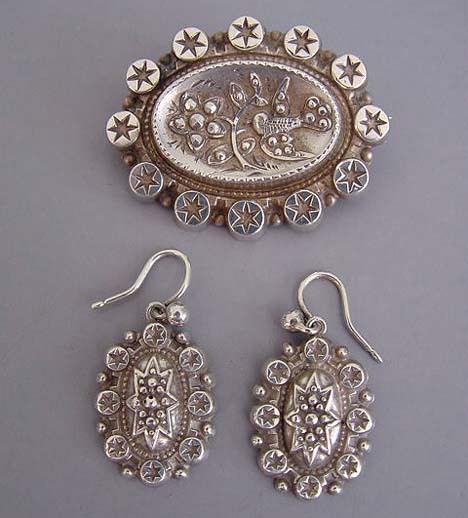 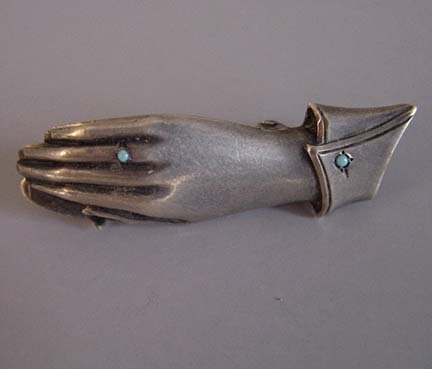 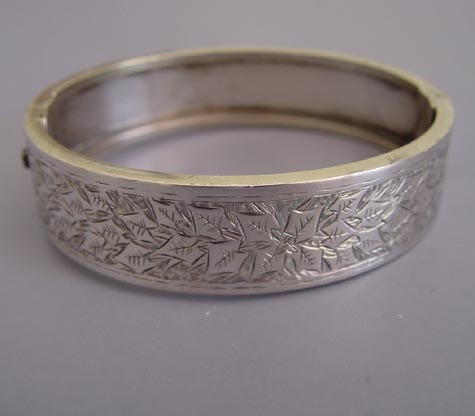 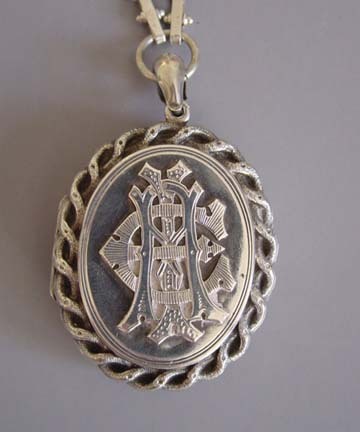 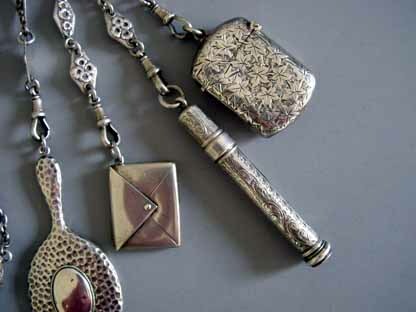 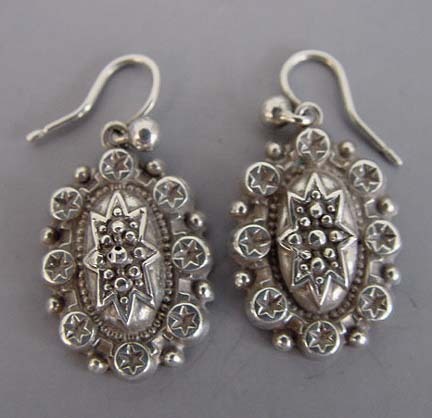 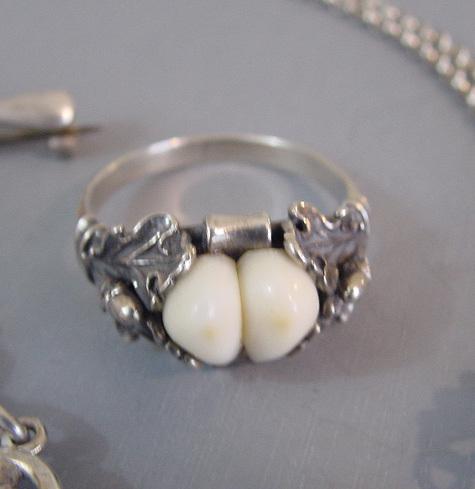 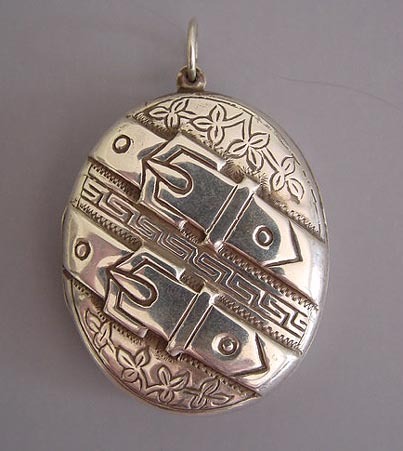 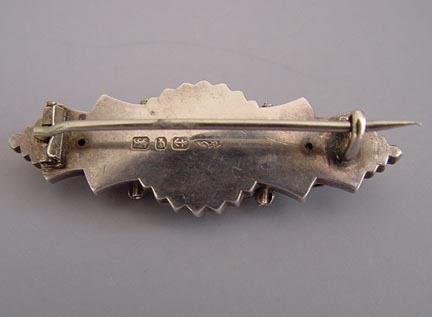 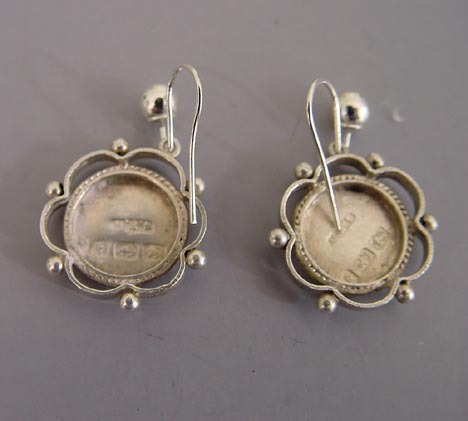 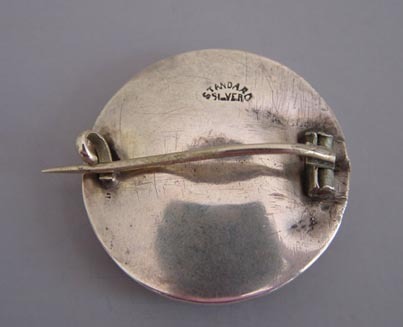 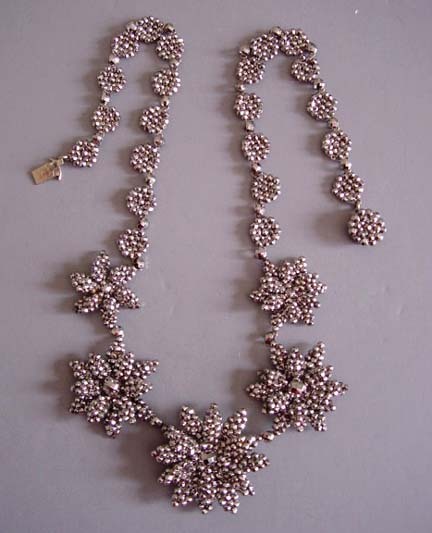 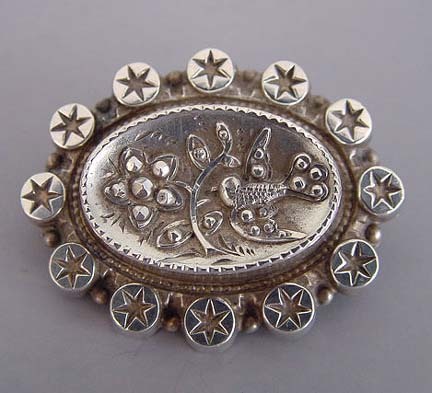 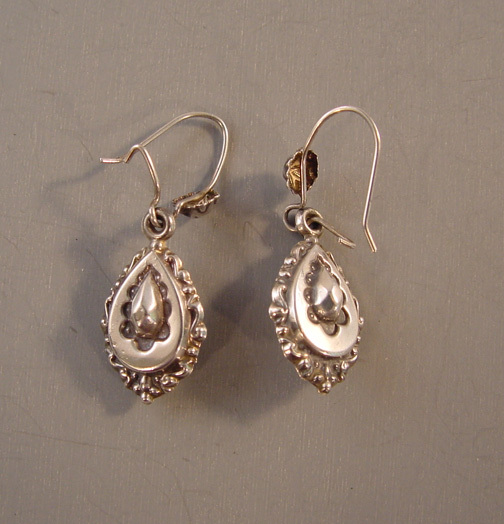 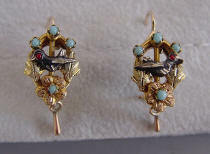 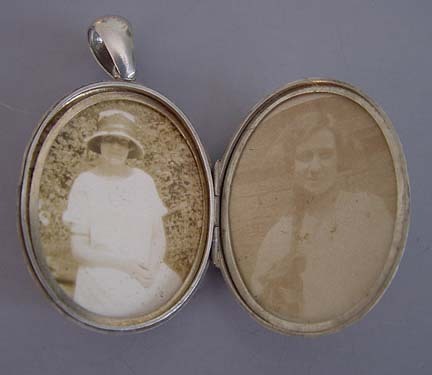 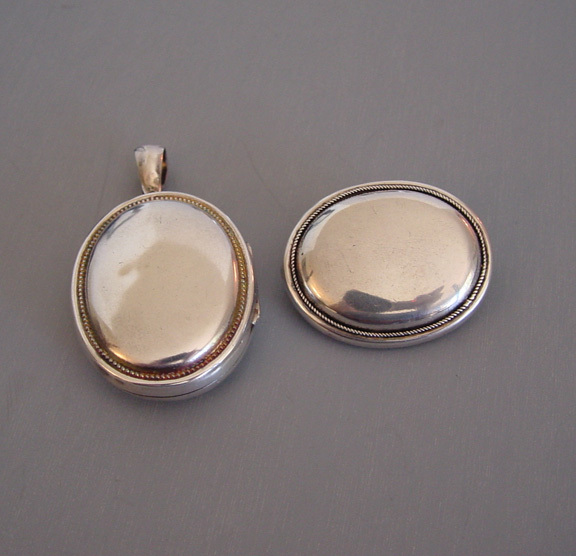 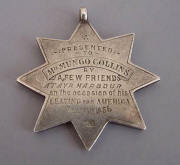 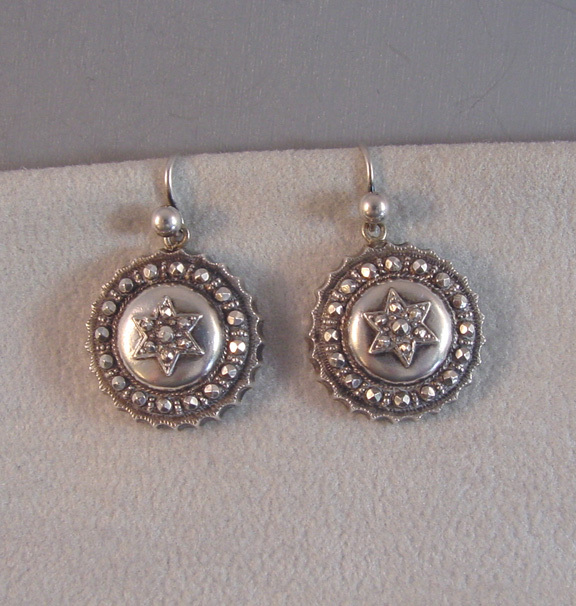 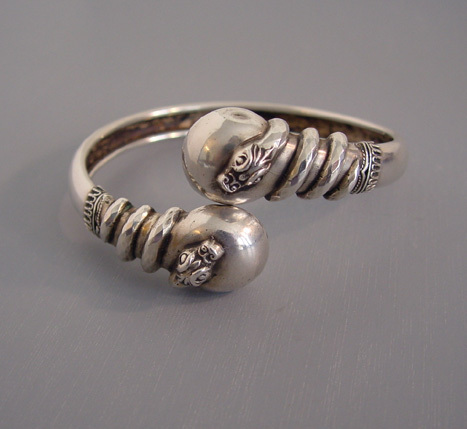 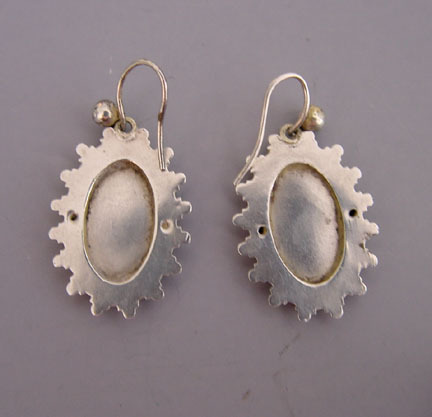 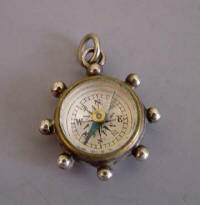 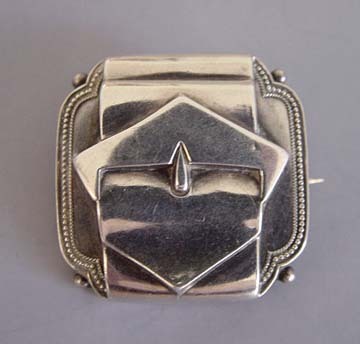 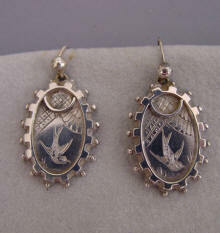 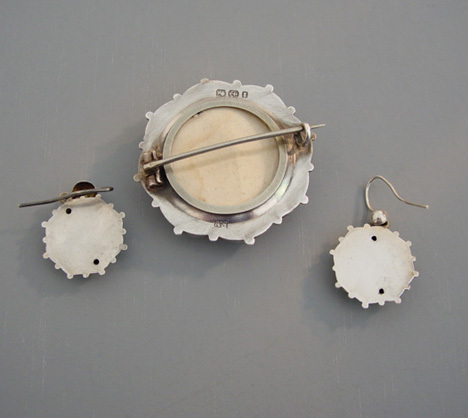 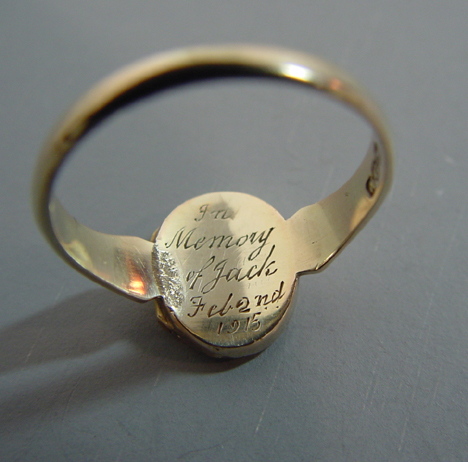 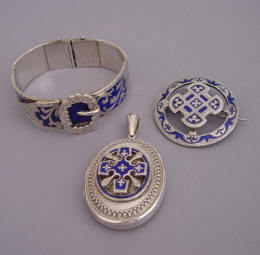 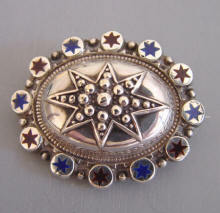 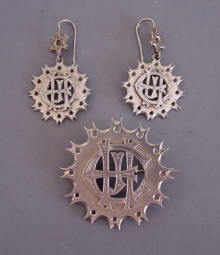 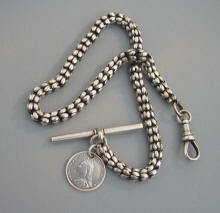 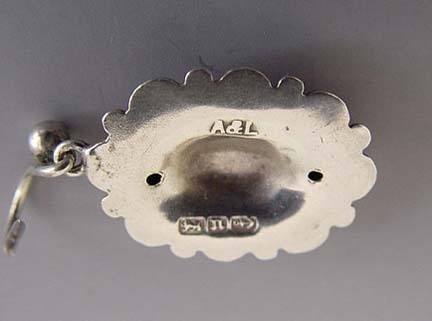 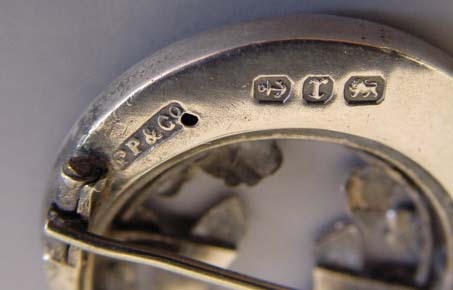 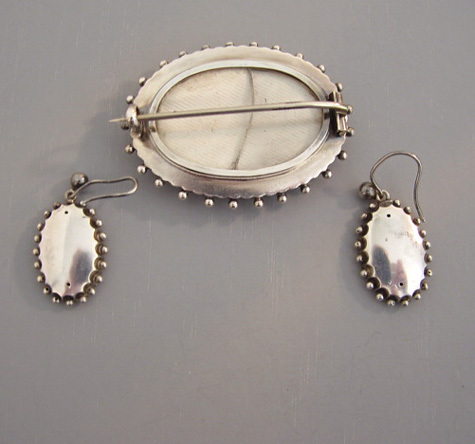 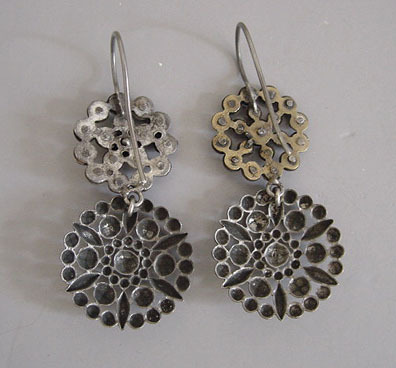 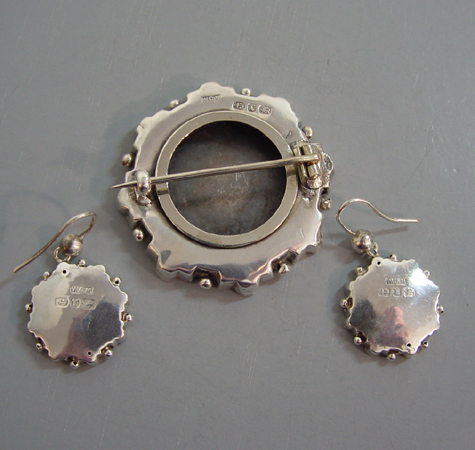 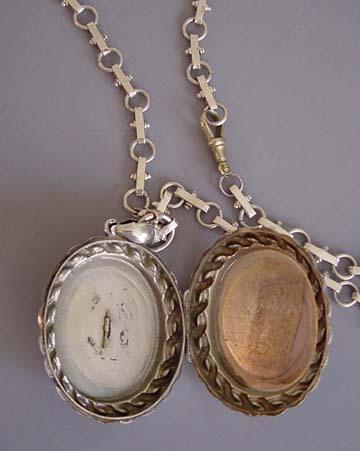 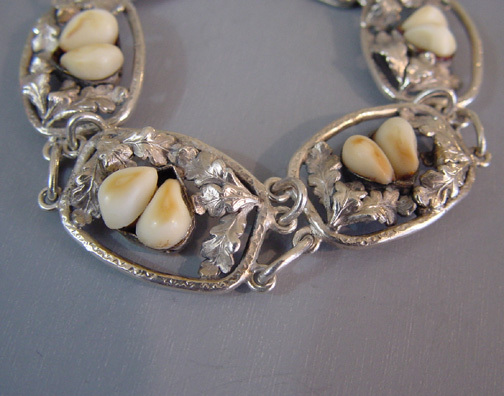 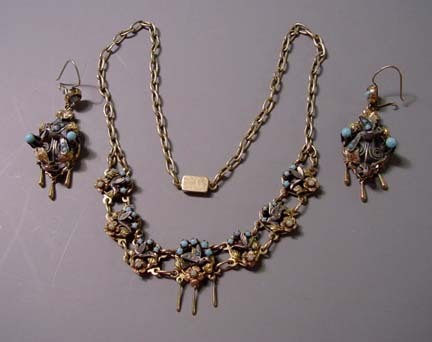 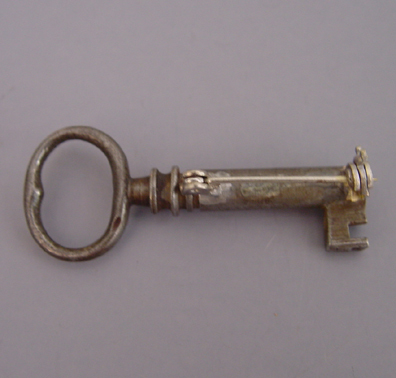 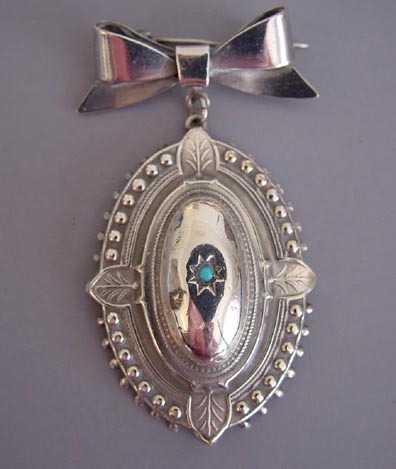 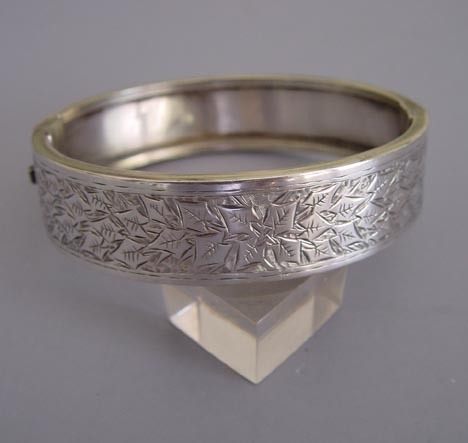 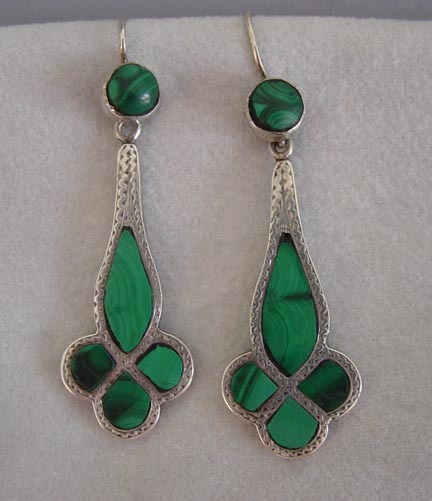 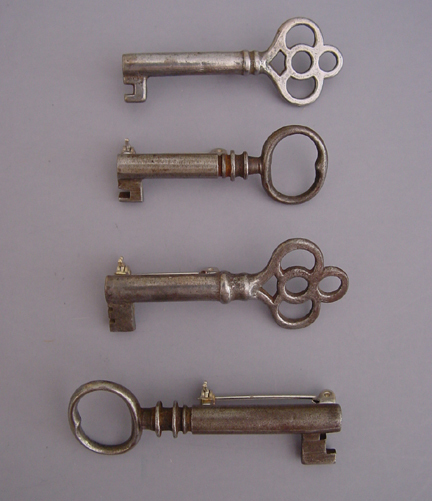 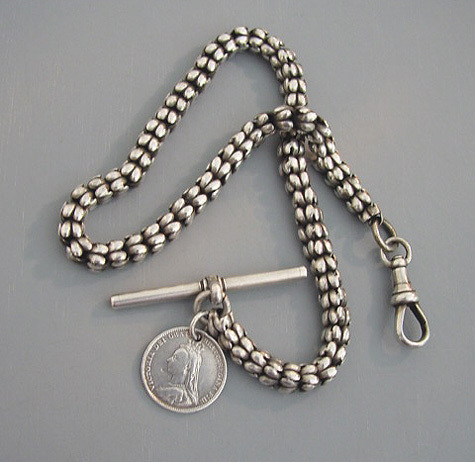 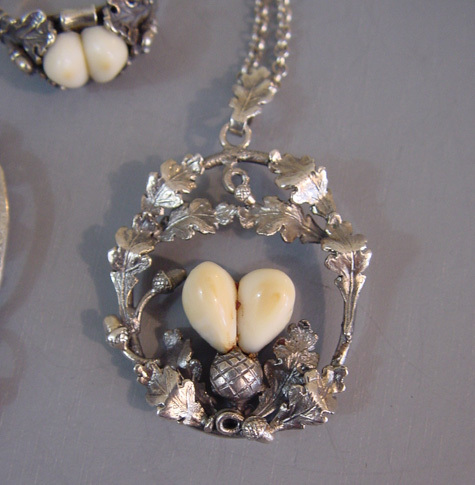 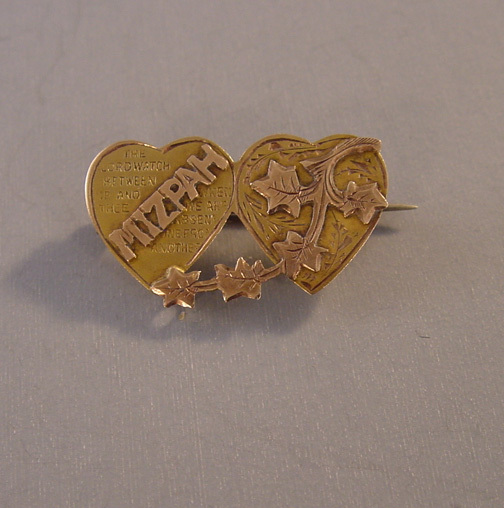 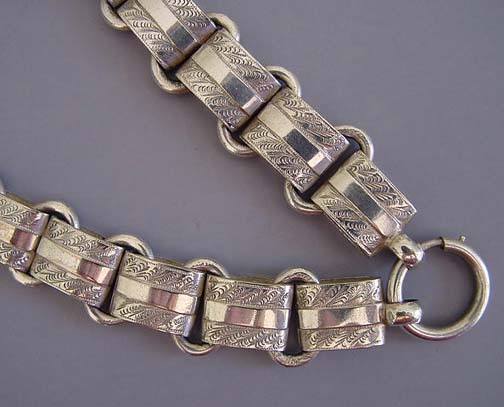 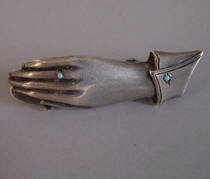 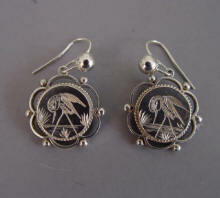 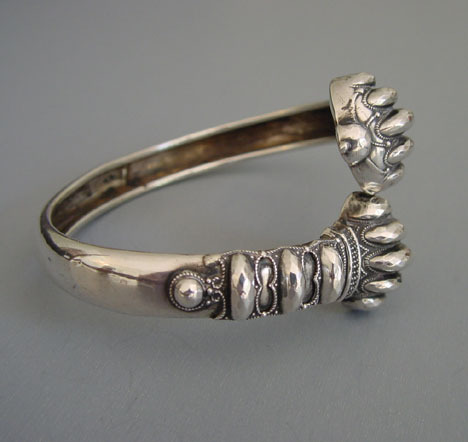 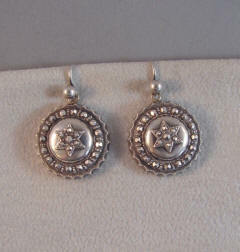 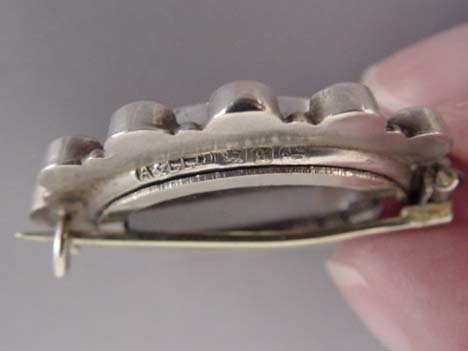 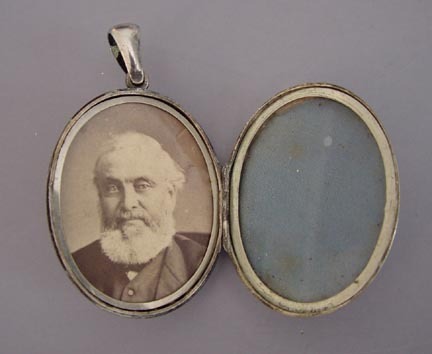 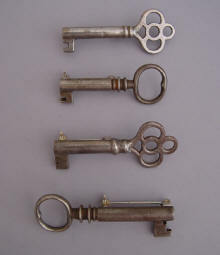 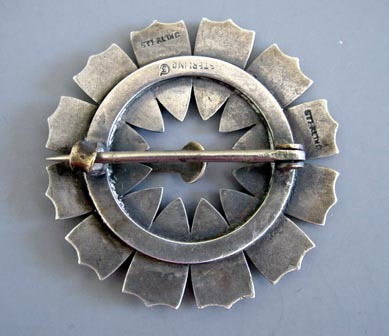 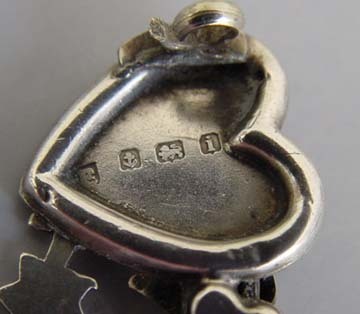 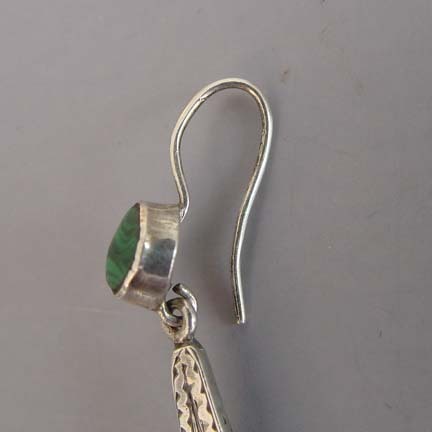 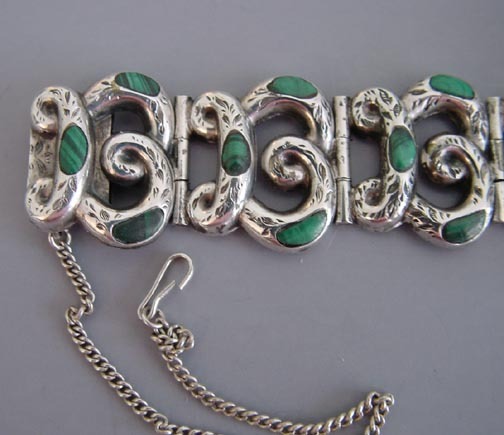 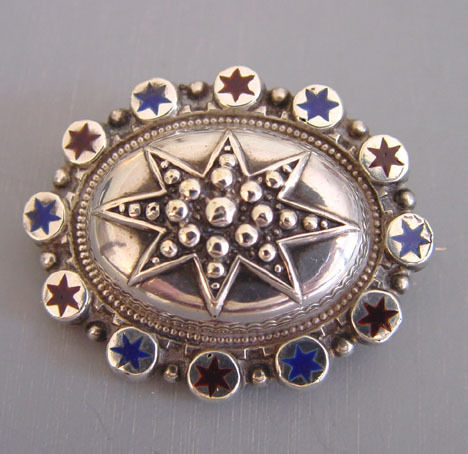 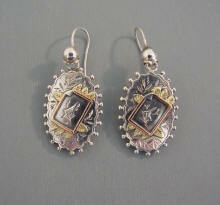 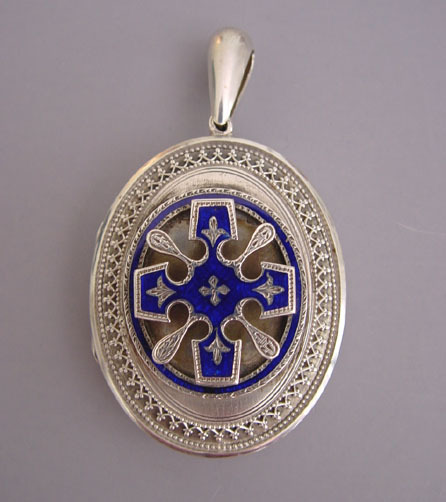 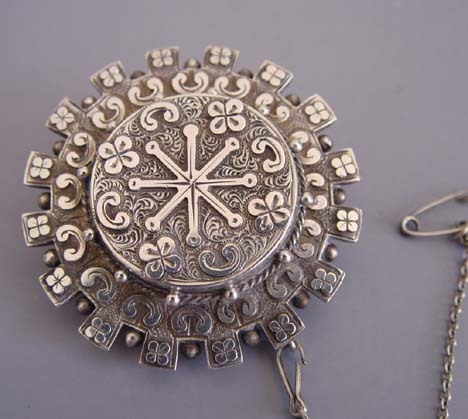 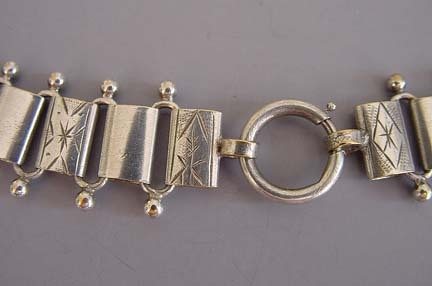 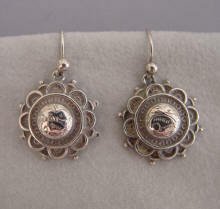 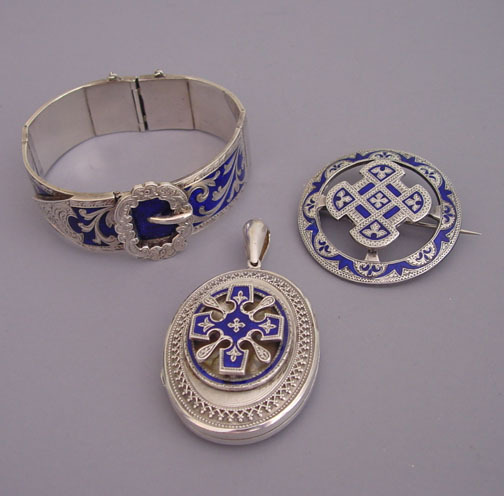 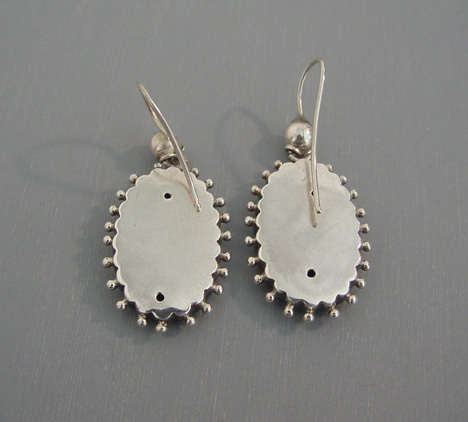 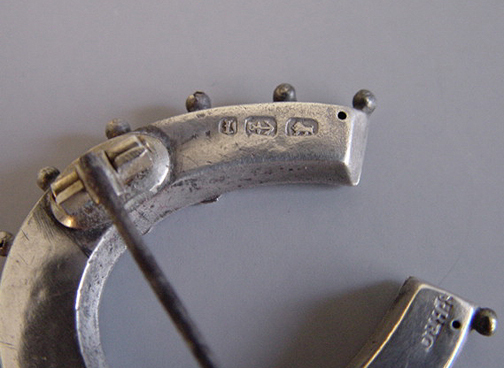 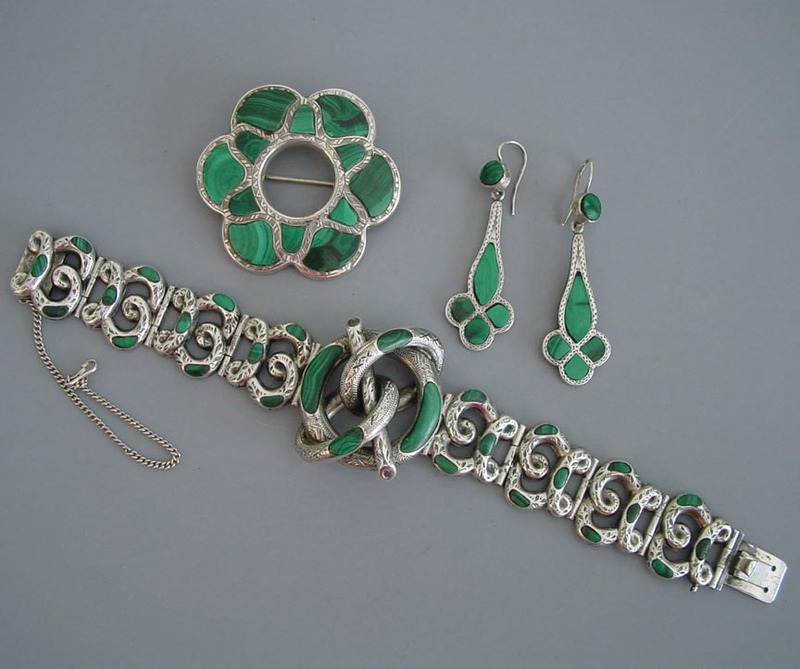 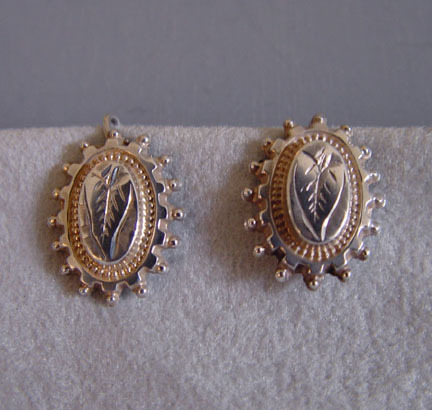 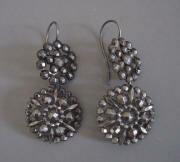 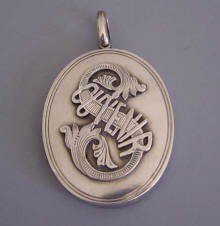 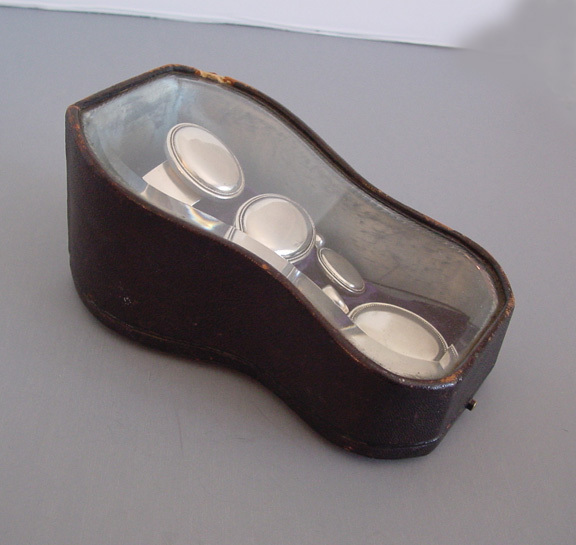 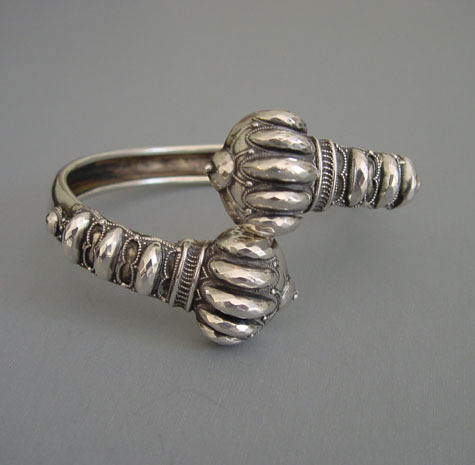 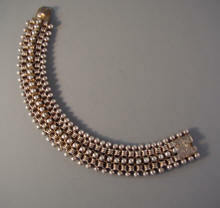 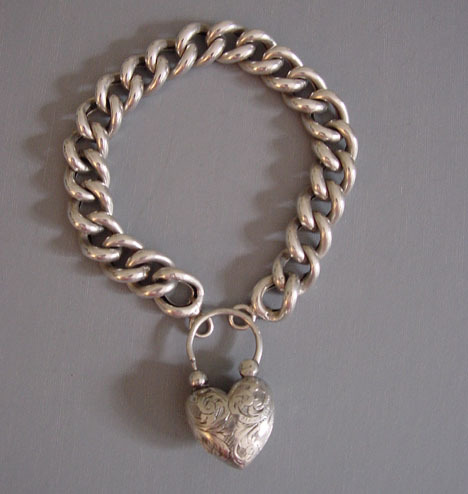 But the jewelry of the everyday folk is collectible, fascinating and a lesson in history that enchants us even today. 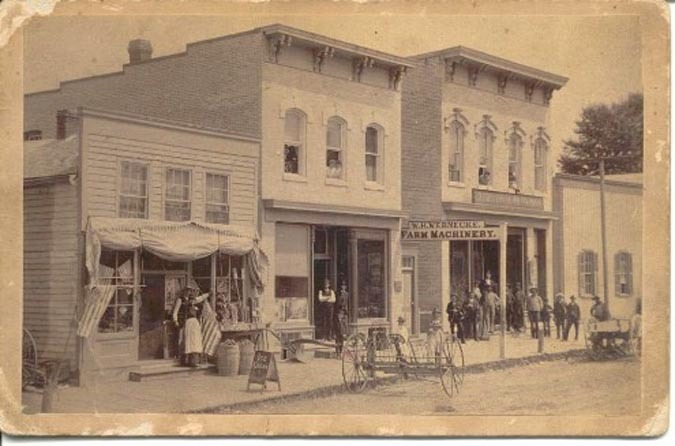 Says Bobye, "The store with the flags and the false front belonged to my grandparents and they are standing in front of it. 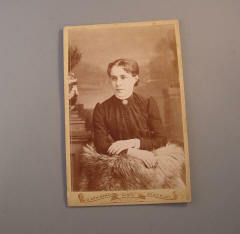 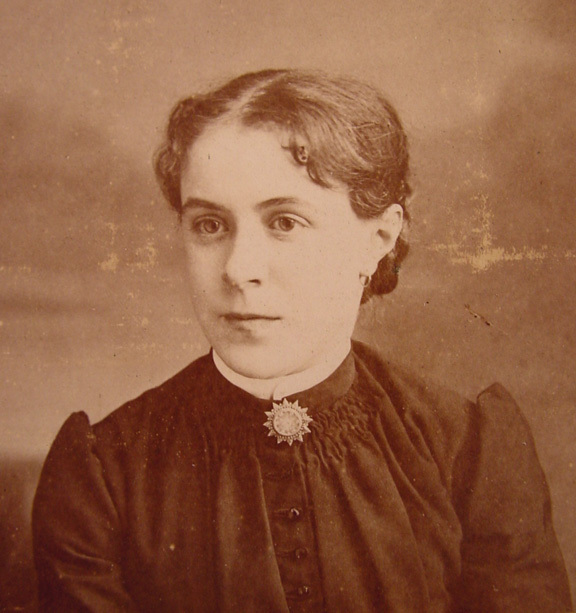 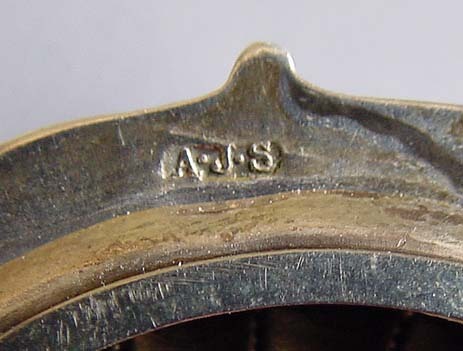 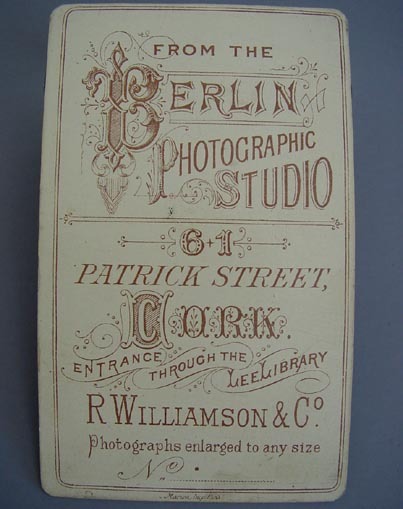 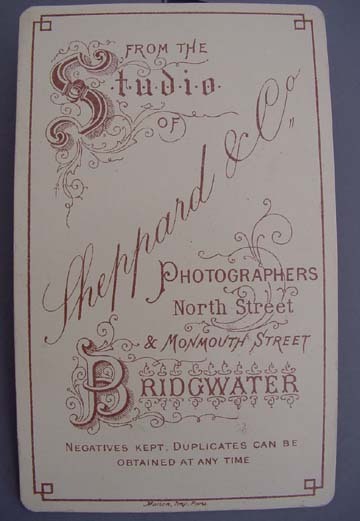 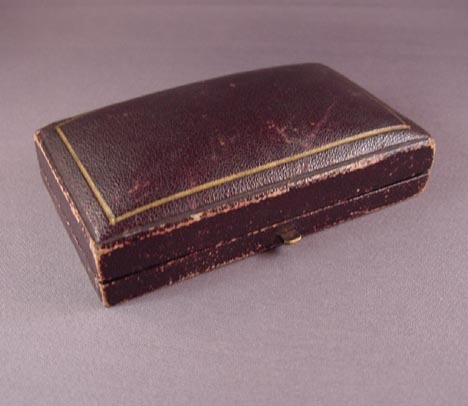 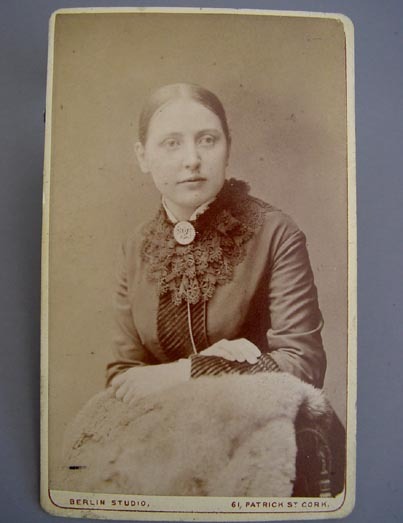 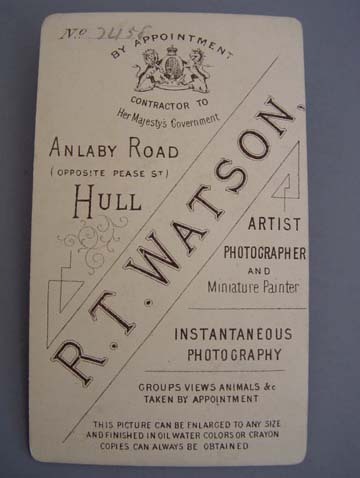 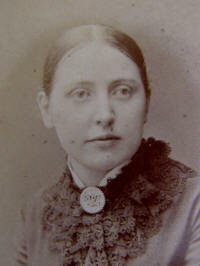 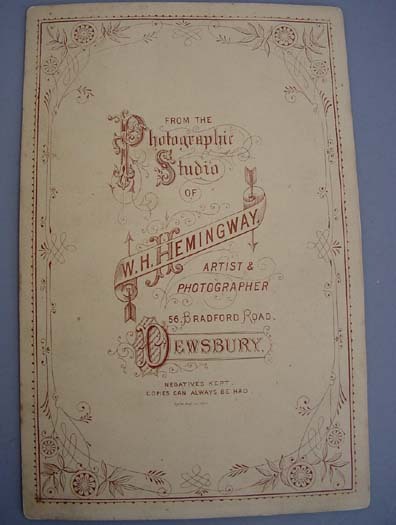 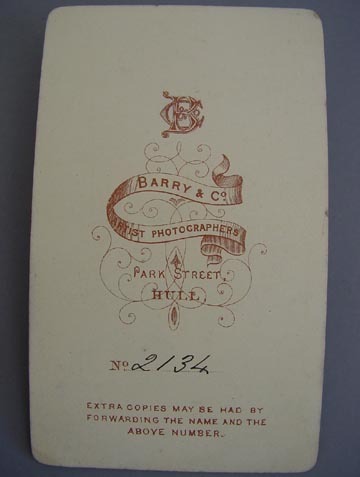 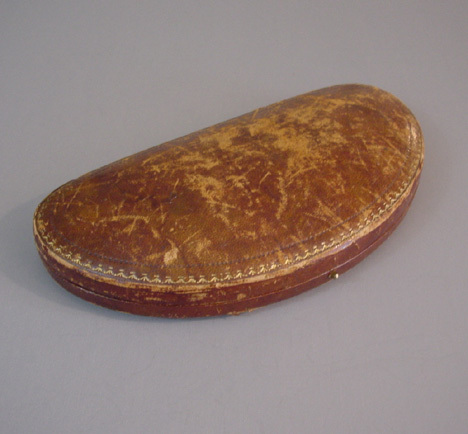 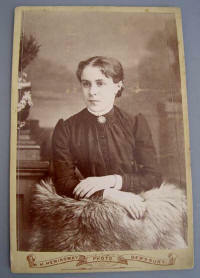 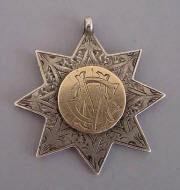 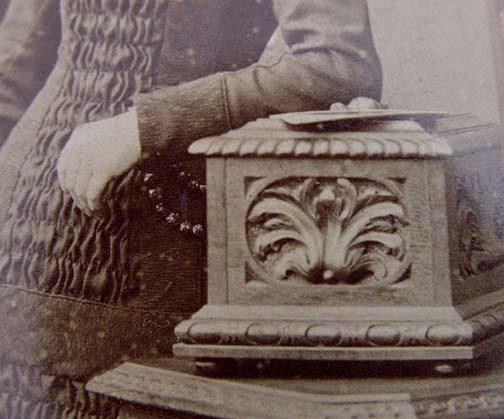 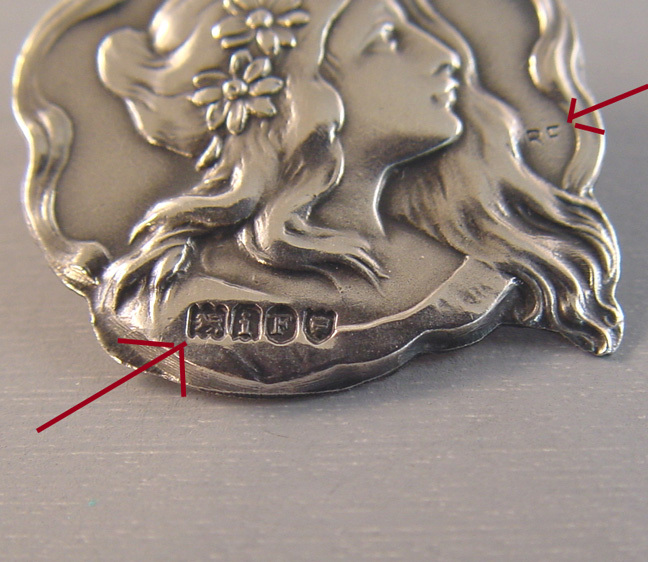 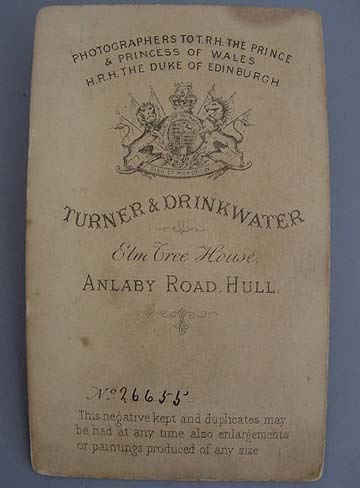 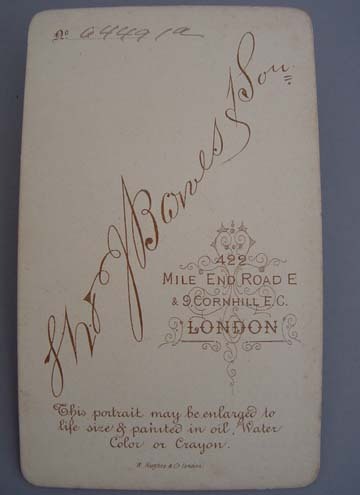 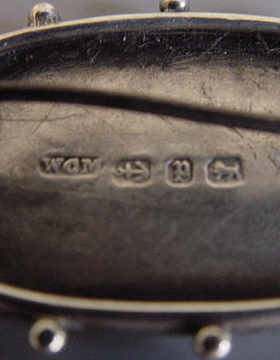 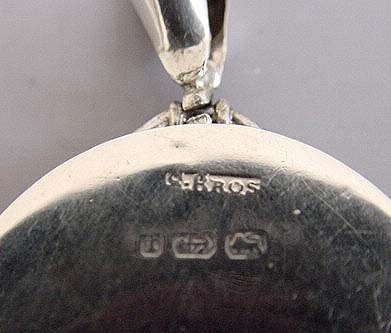 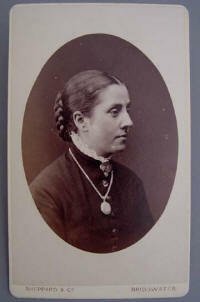 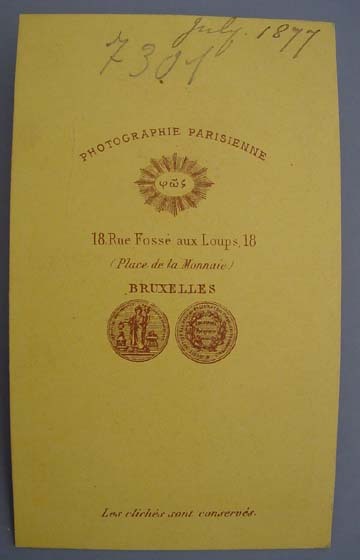 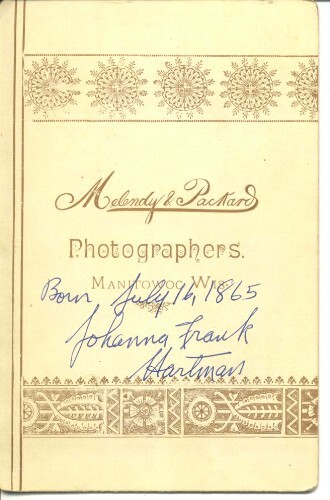 It is dated on the back July 1886 but the writing is very faint. 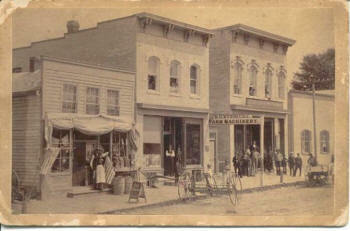 This was in Manitowoc, Wisconsin. Notice the ladies looking out the second floor windows." 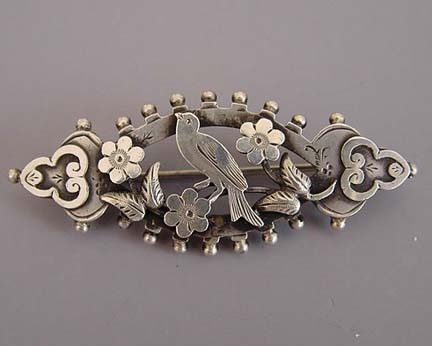 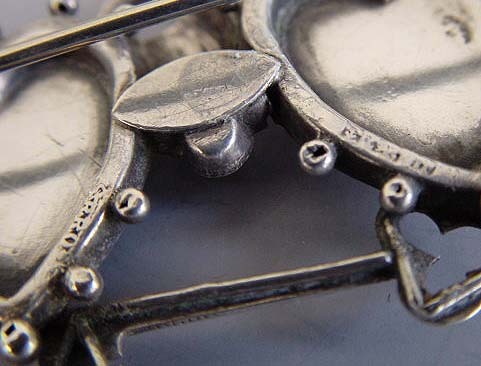 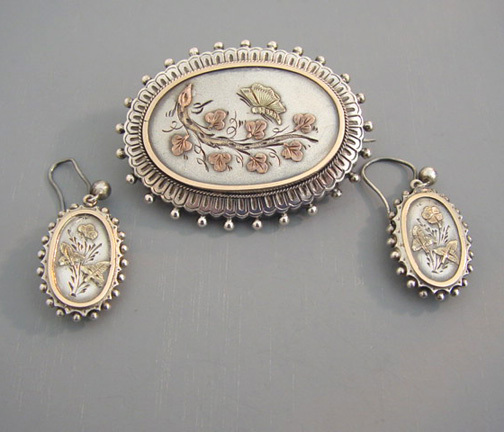 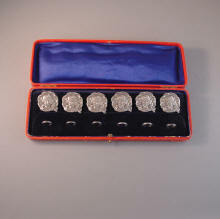 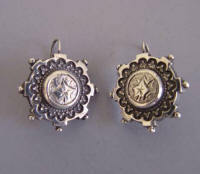 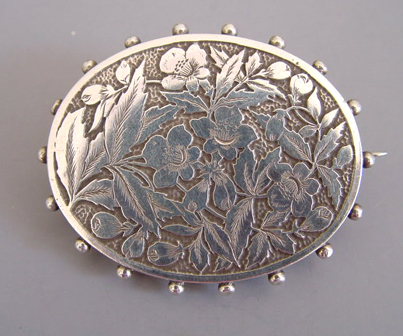 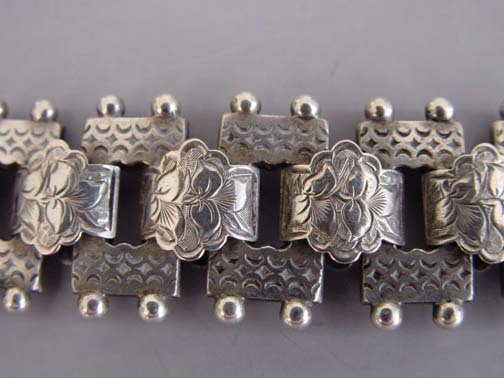 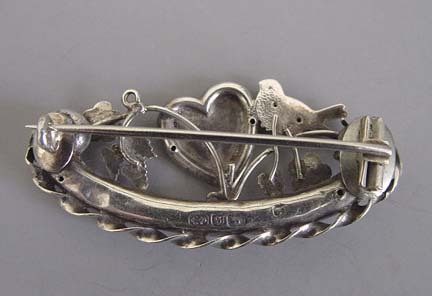 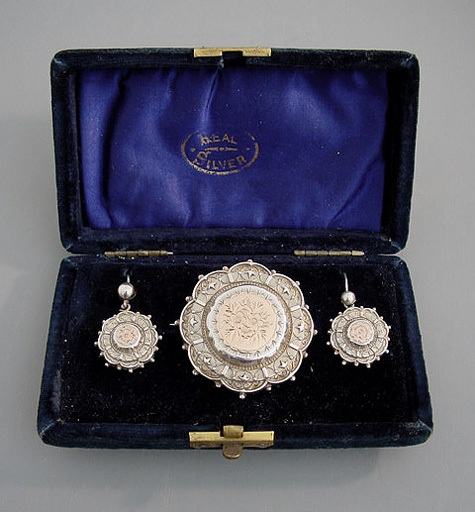 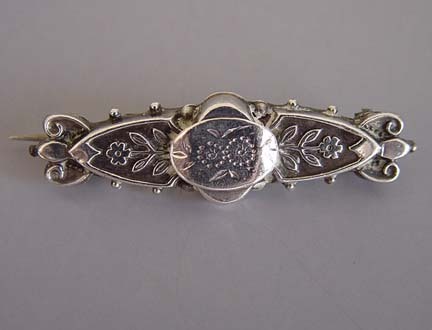 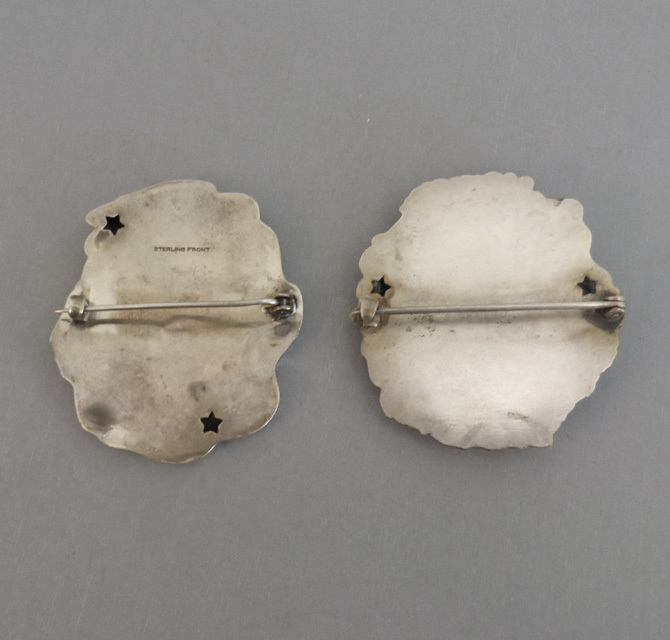 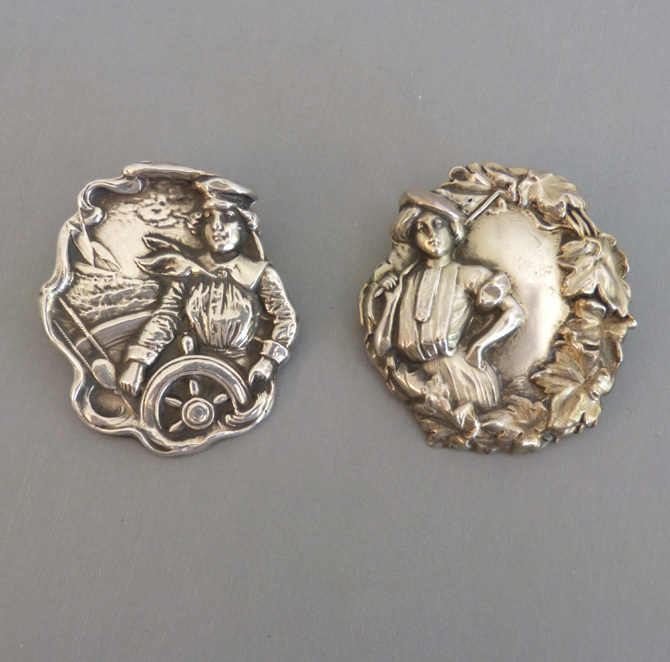 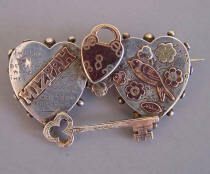 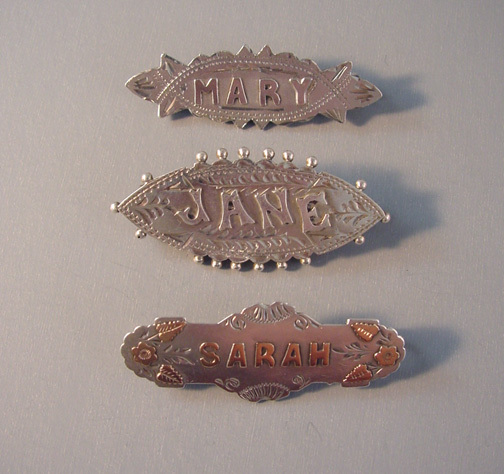 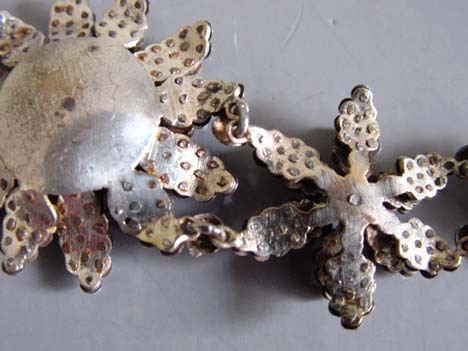 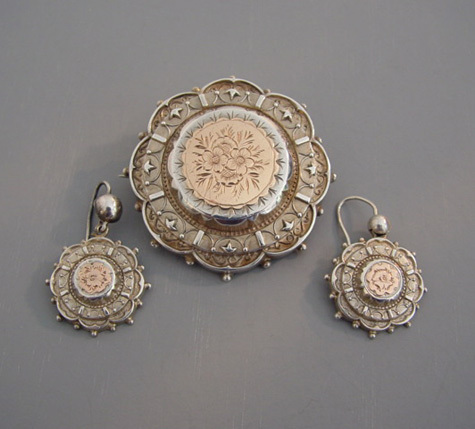 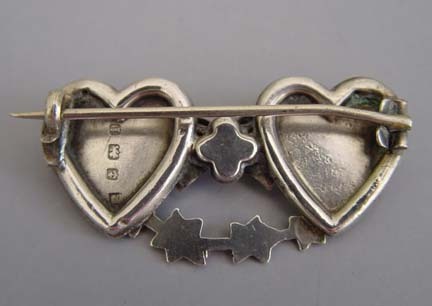 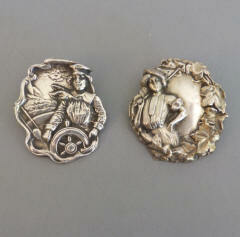 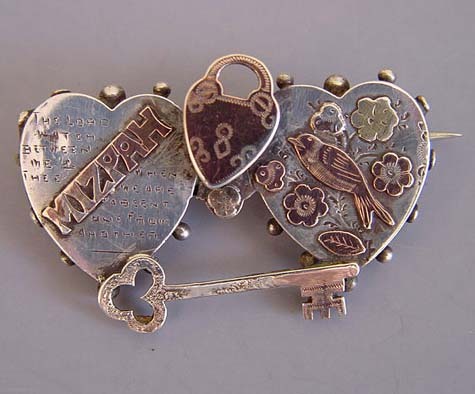 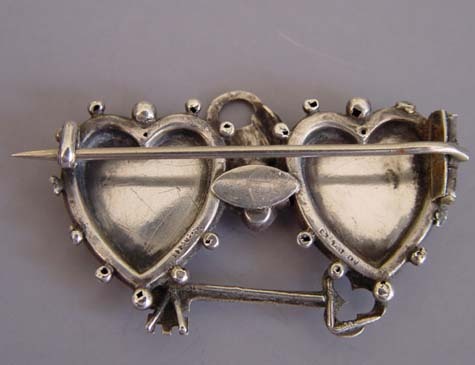 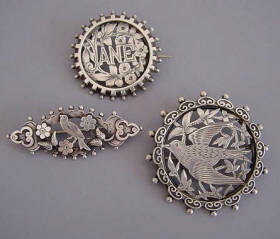 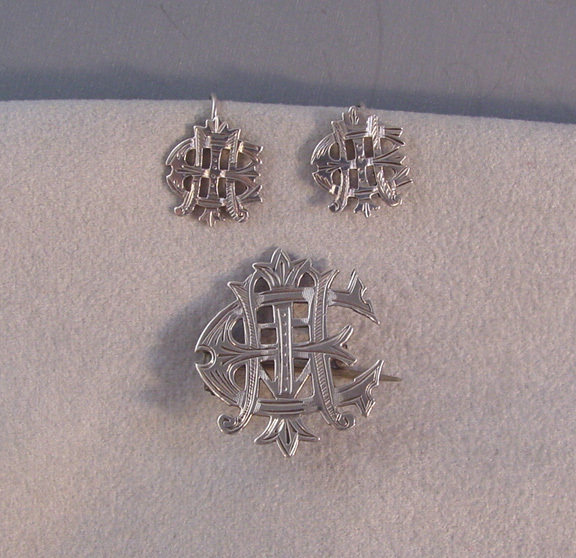 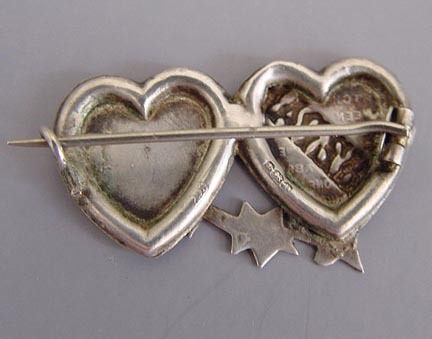 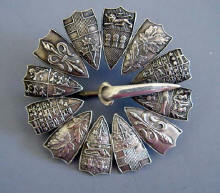 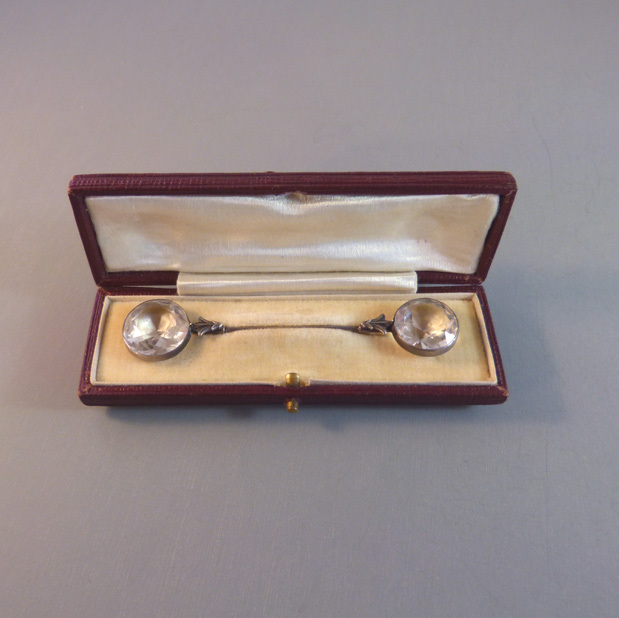 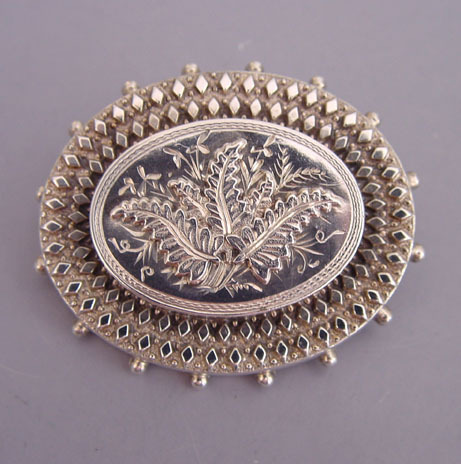 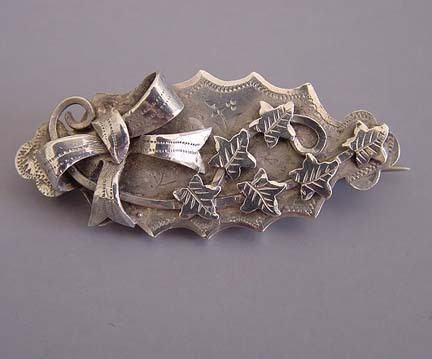 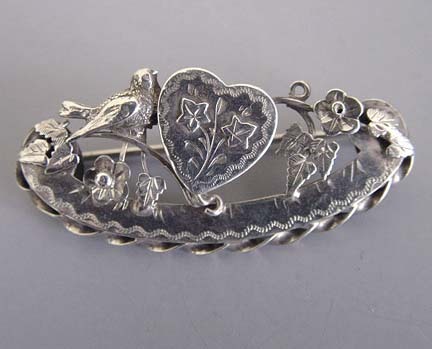 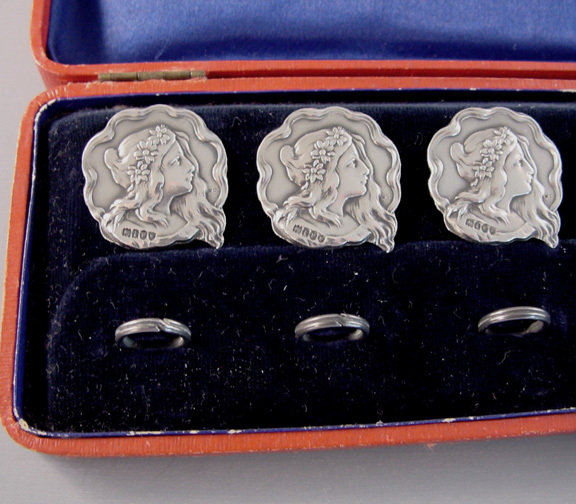 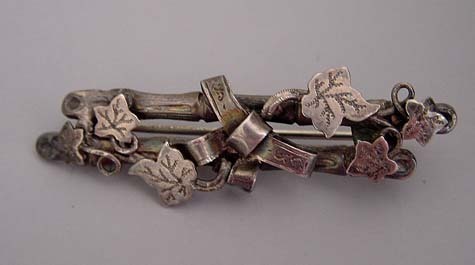 VICTORIAN silver brooches can look terrific worn in groups, these are circa 1880-1890. 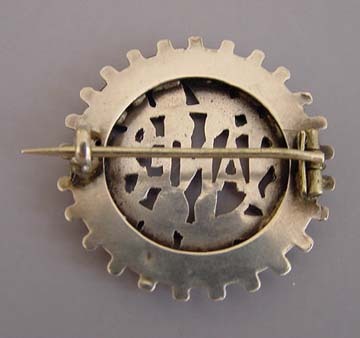 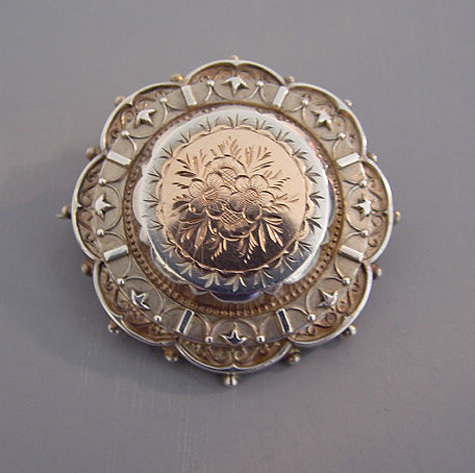 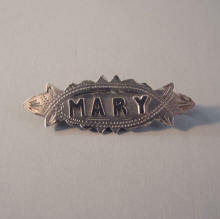 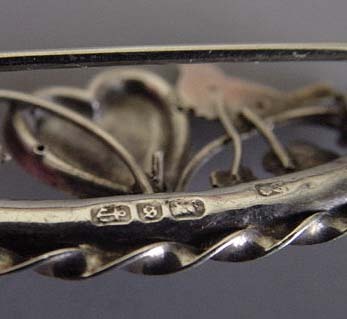 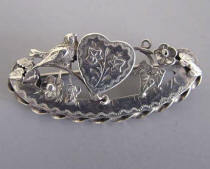 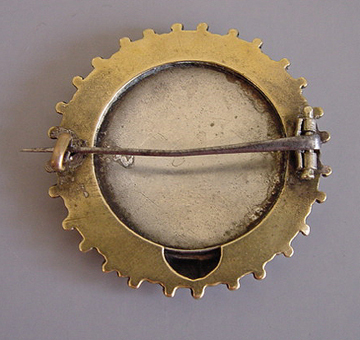 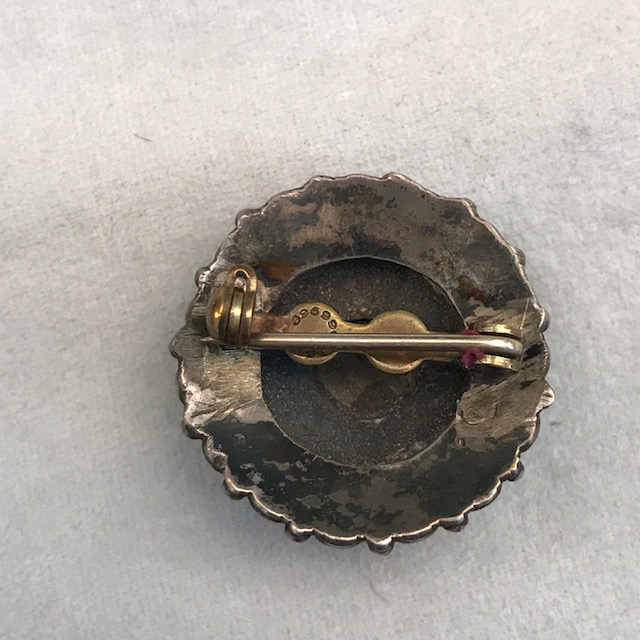 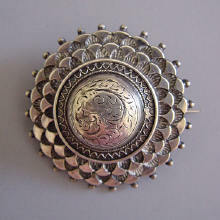 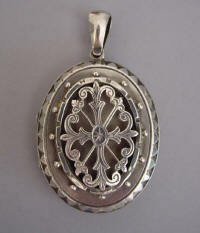 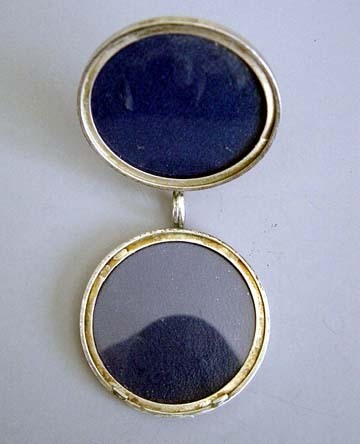 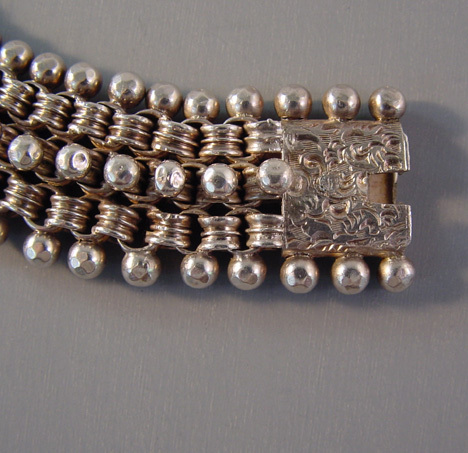 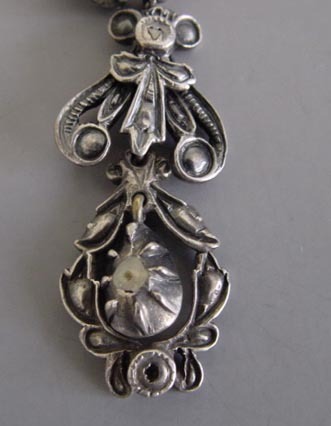 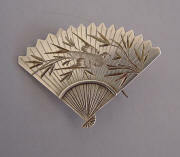 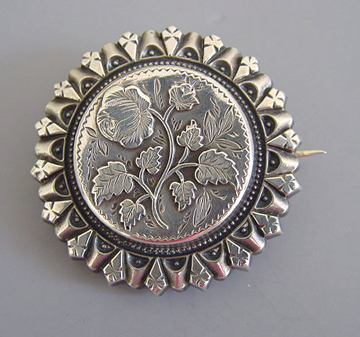 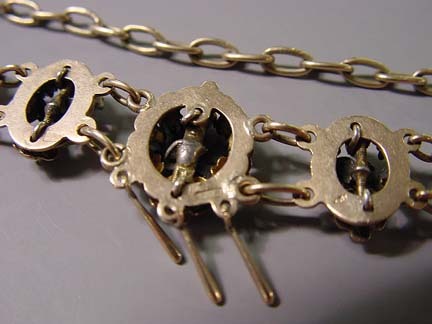 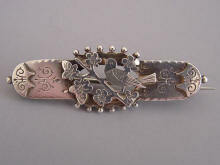 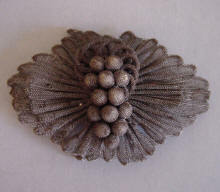 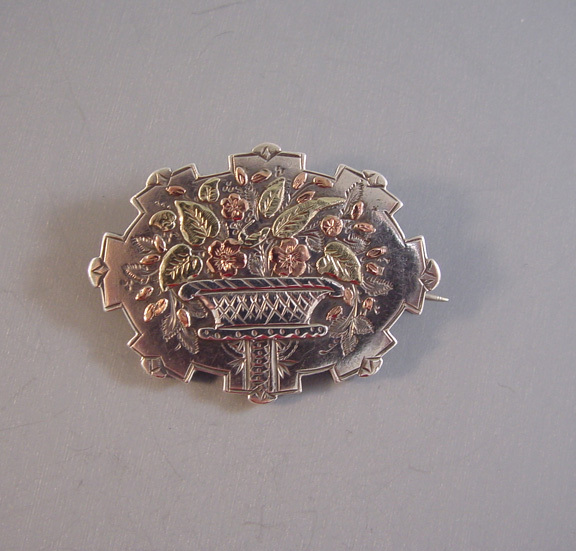 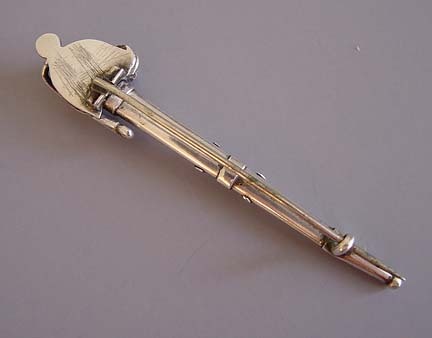 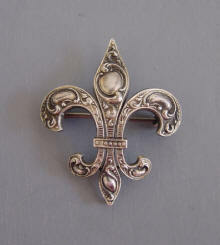 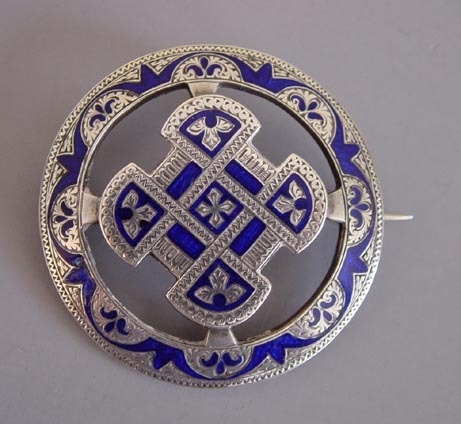 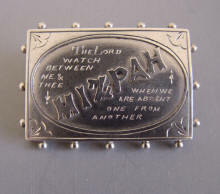 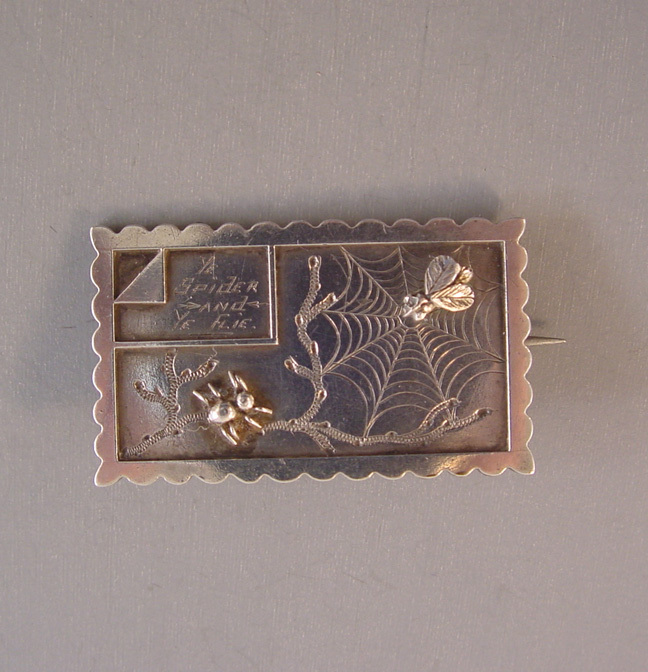 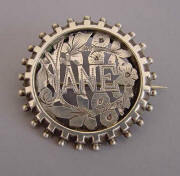 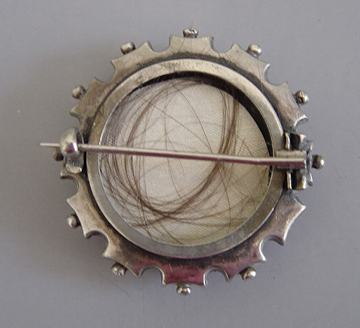 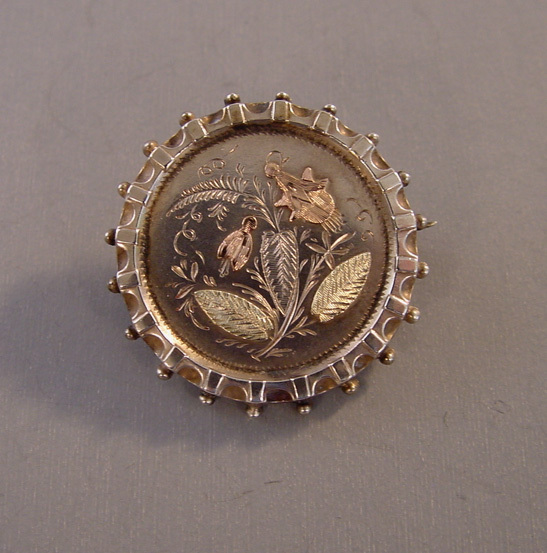 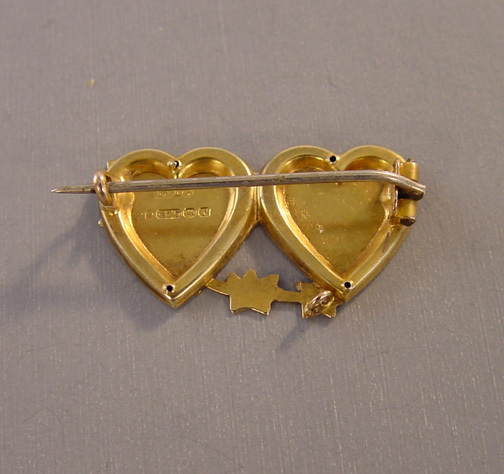 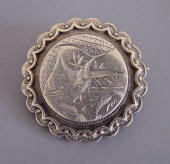 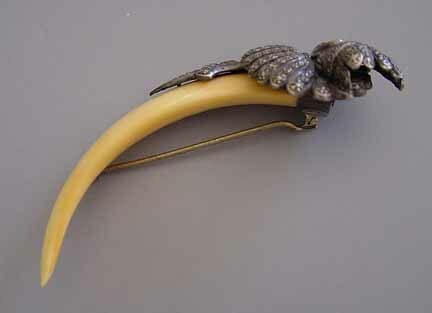 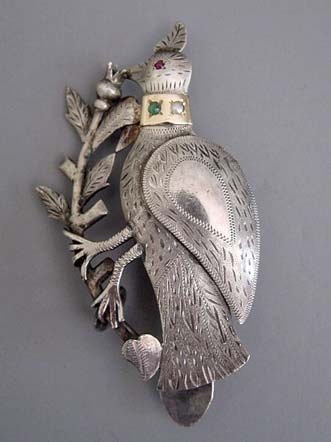 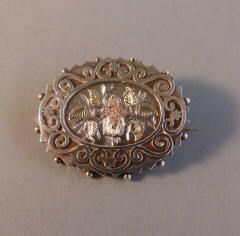 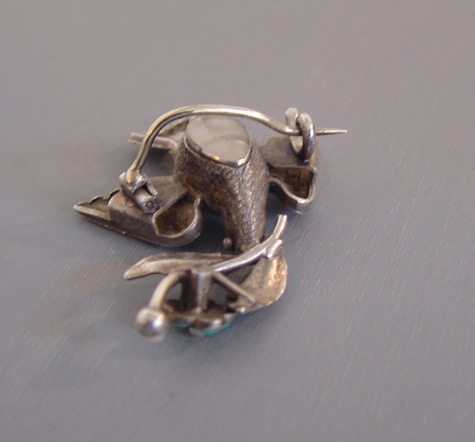 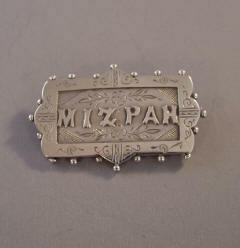 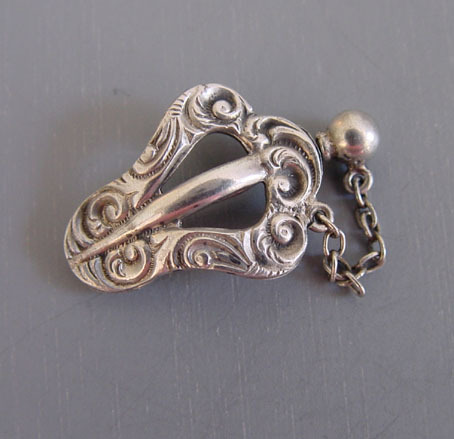 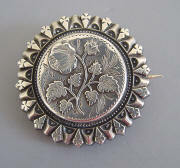 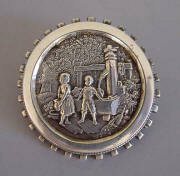 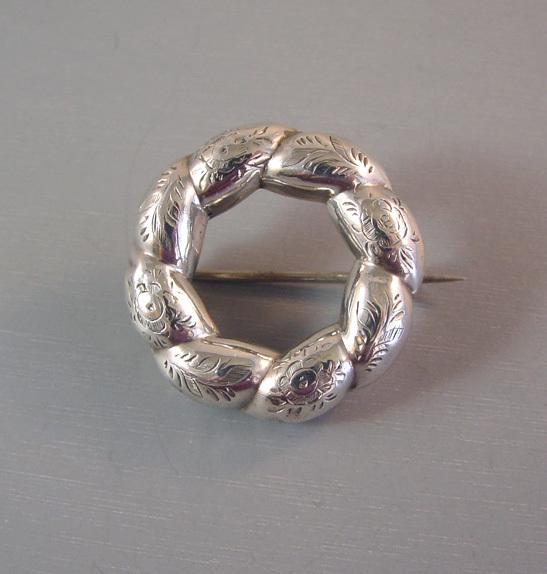 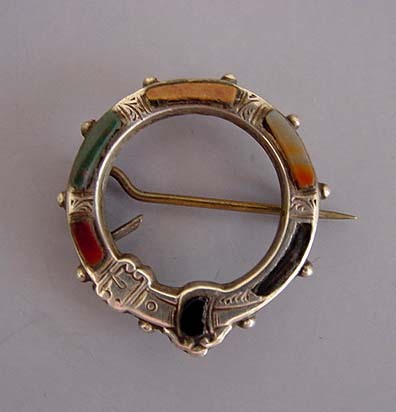 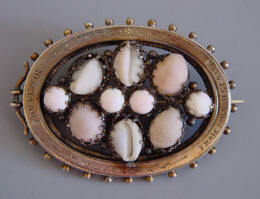 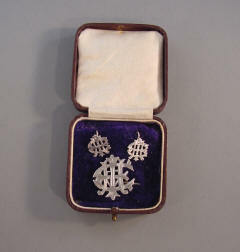 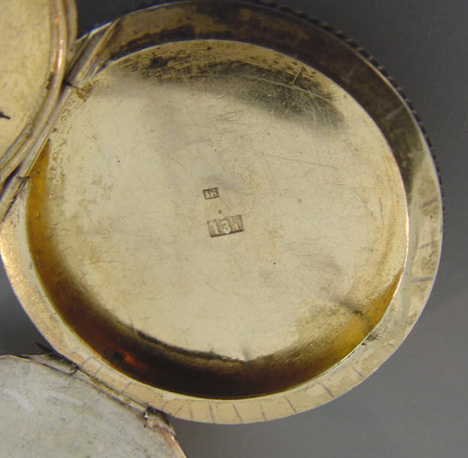 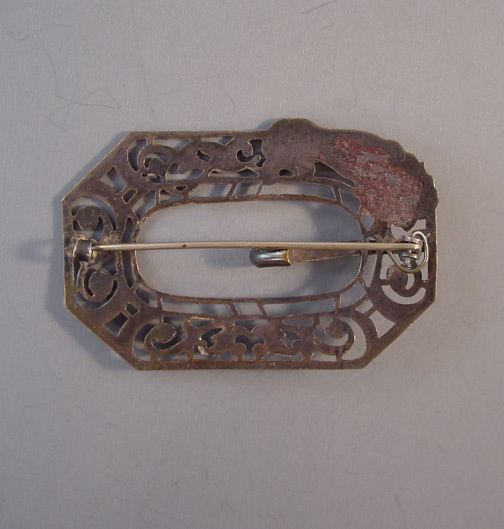 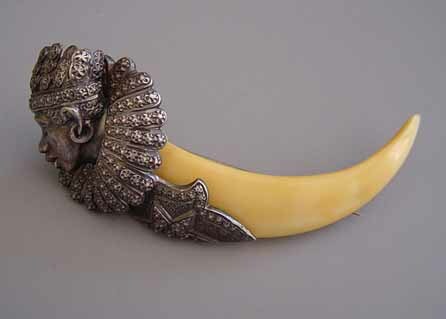 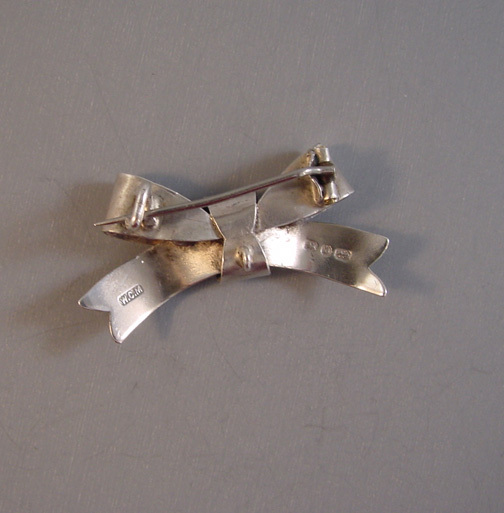 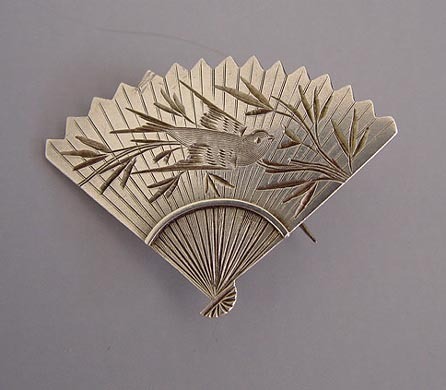 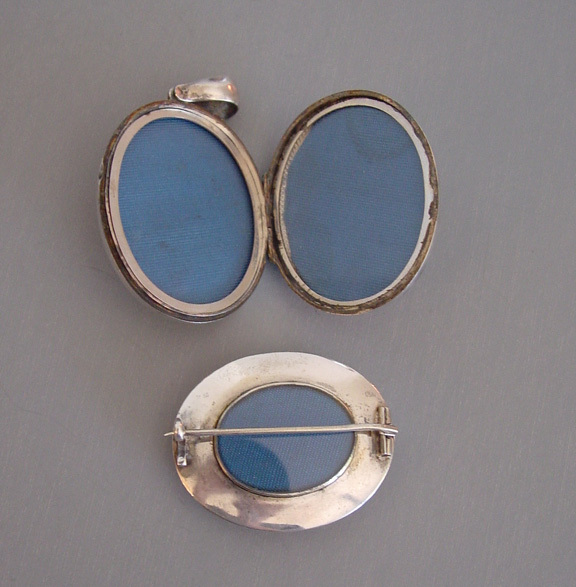 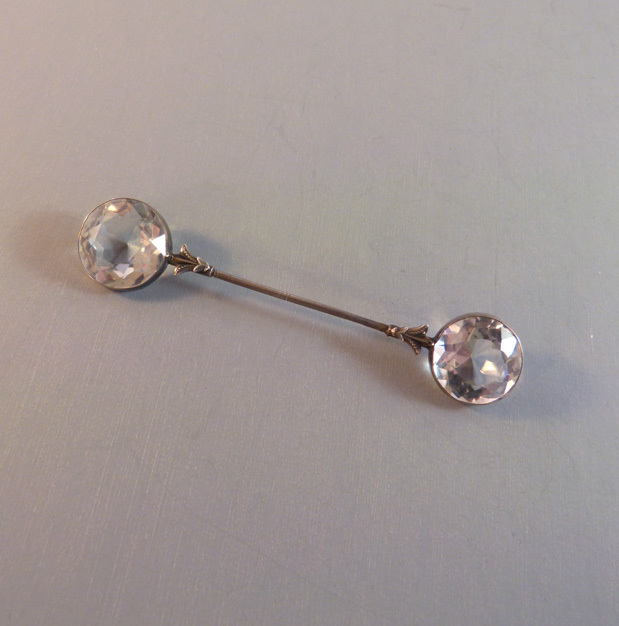 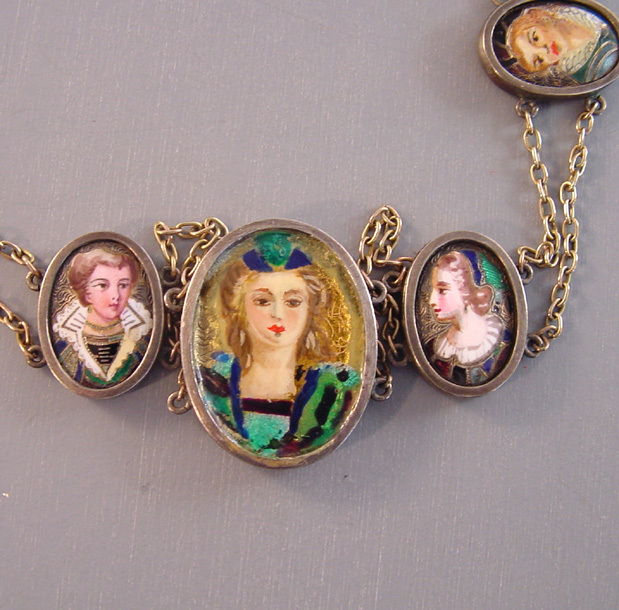 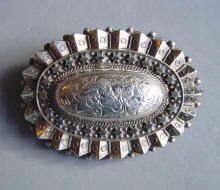 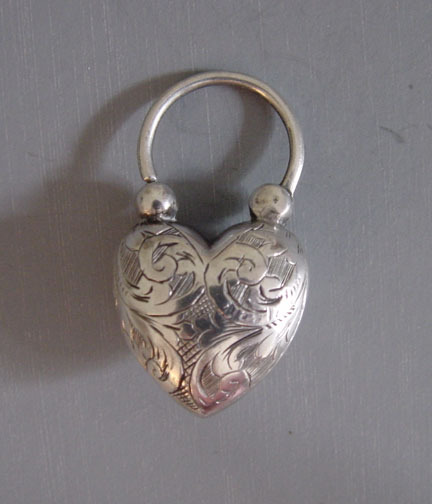 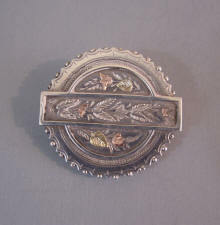 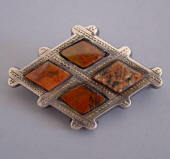 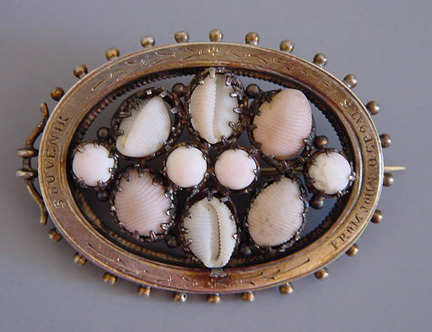 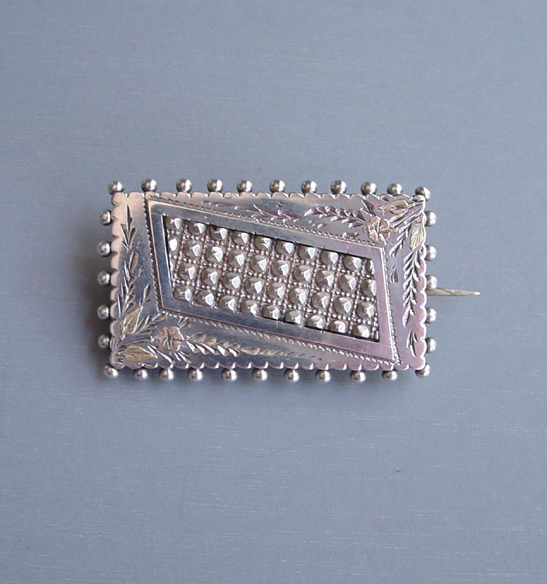 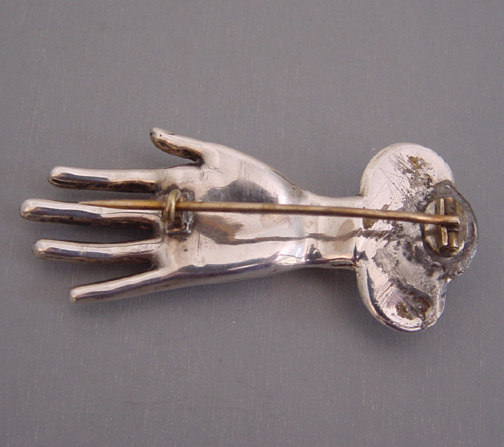 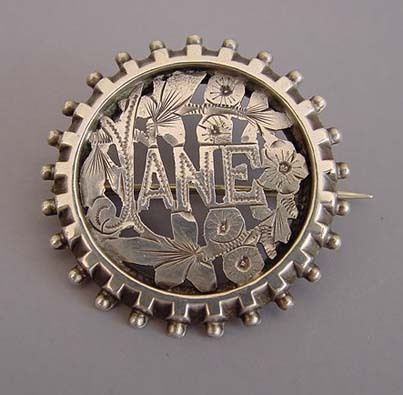 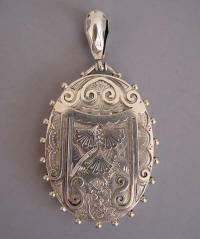 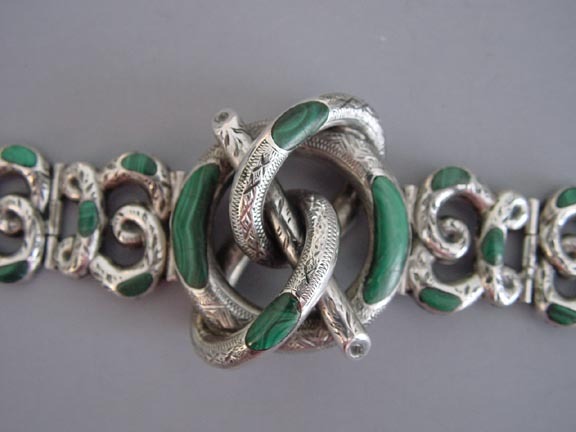 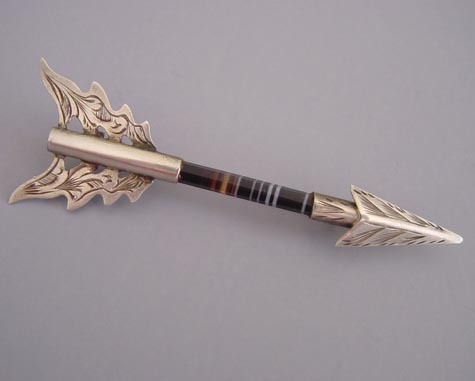 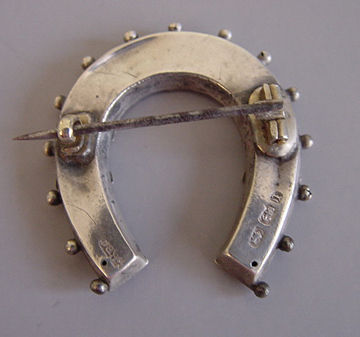 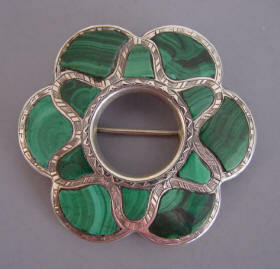 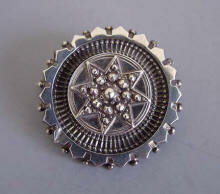 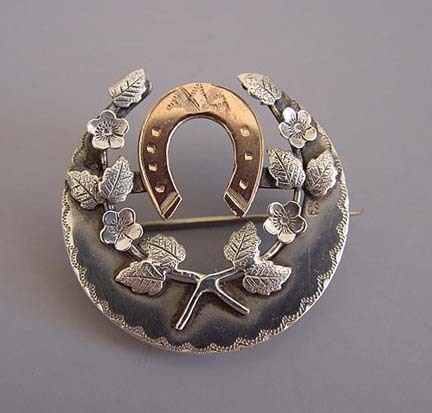 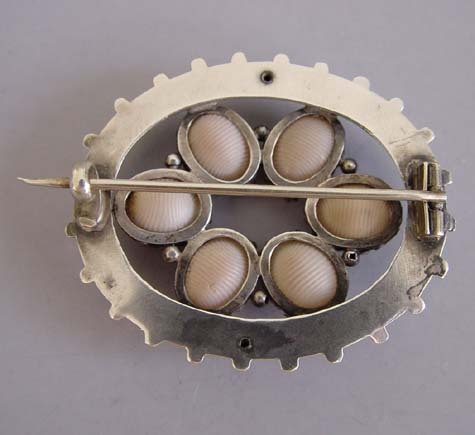 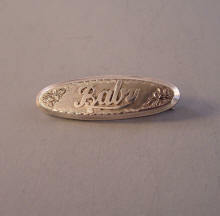 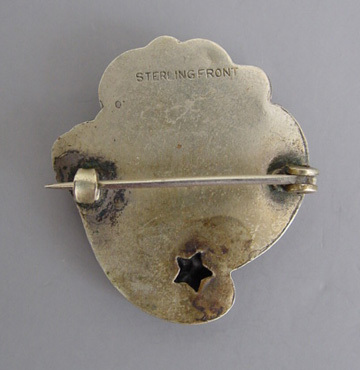 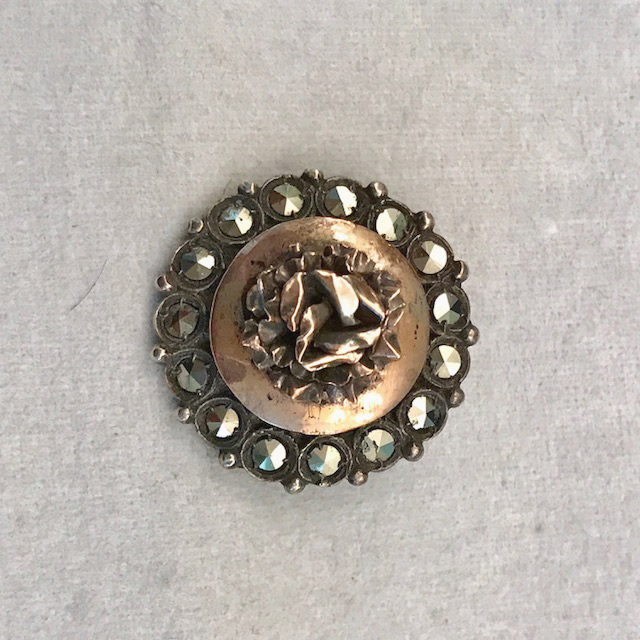 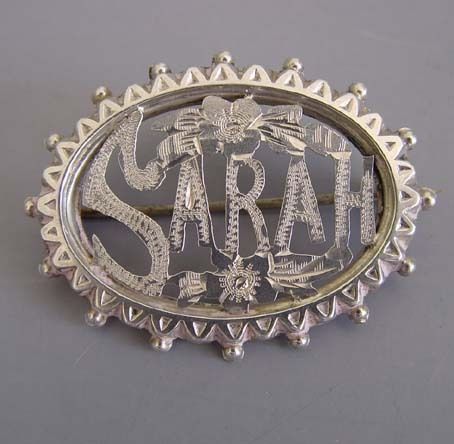 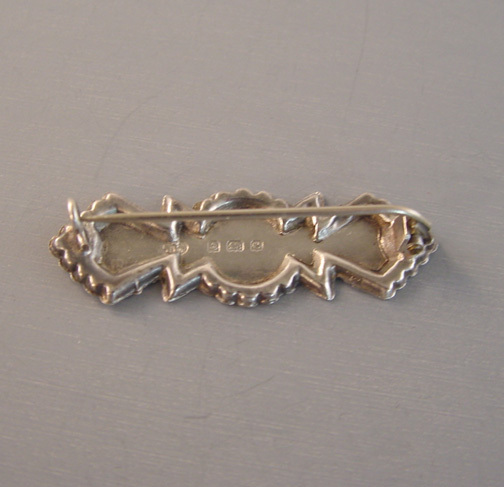 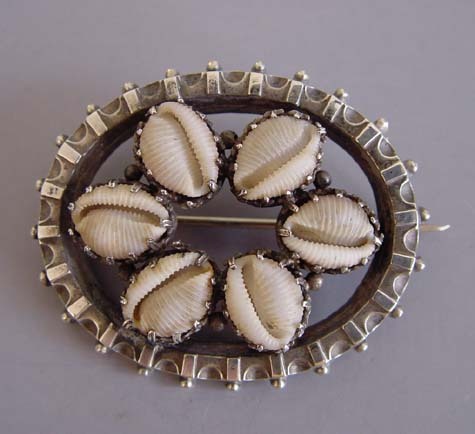 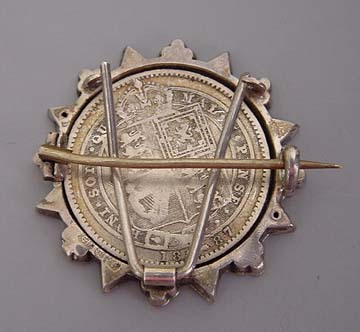 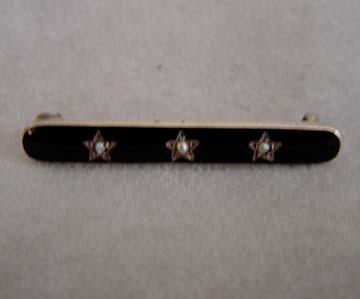 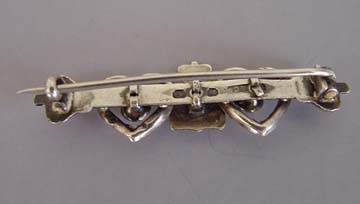 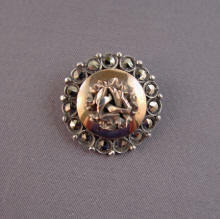 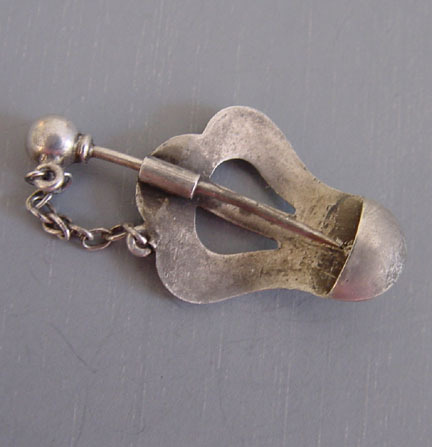 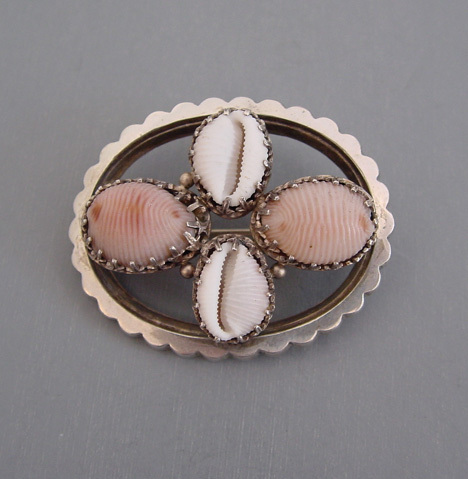 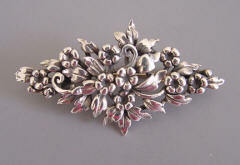 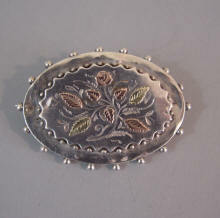 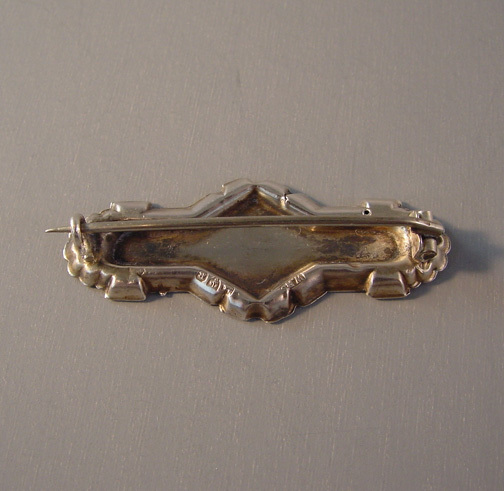 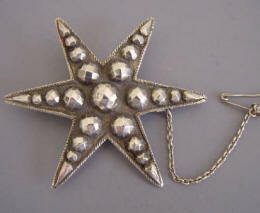 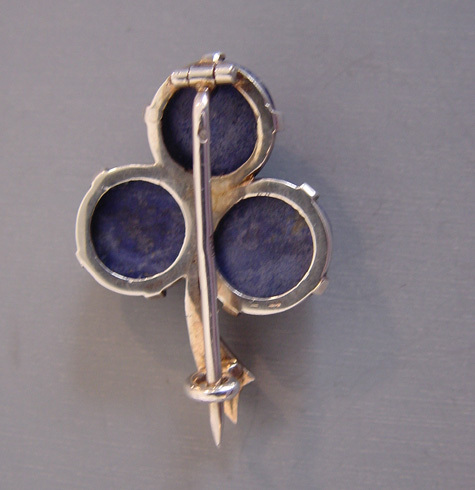 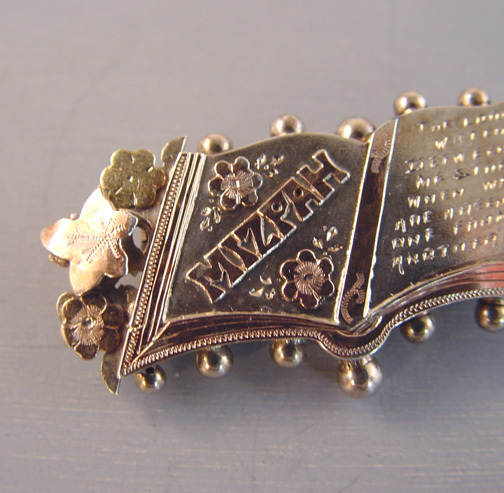 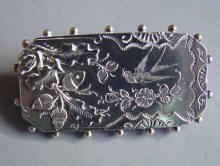 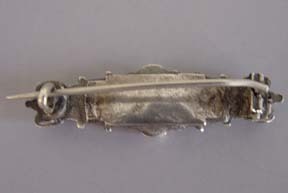 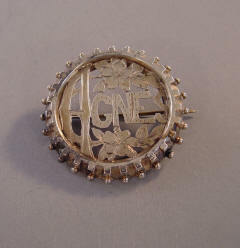 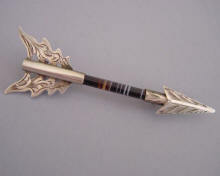 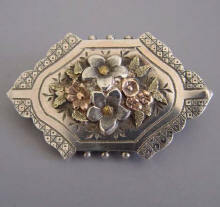 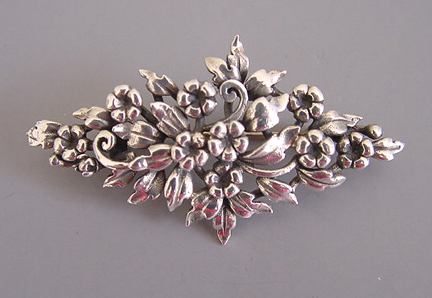 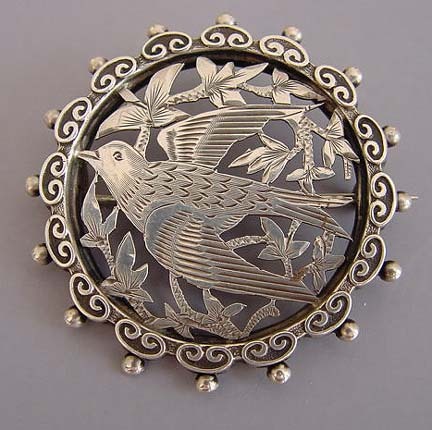 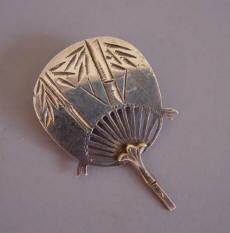 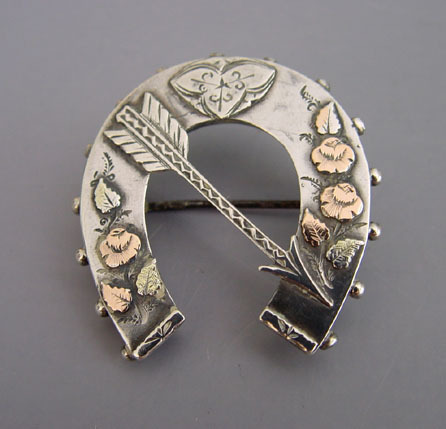 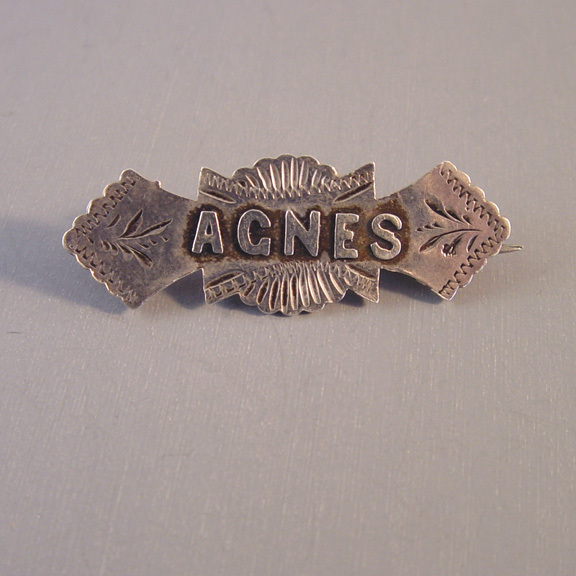 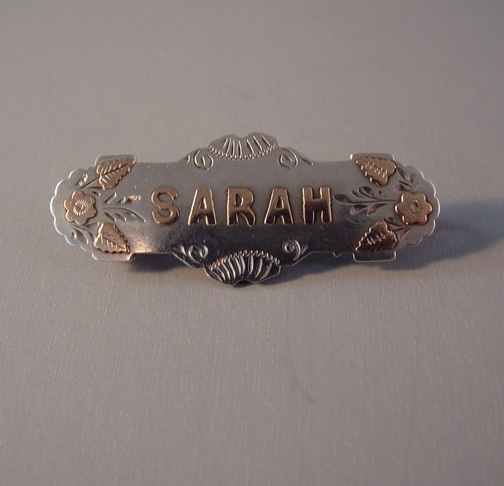 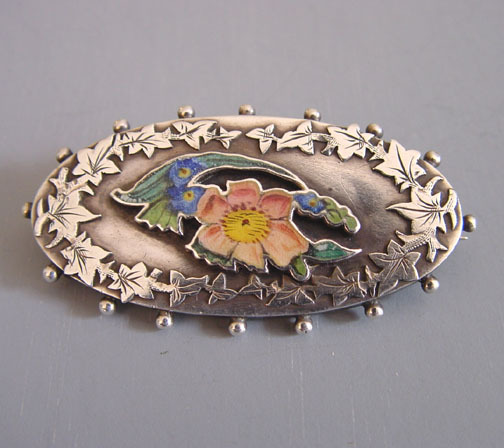 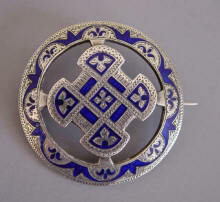 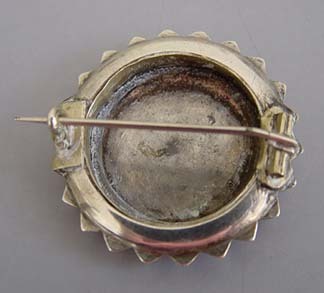 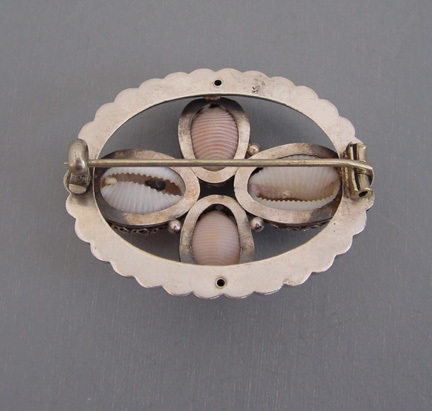 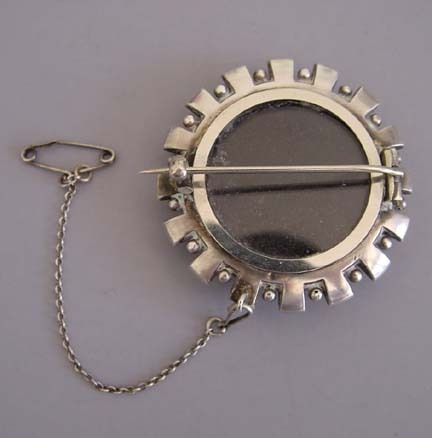 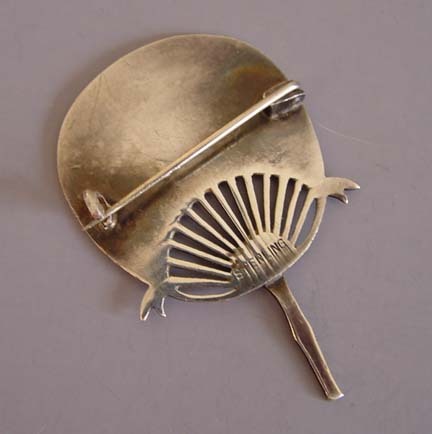 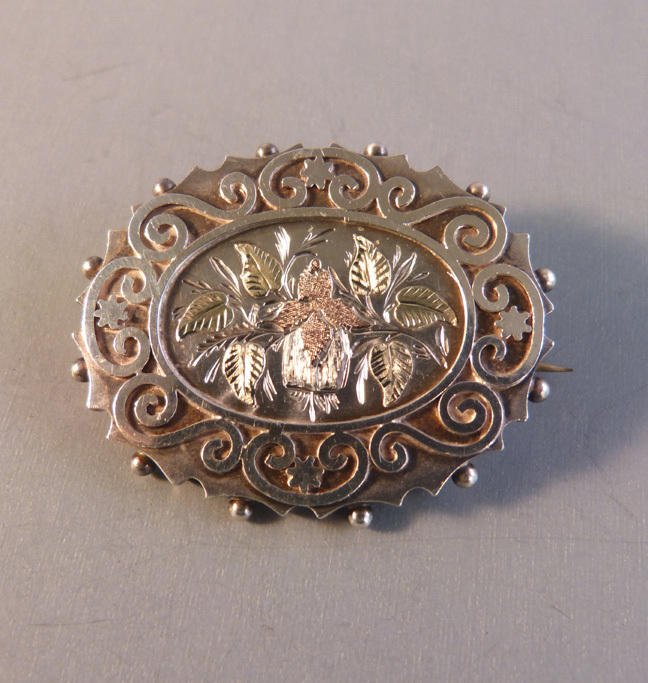 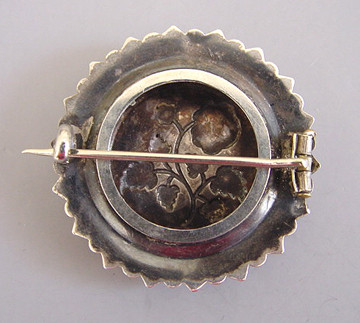 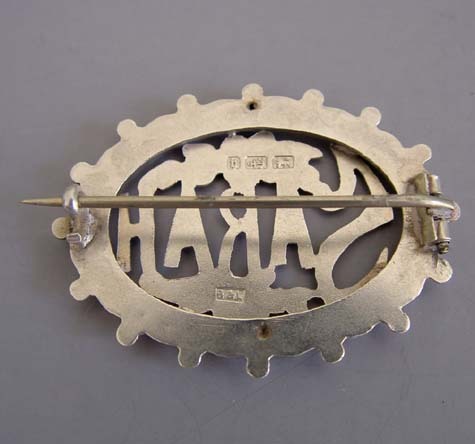 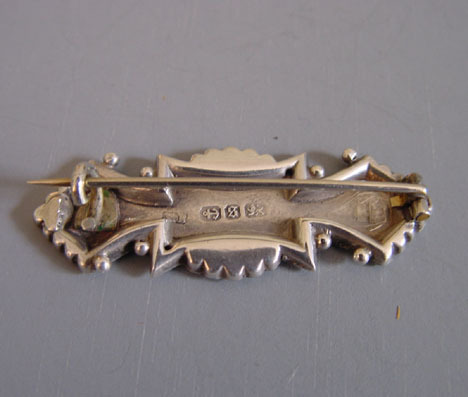 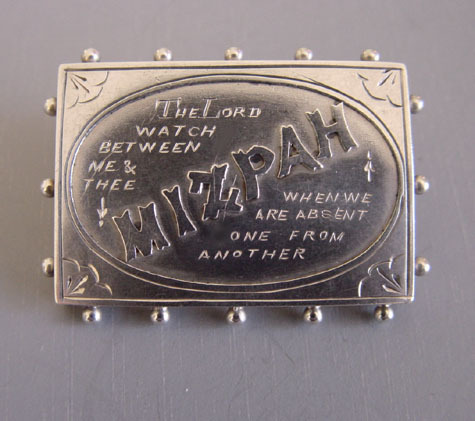 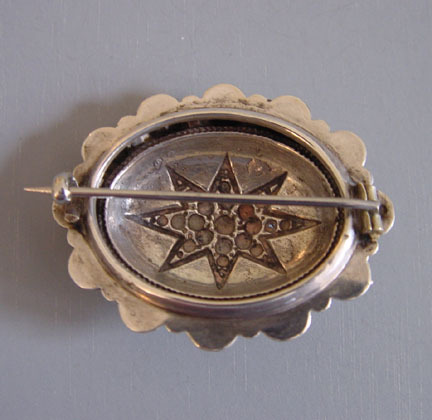 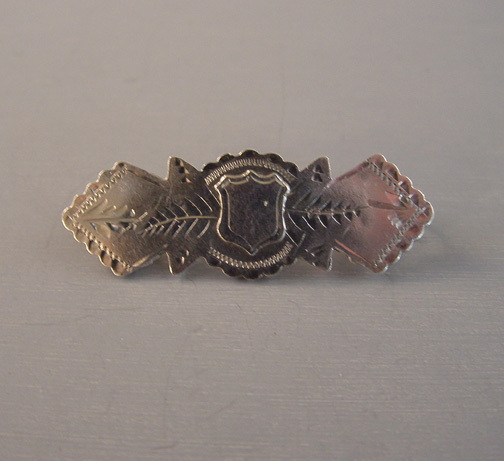 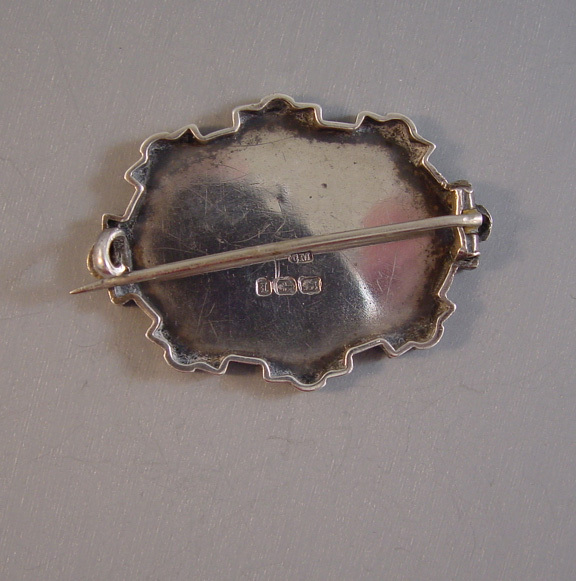 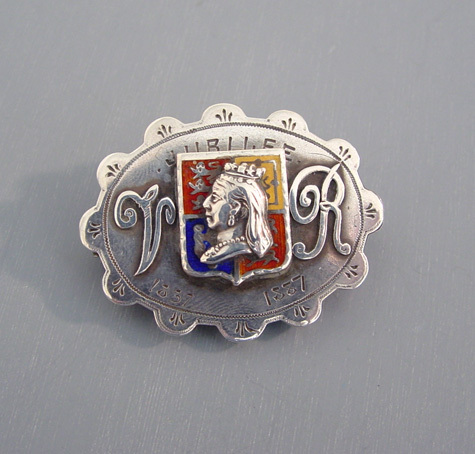 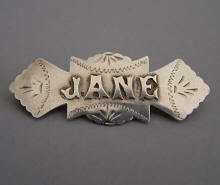 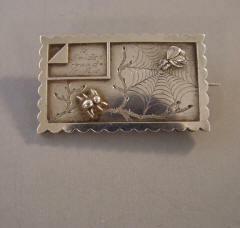 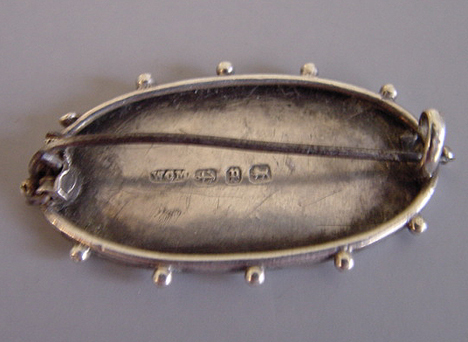 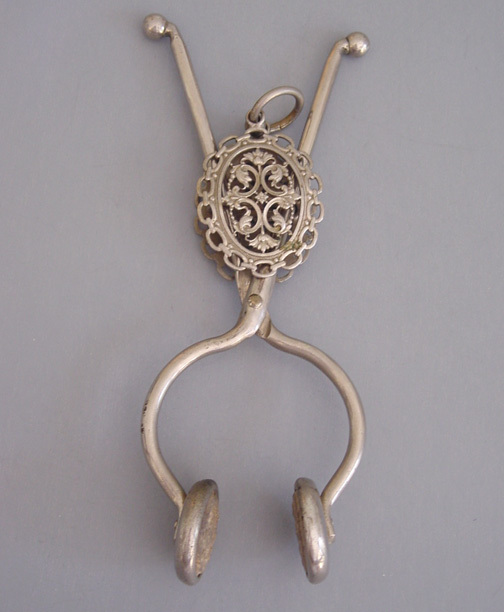 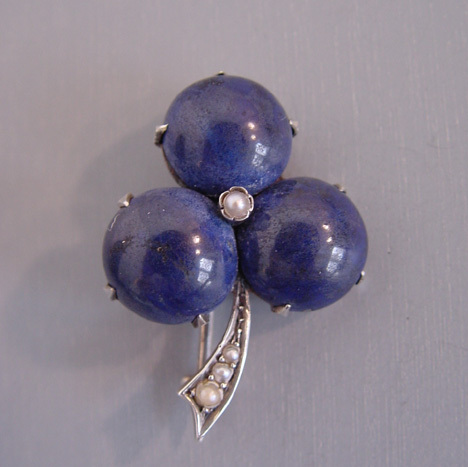 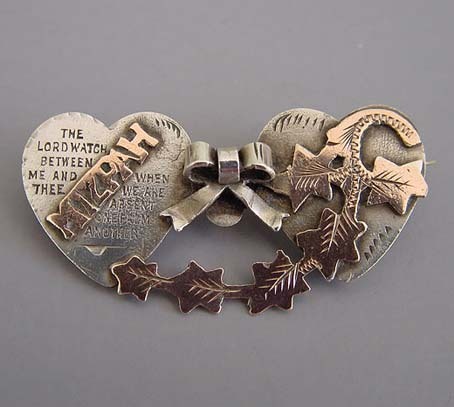 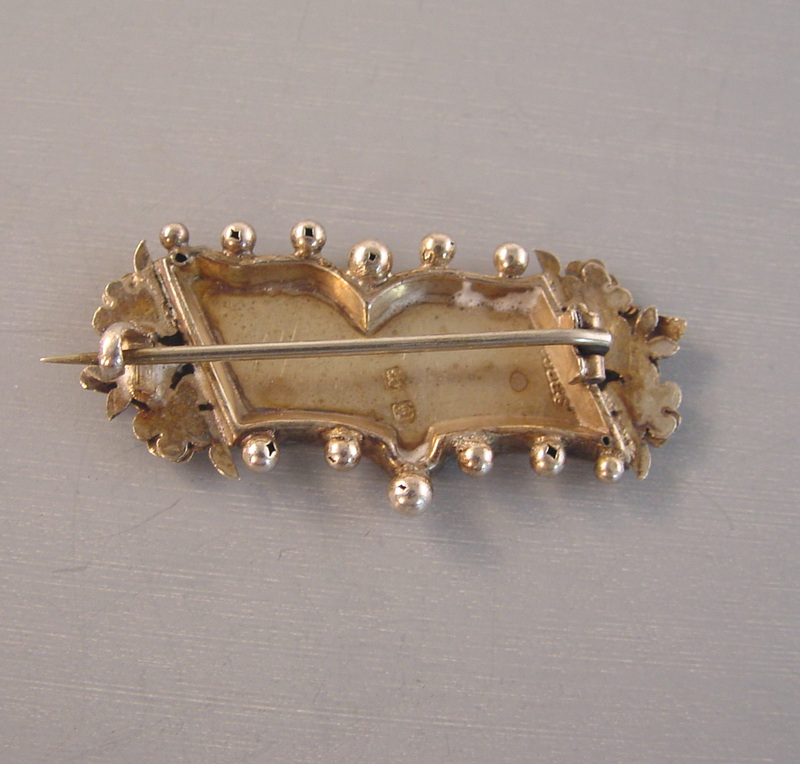 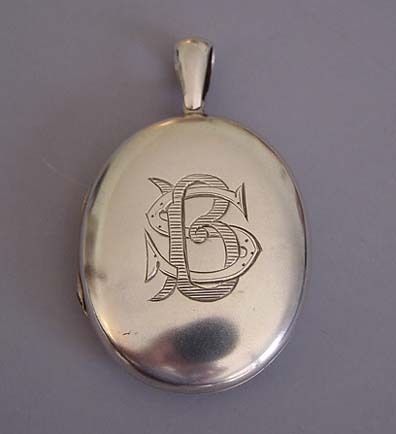 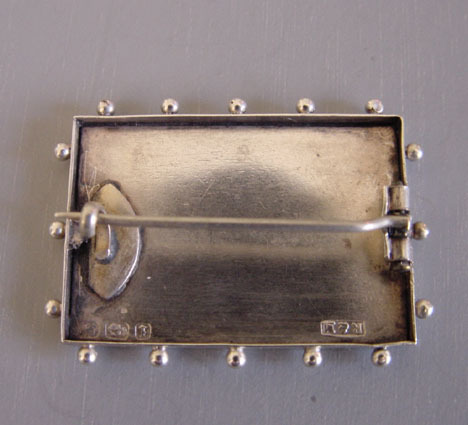 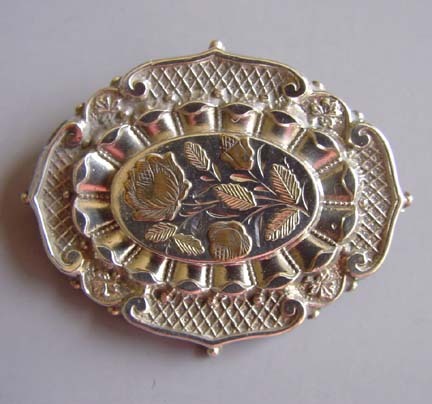 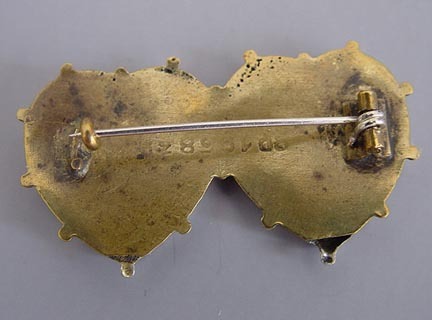 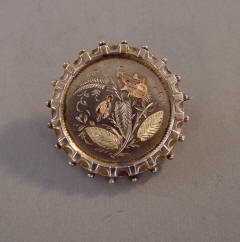 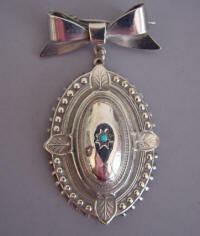 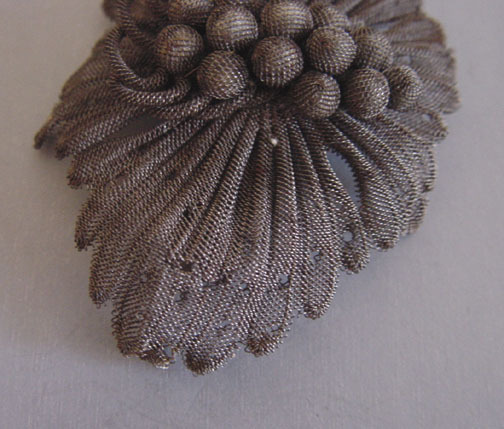 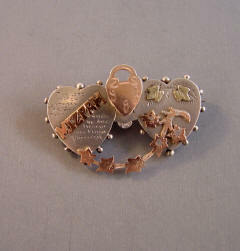 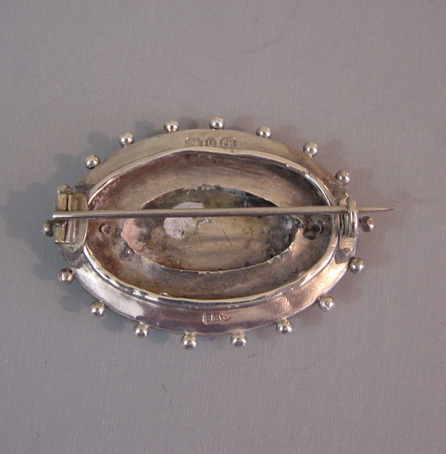 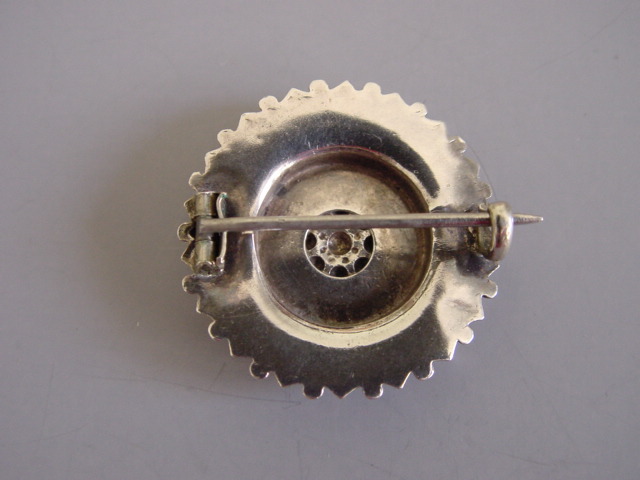 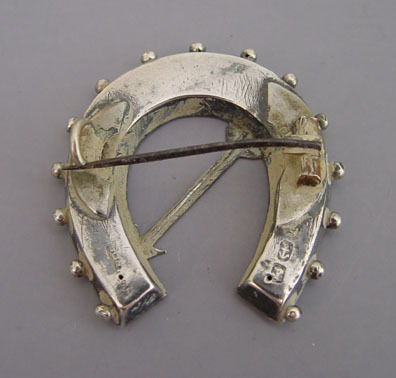 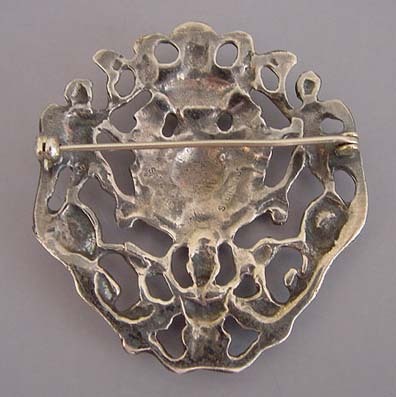 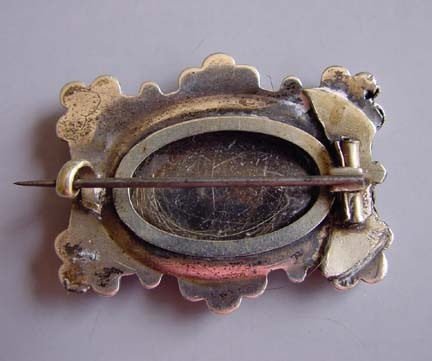 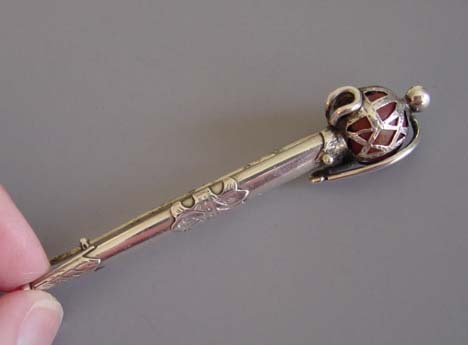 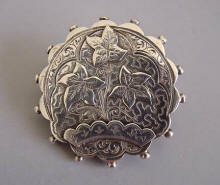 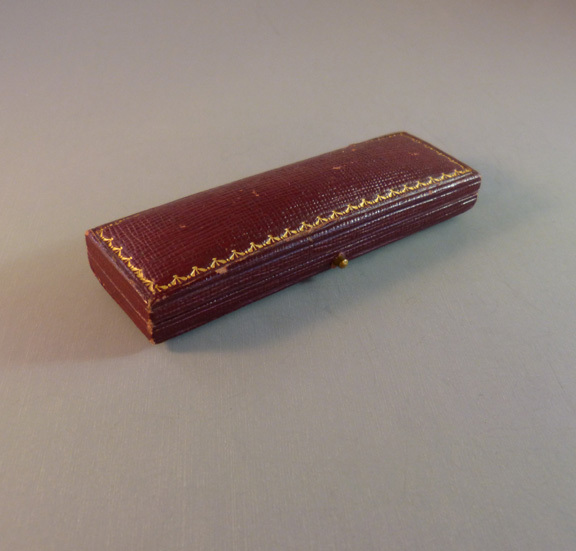 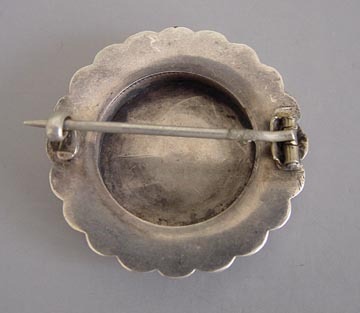 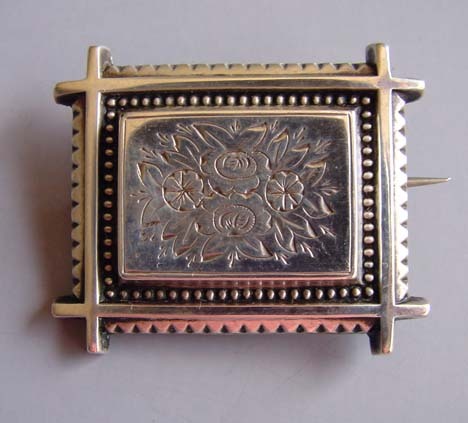 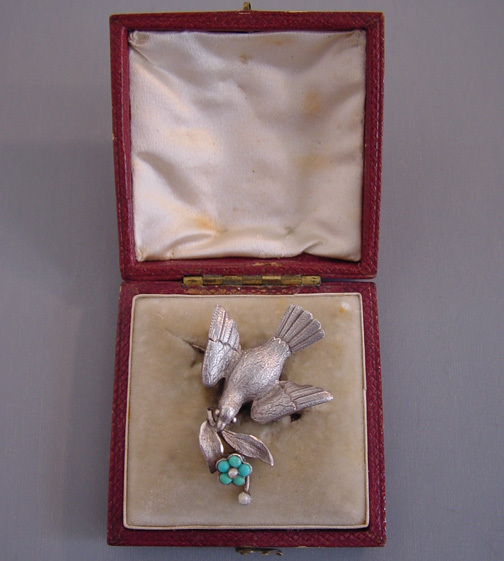 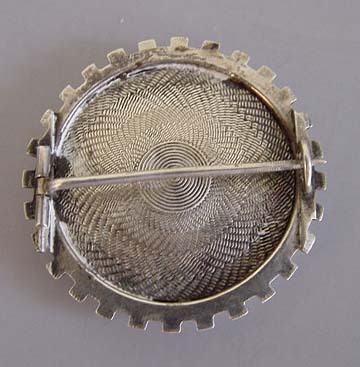 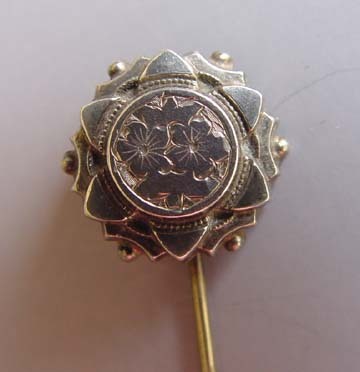 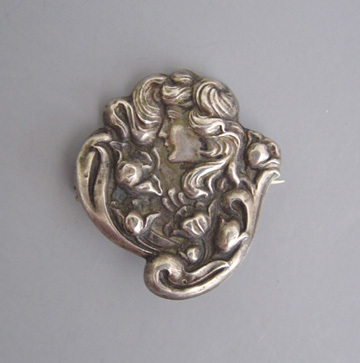 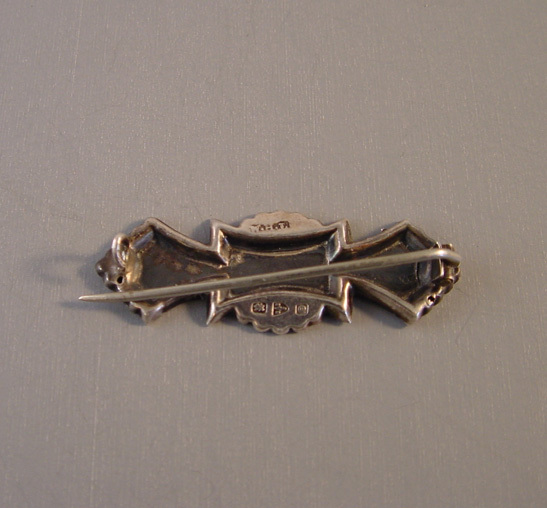 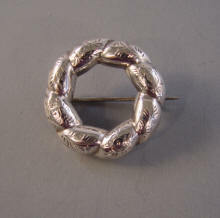 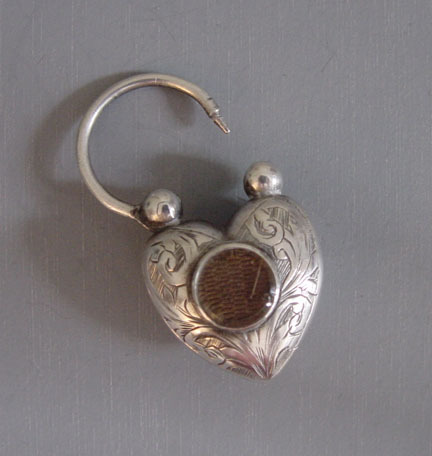 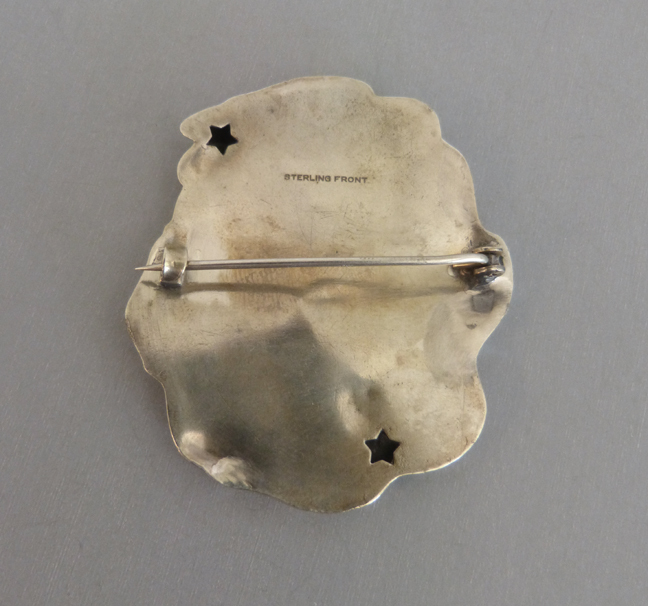 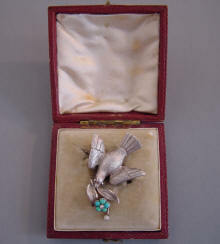 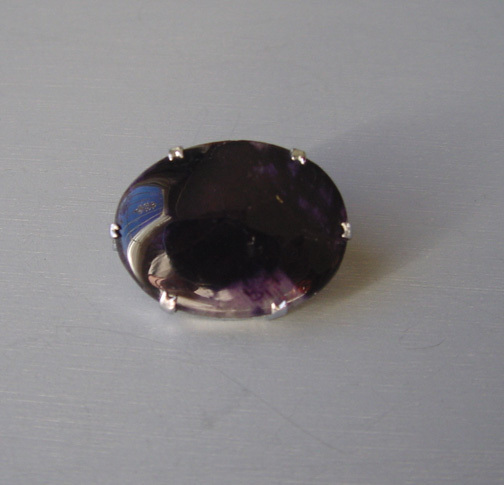 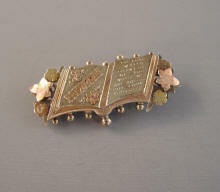 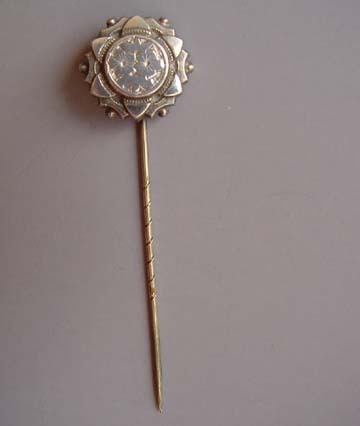 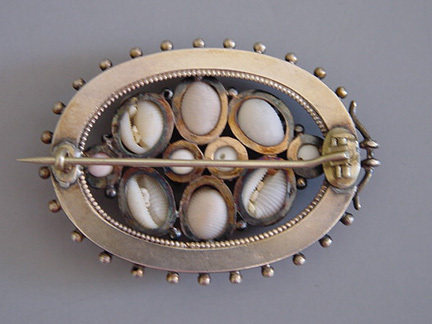 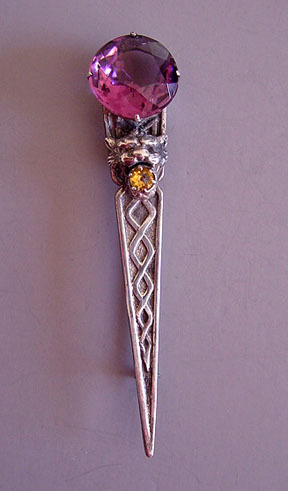 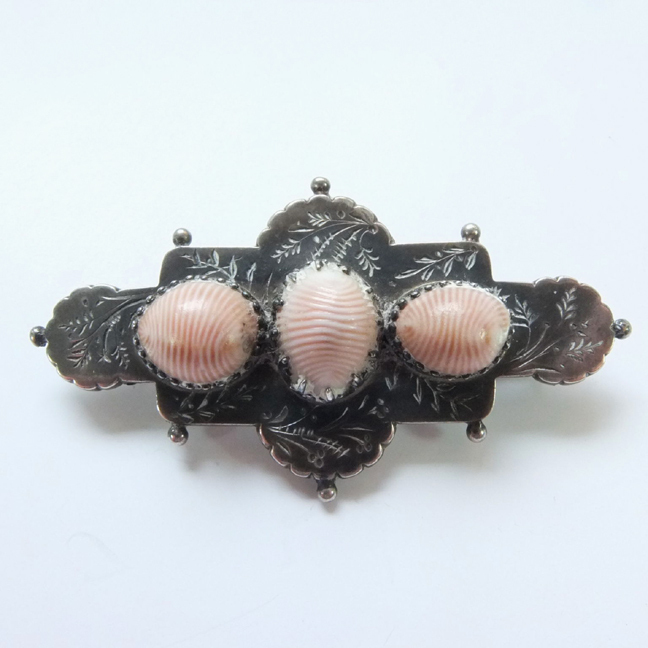 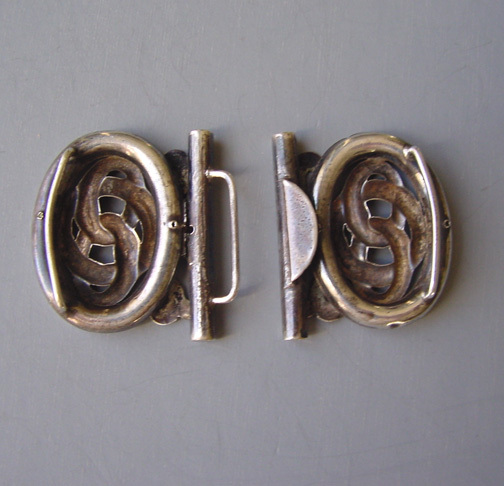 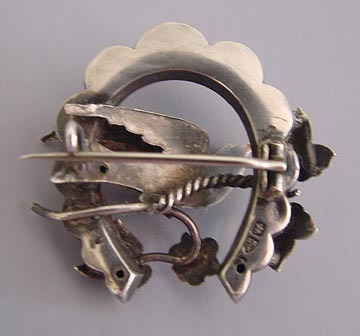 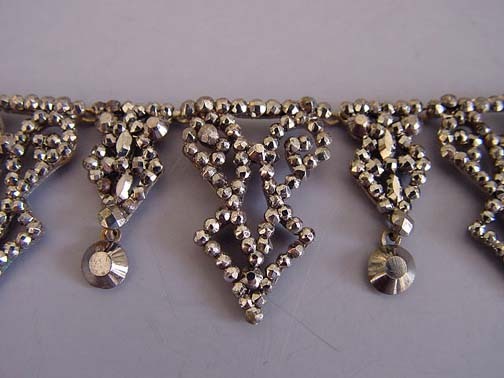 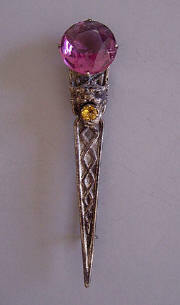 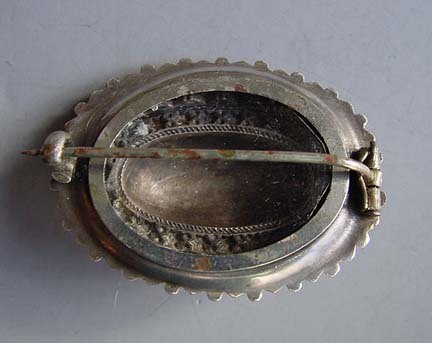 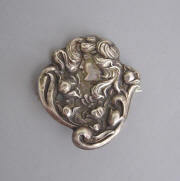 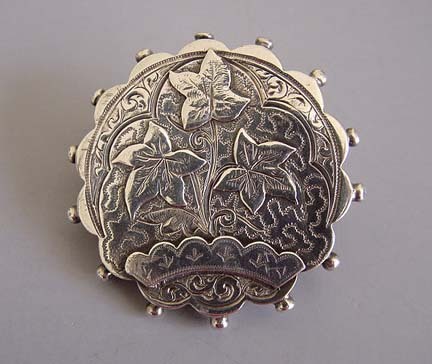 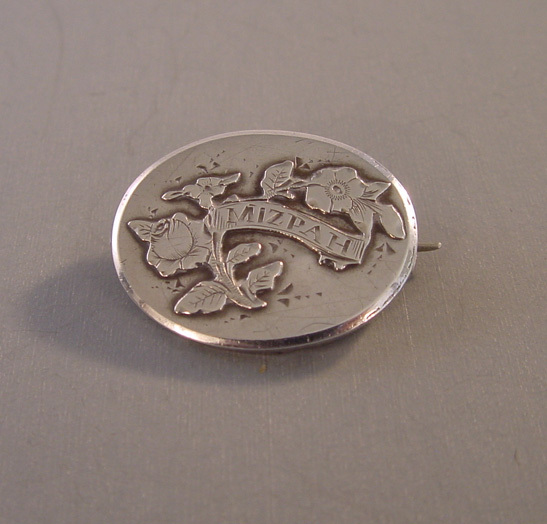 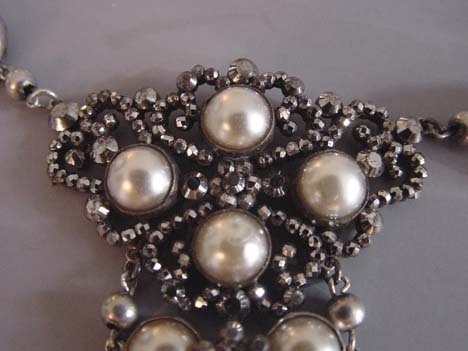 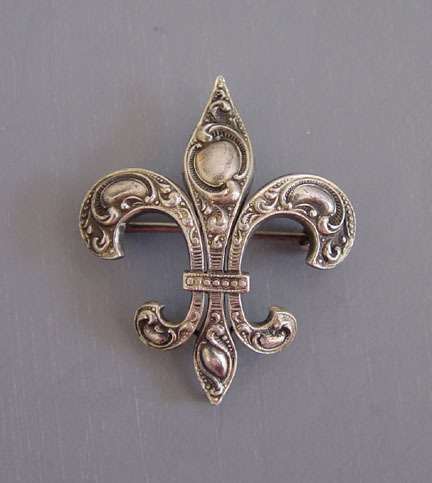 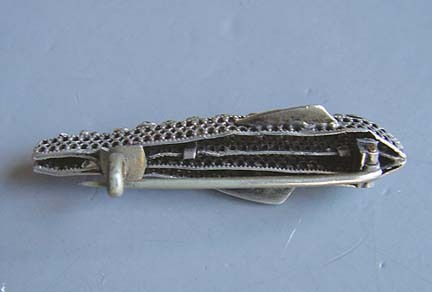 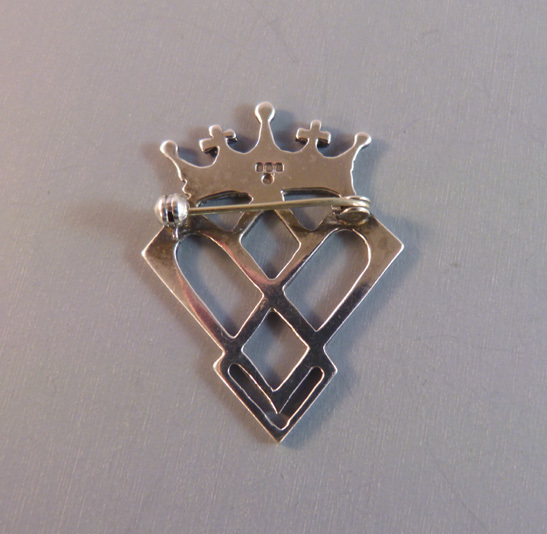 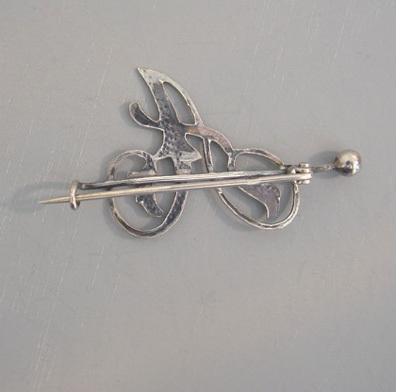 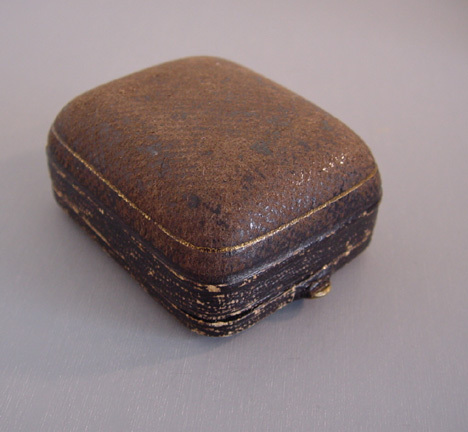 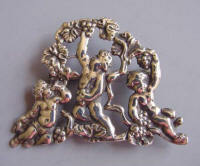 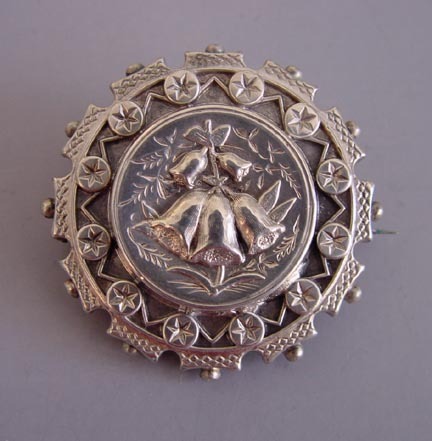 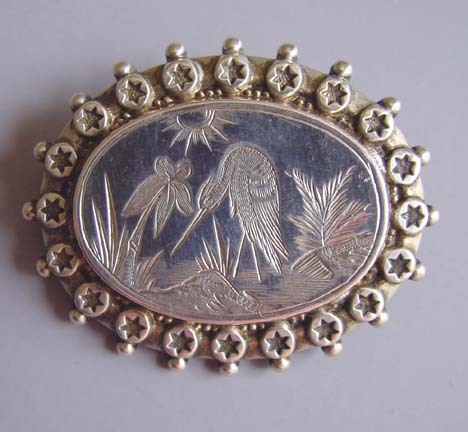 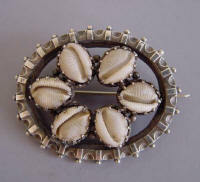 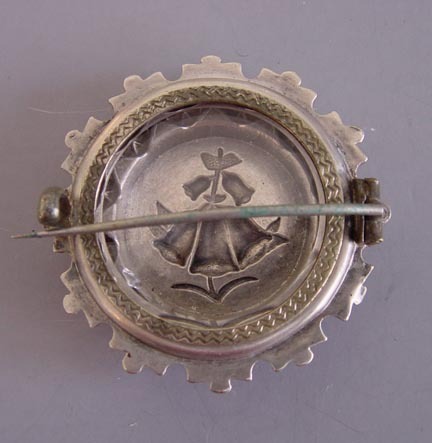 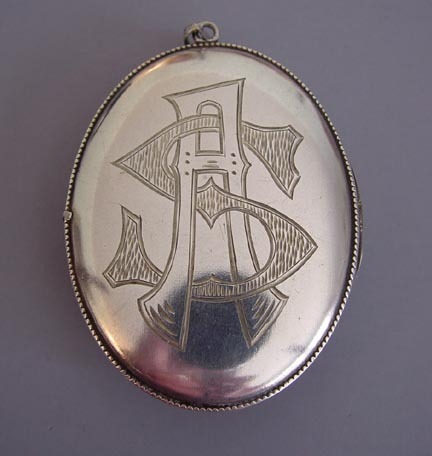 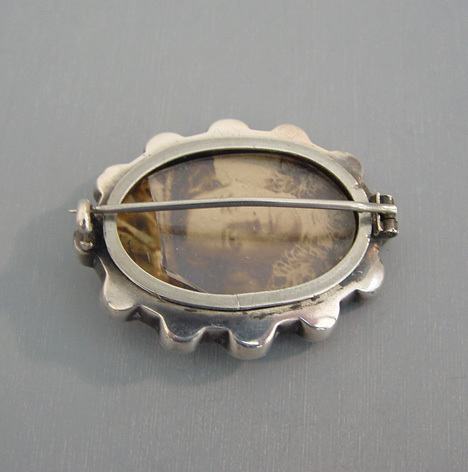 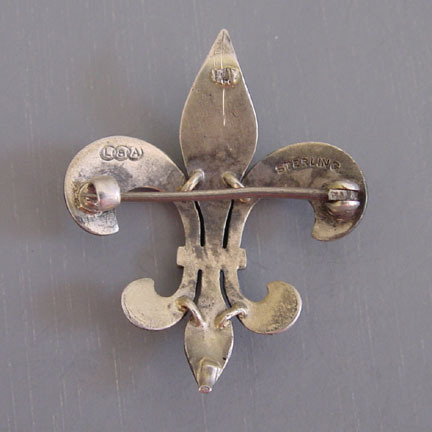 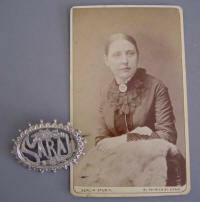 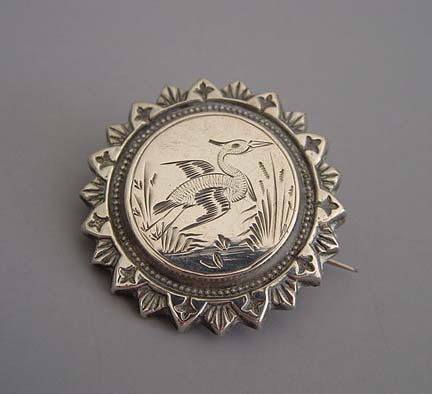 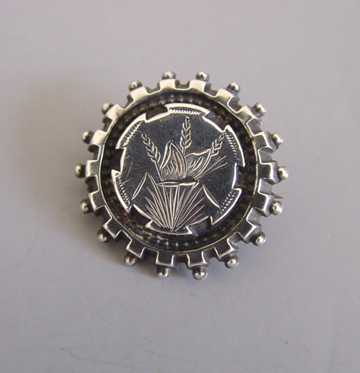 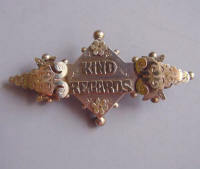 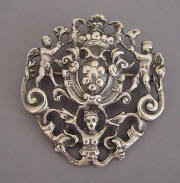 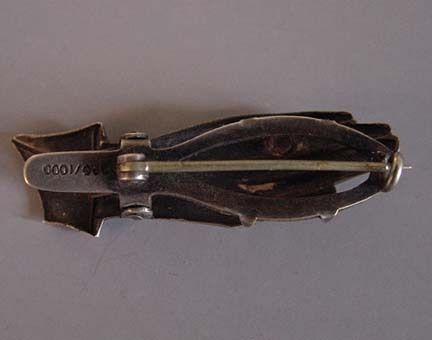 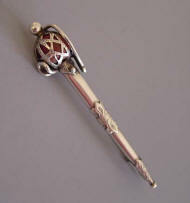 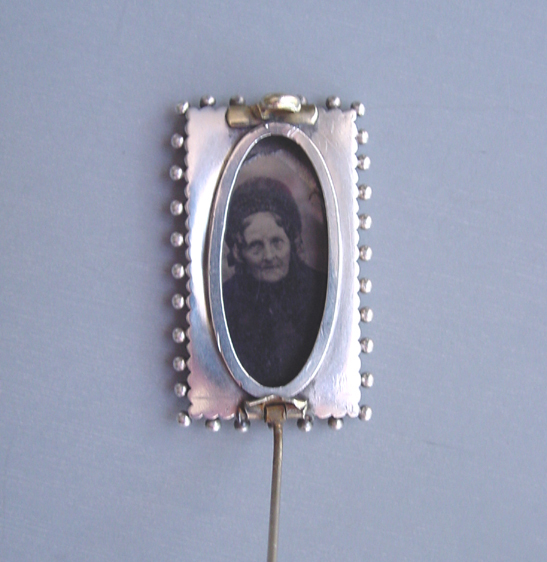 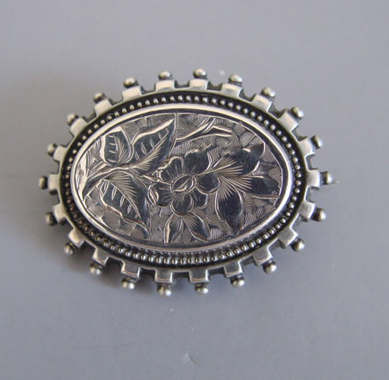 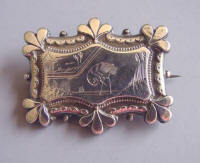 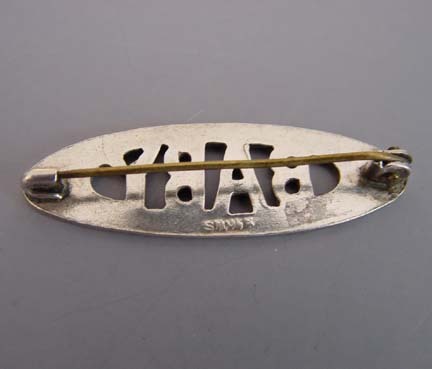 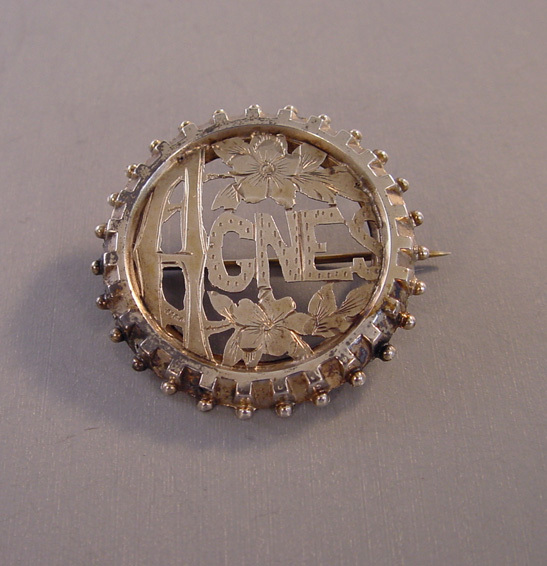 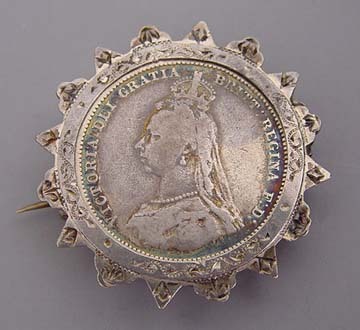 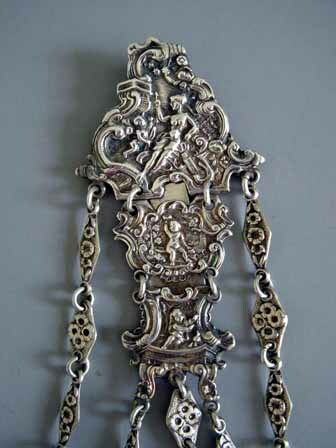 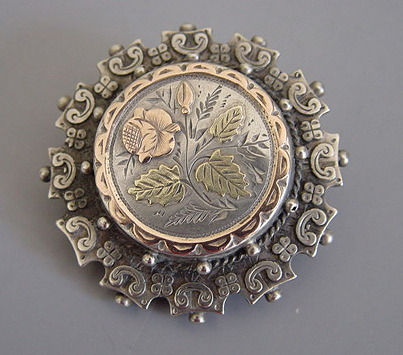 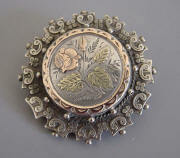 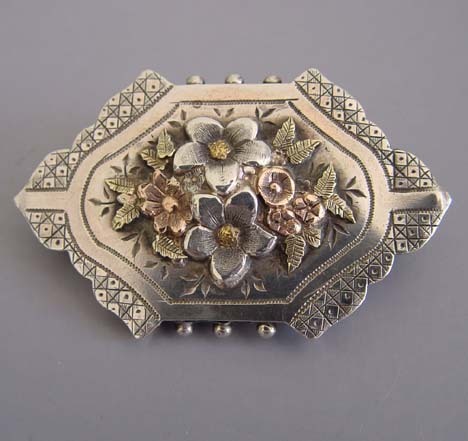 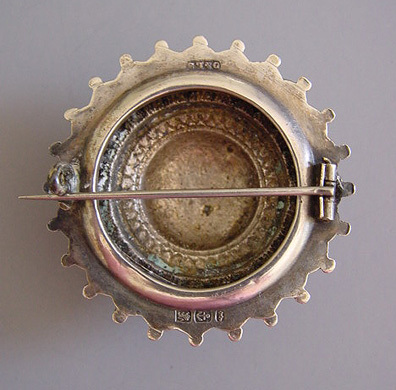 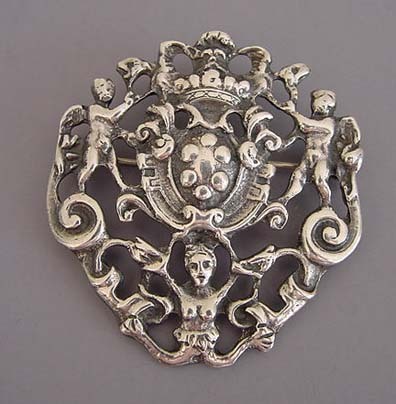 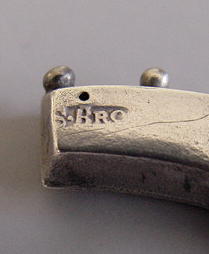 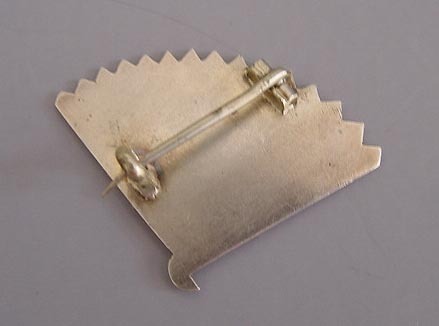 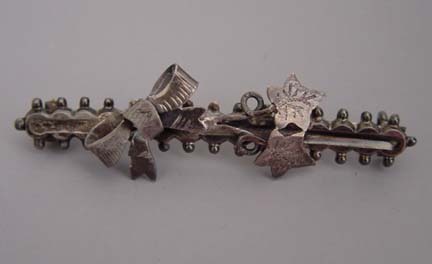 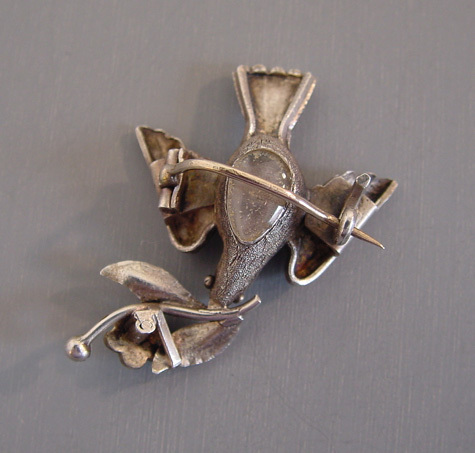 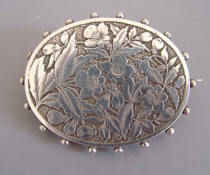 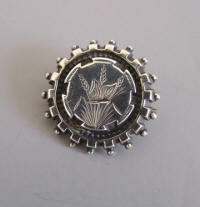 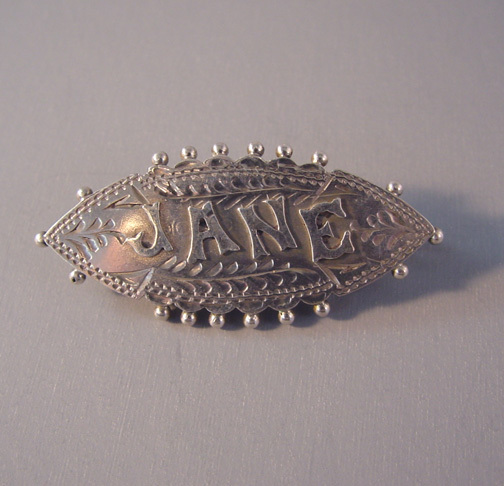 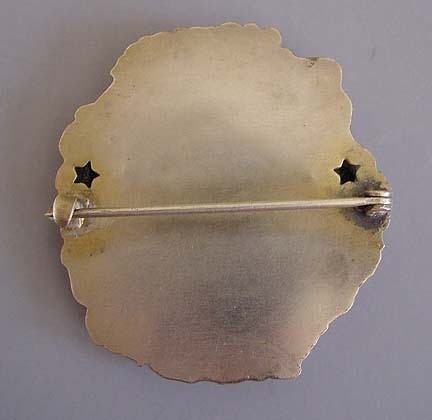 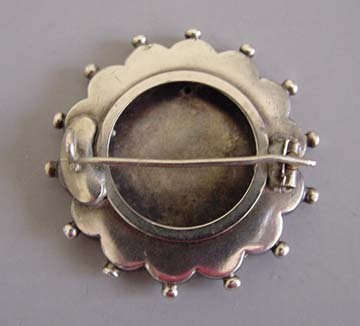 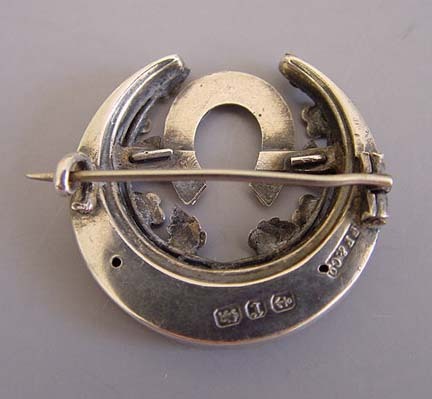 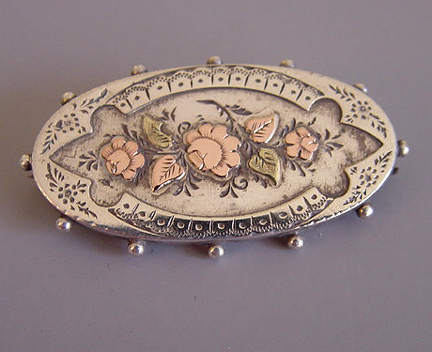 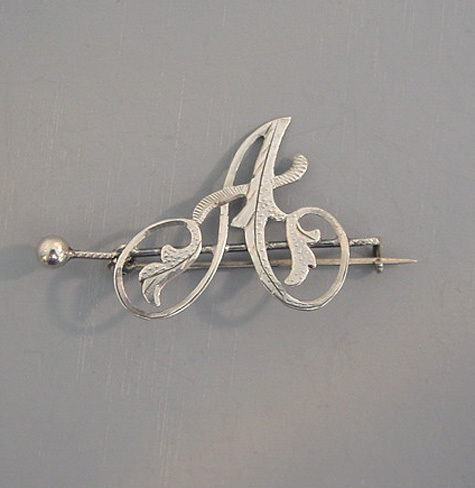 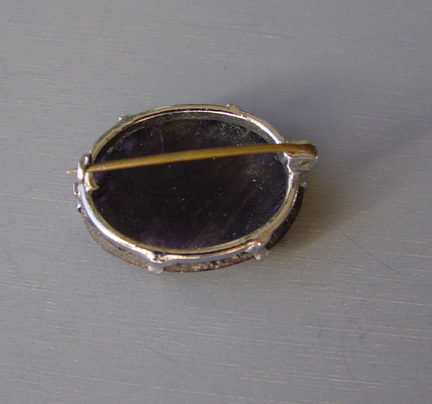 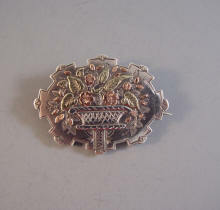 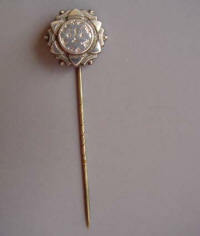 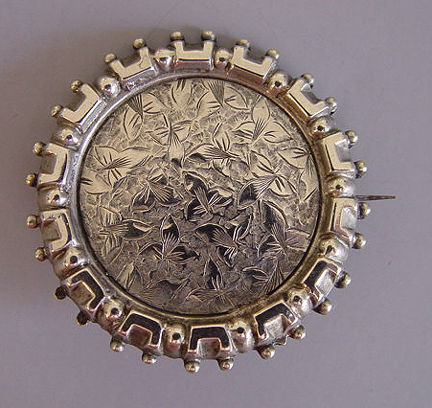 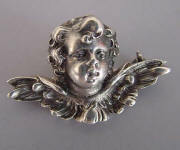 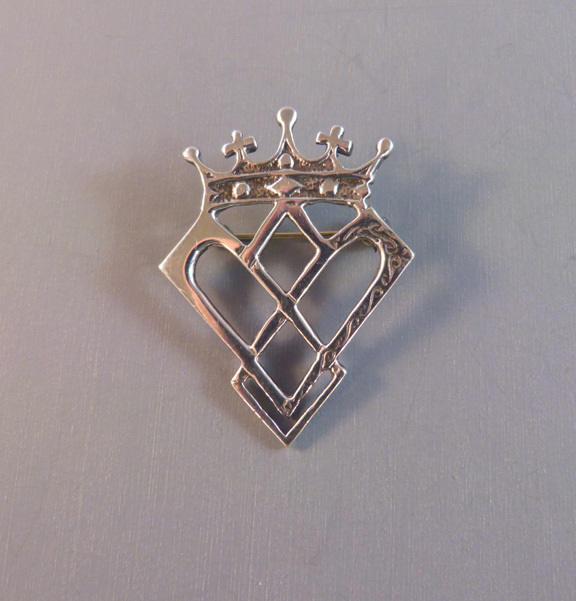 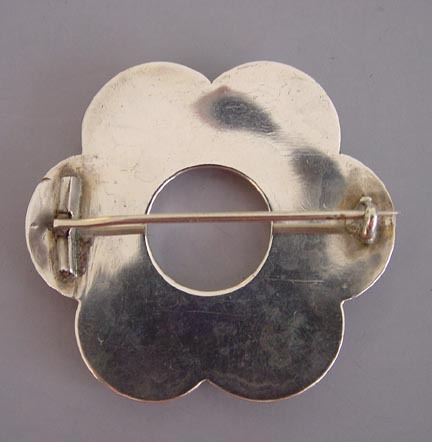 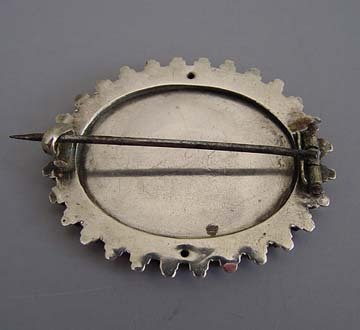 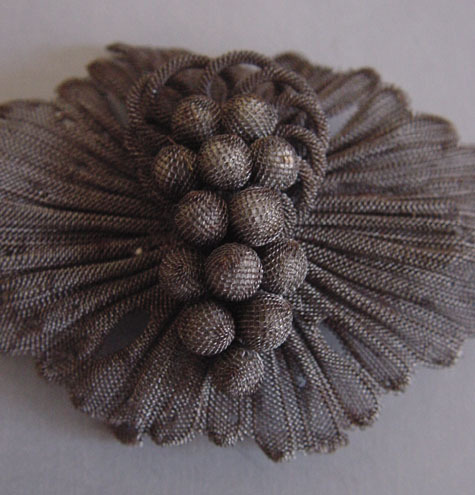 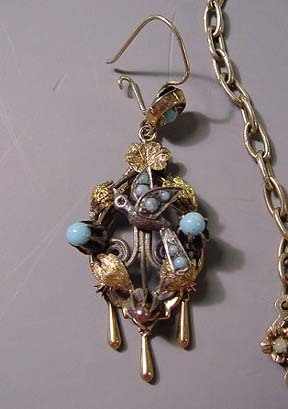 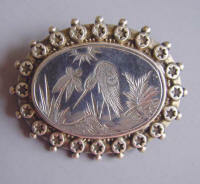 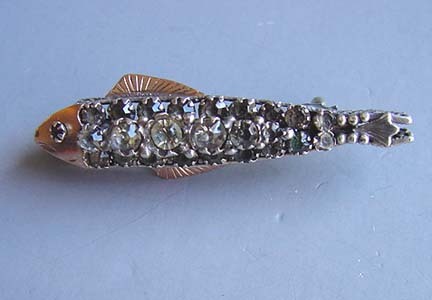 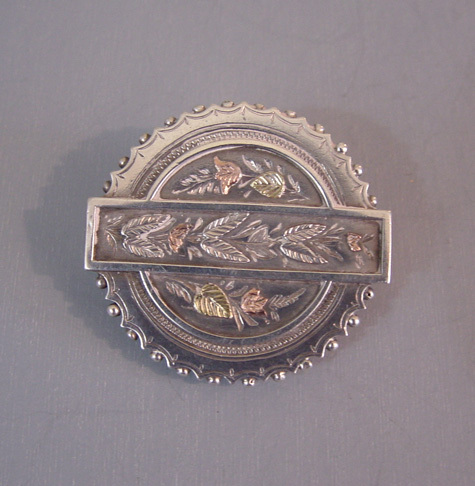 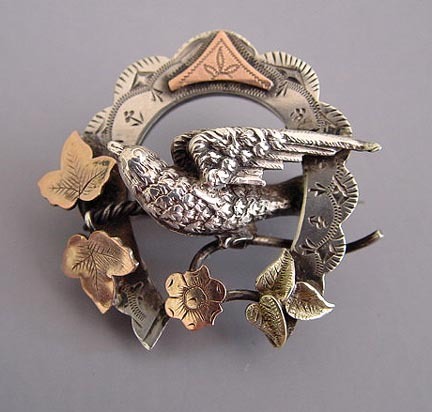 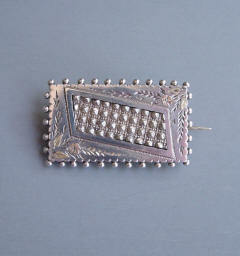 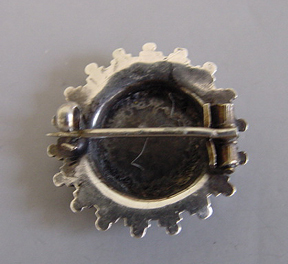 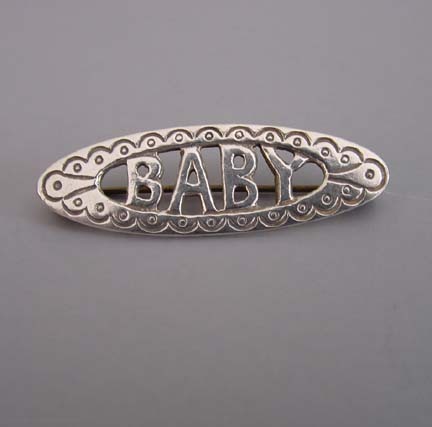 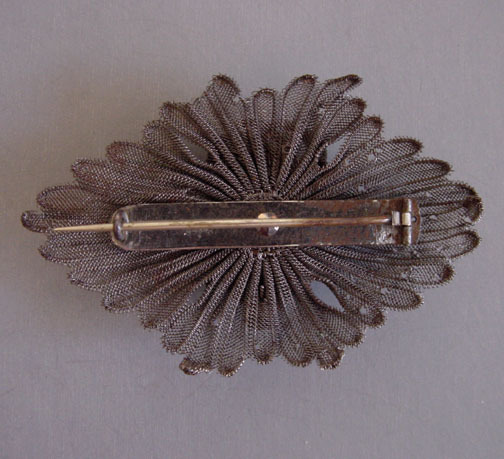 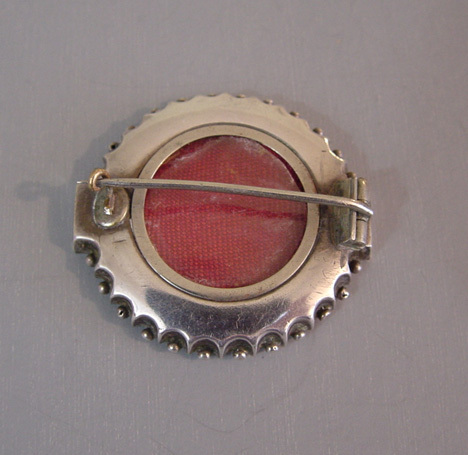 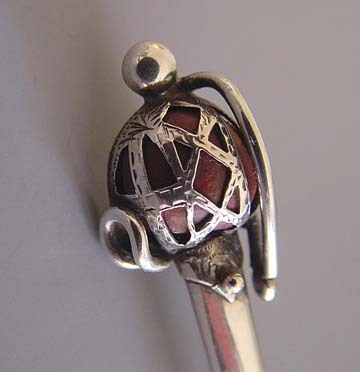 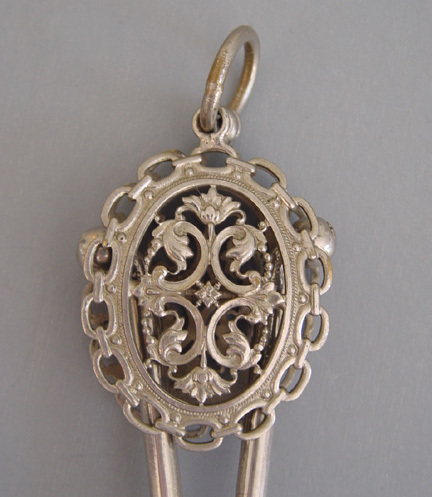 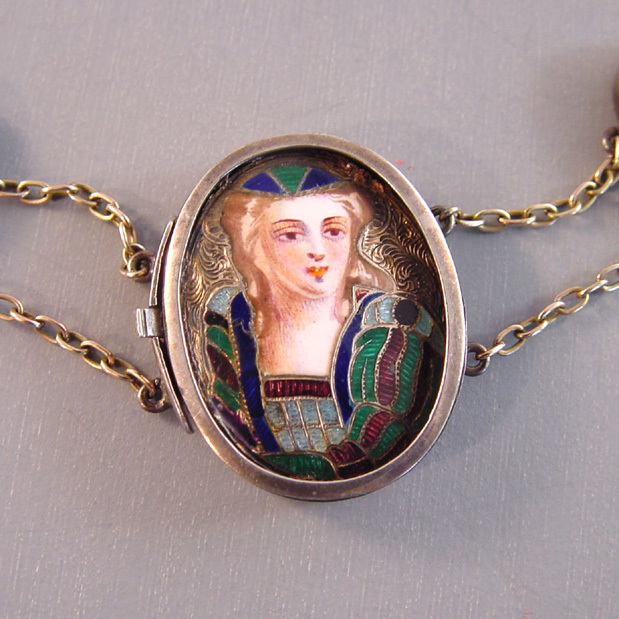 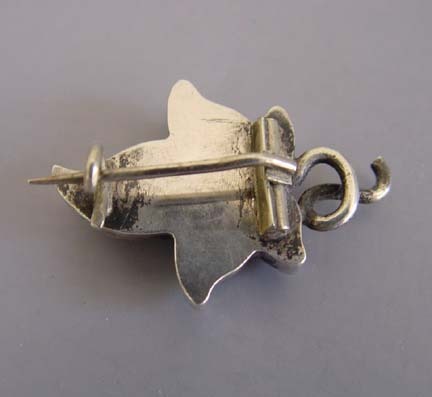 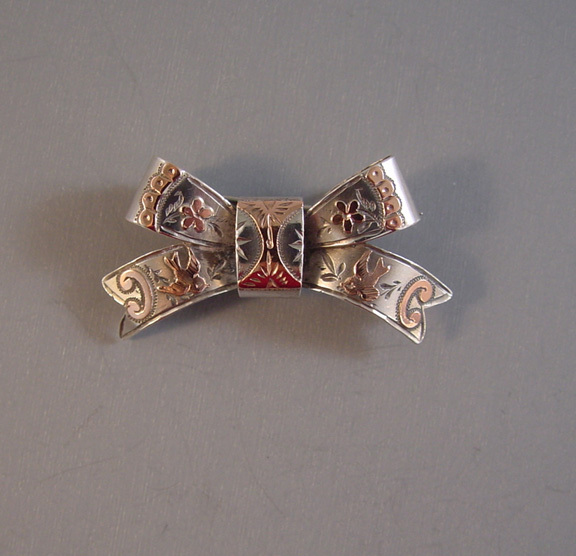 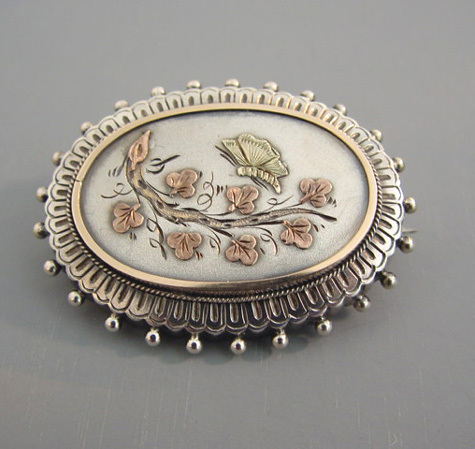 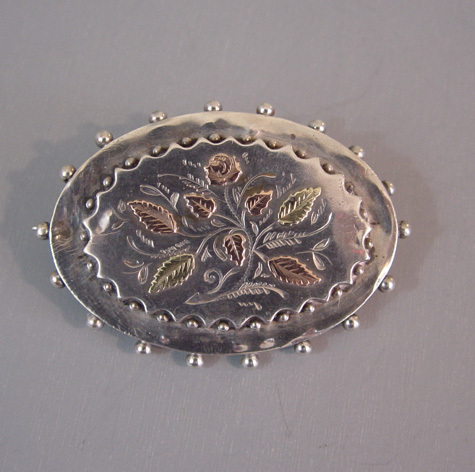 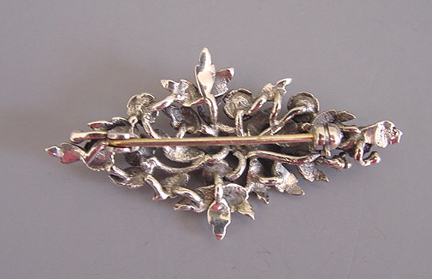 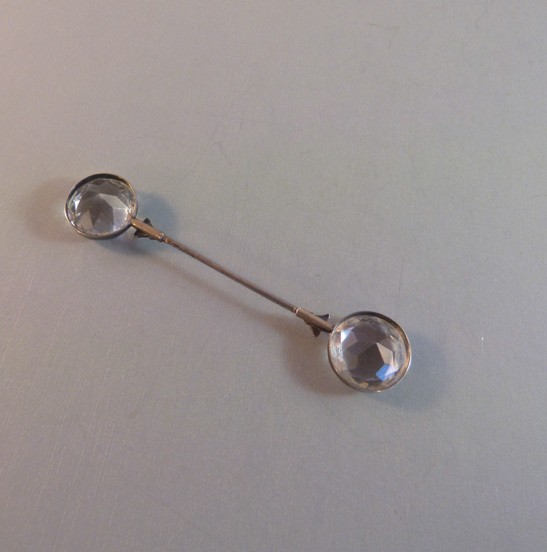 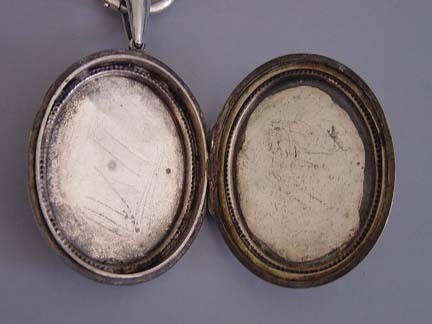 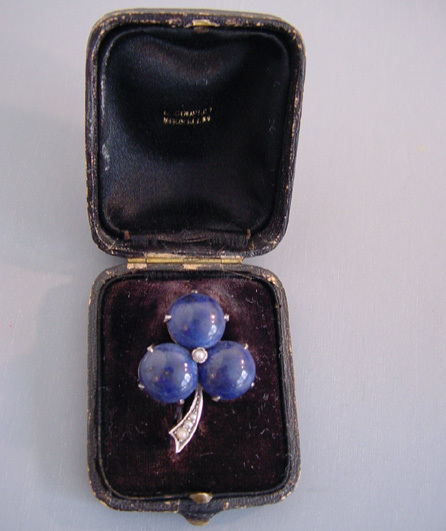 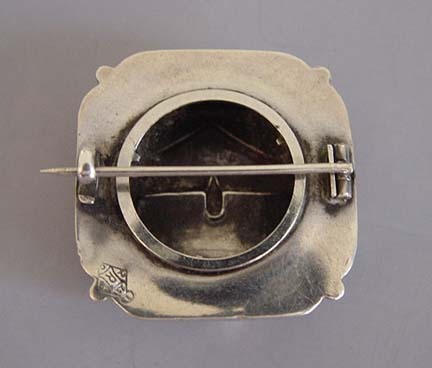 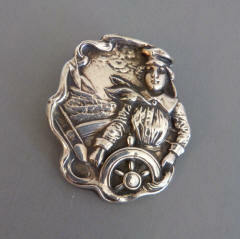 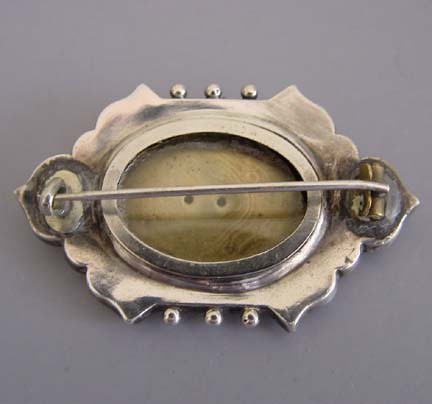 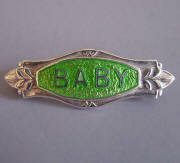 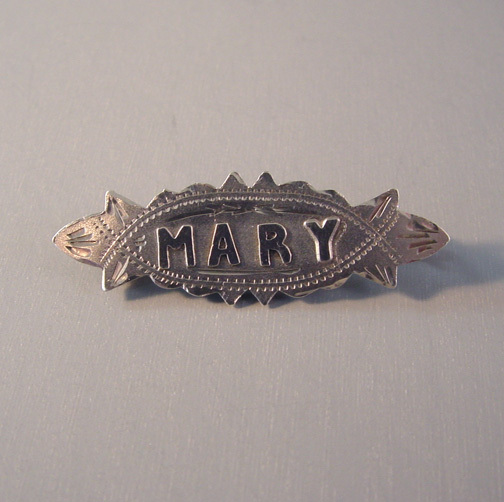 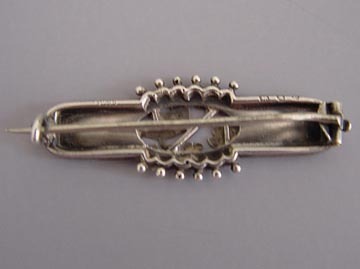 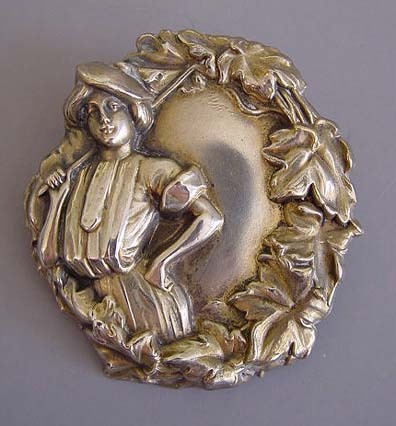 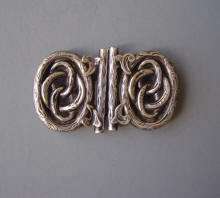 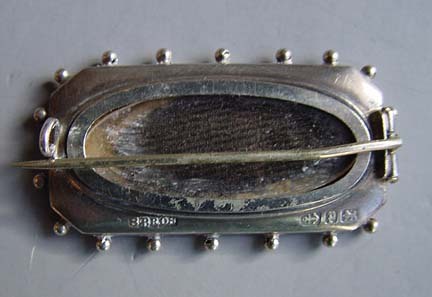 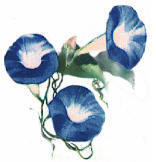 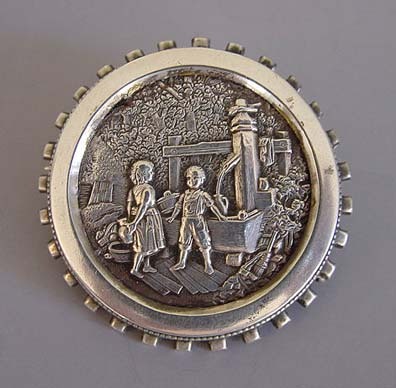 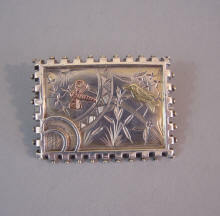 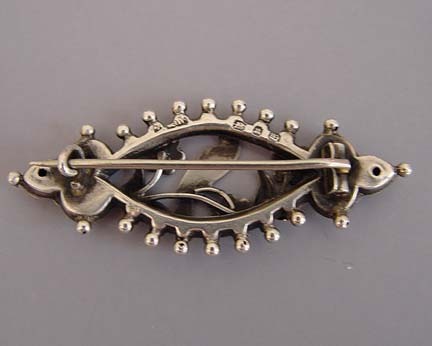 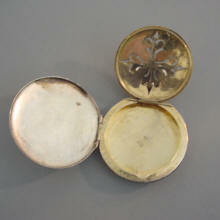 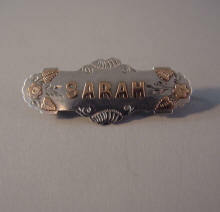 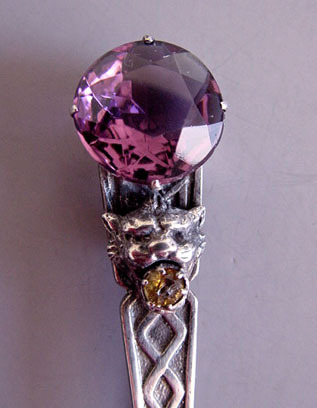 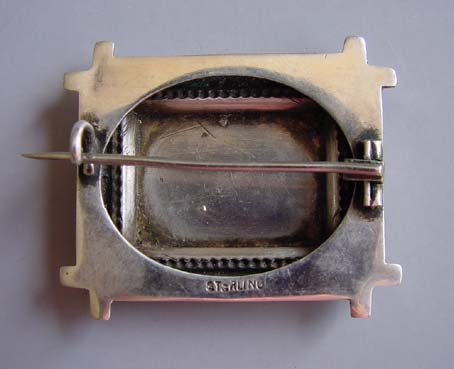 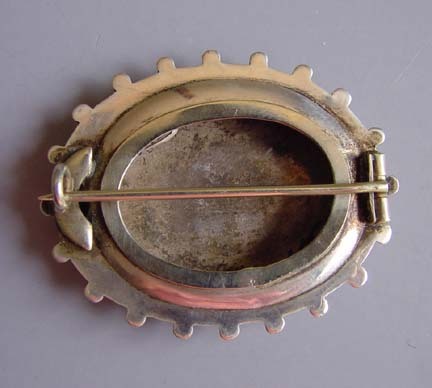 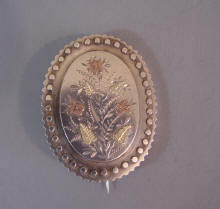 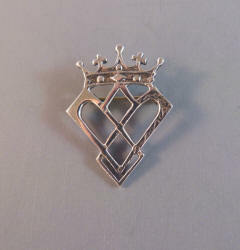 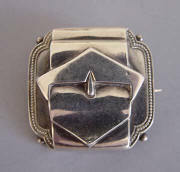 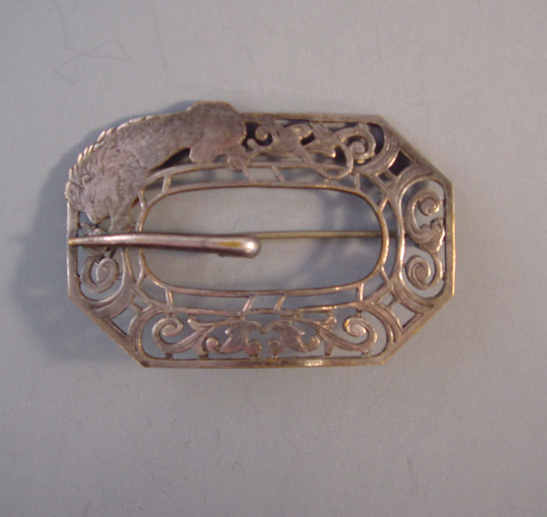 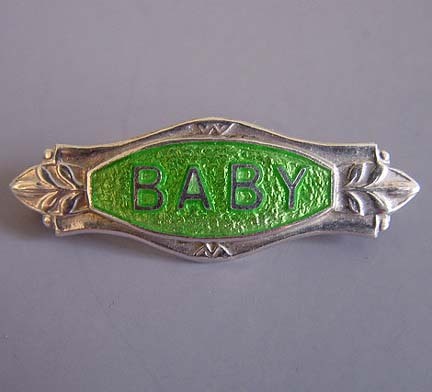 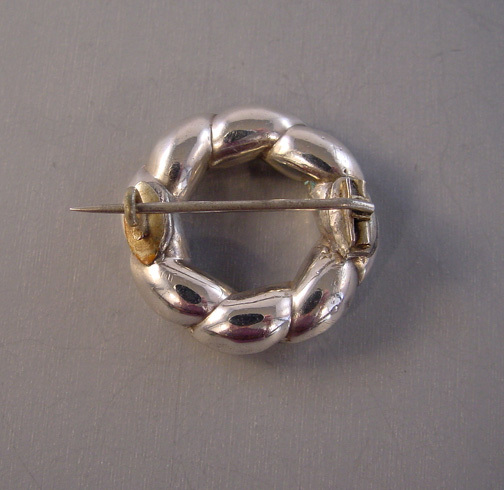 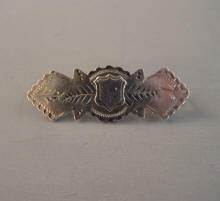 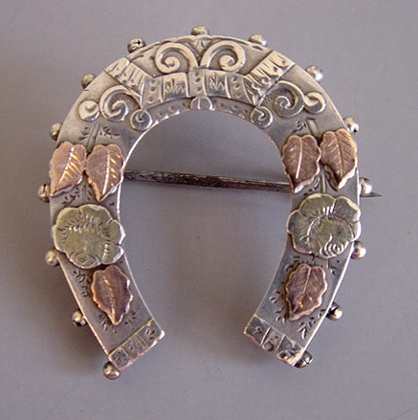 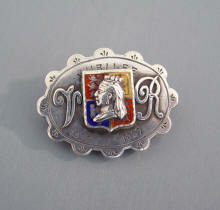 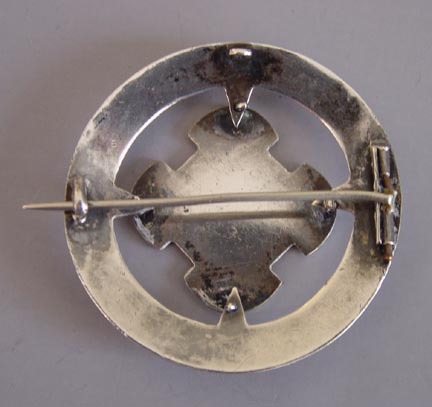 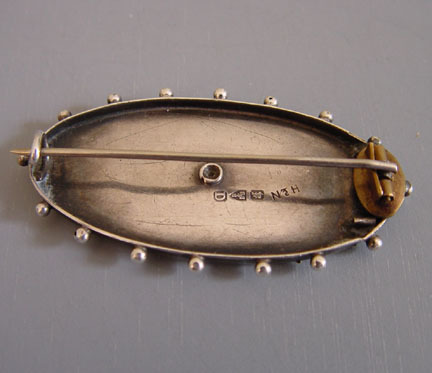 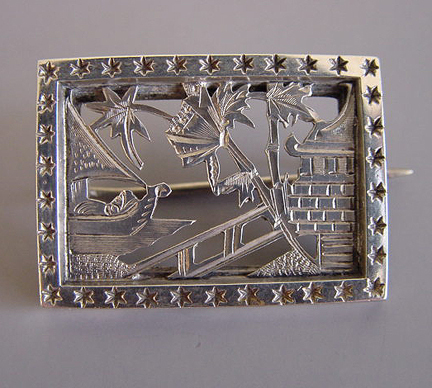 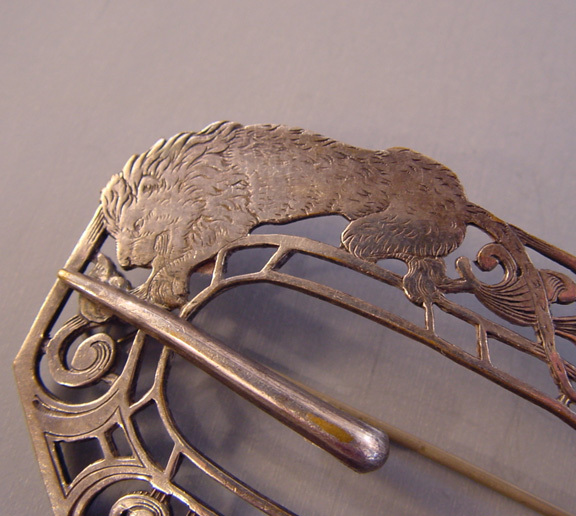 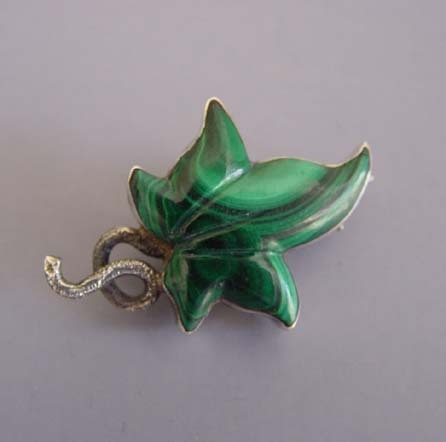 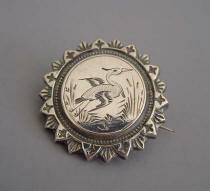 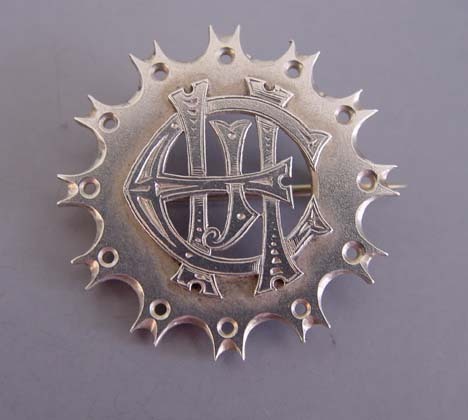 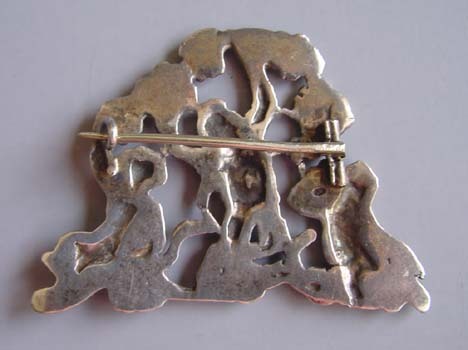 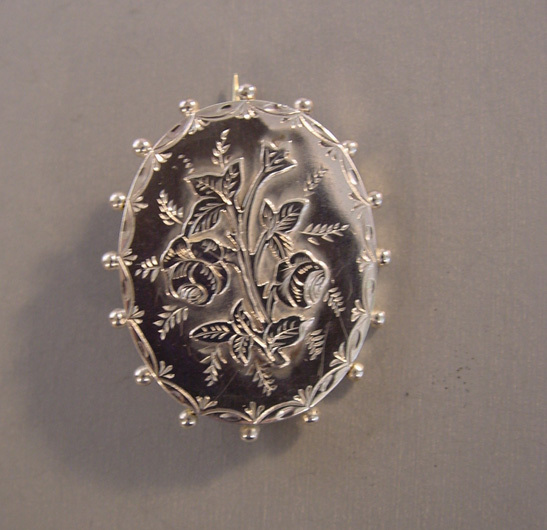 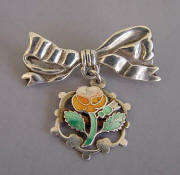 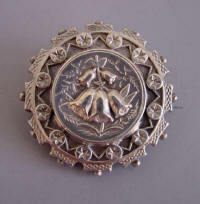 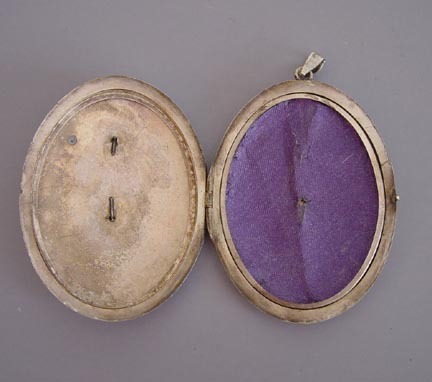 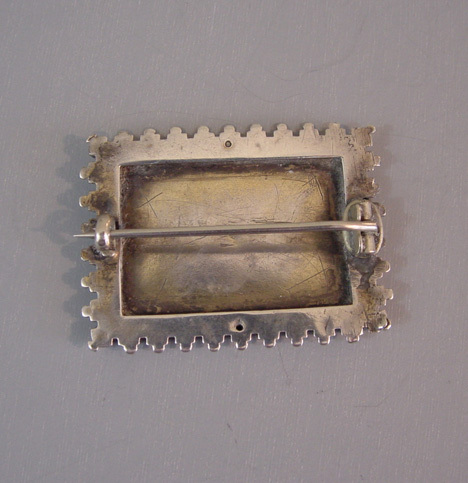 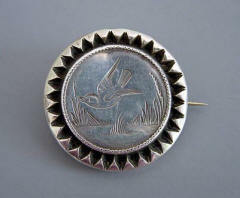 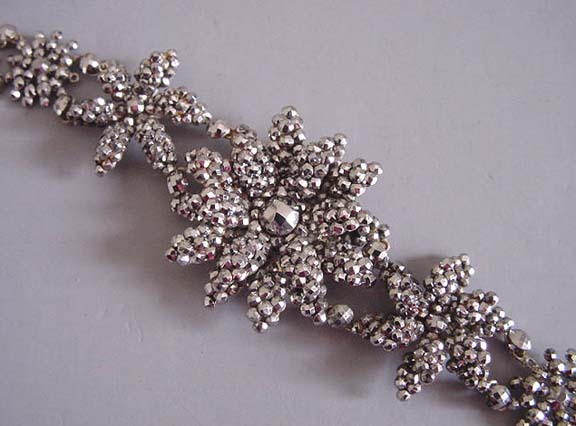 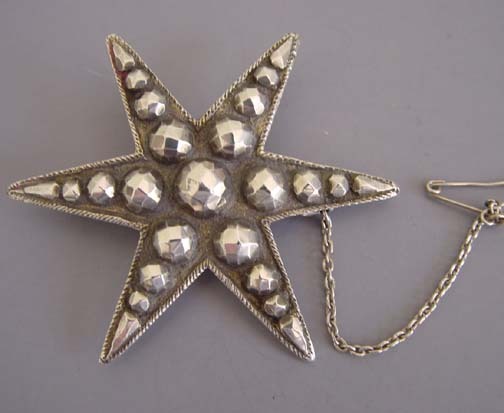 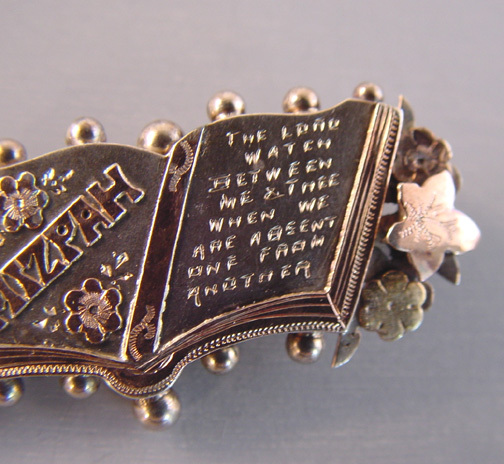 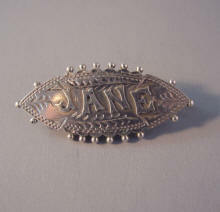 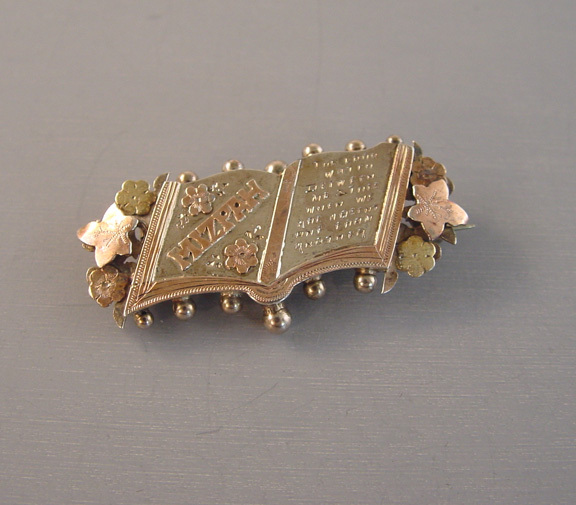 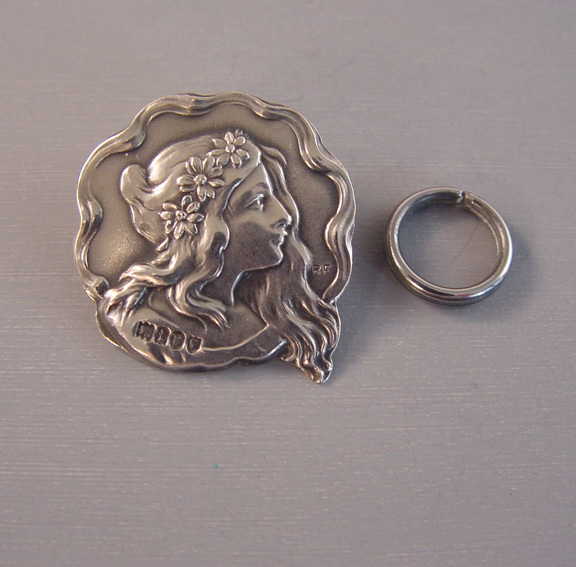 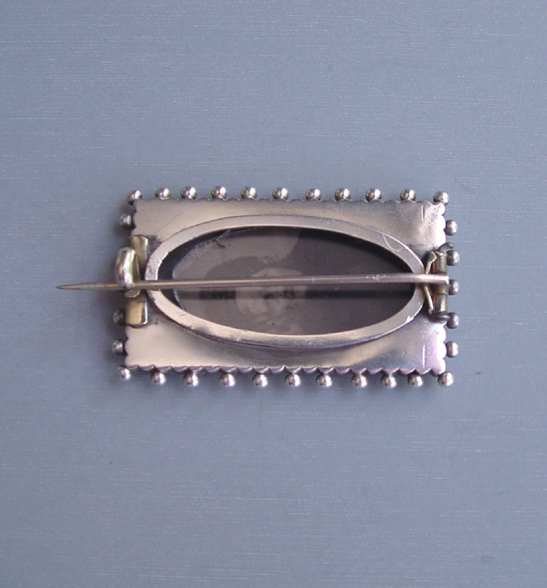 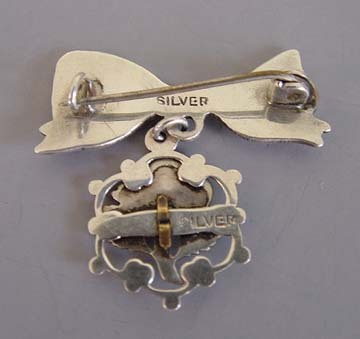 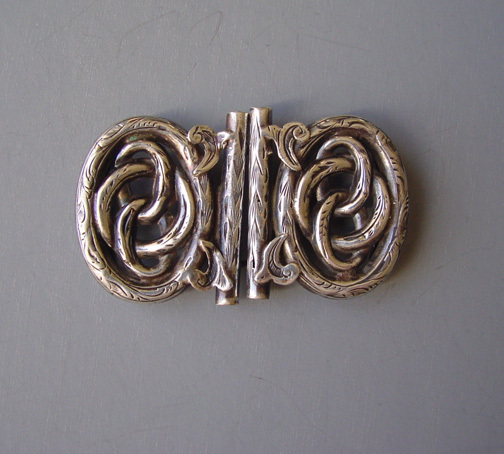 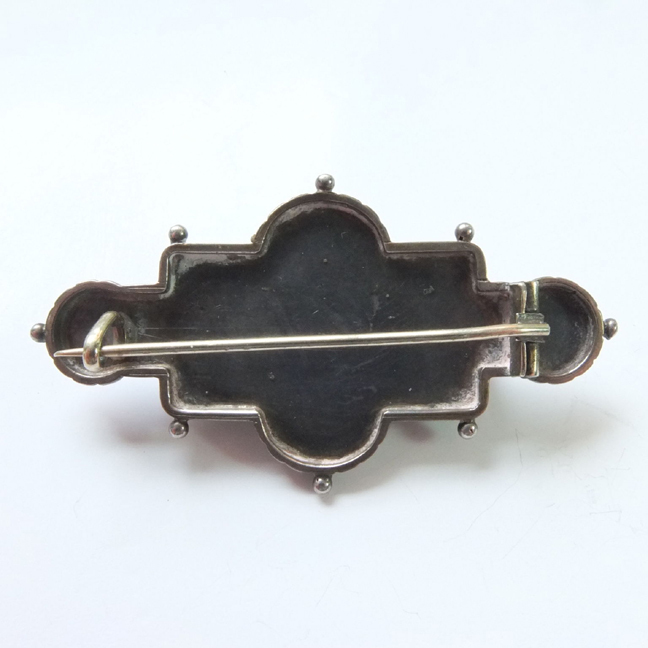 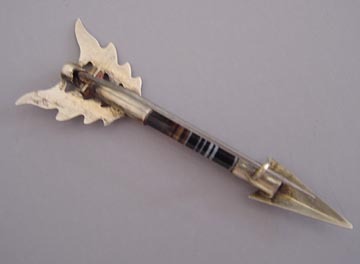 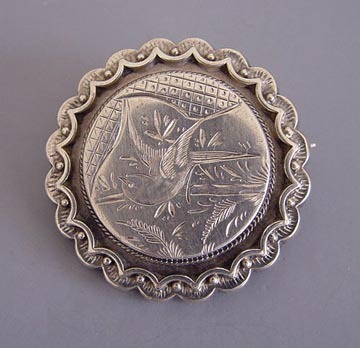 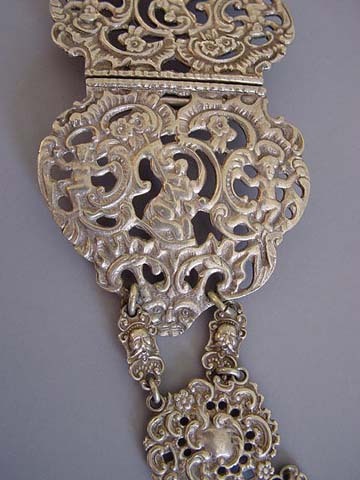 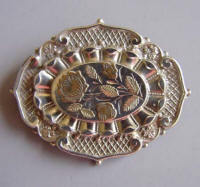 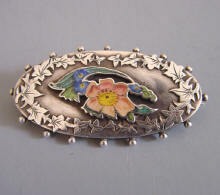 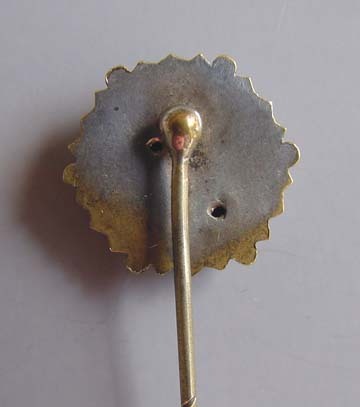 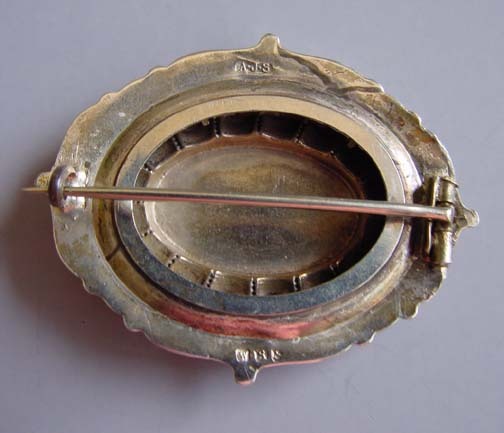 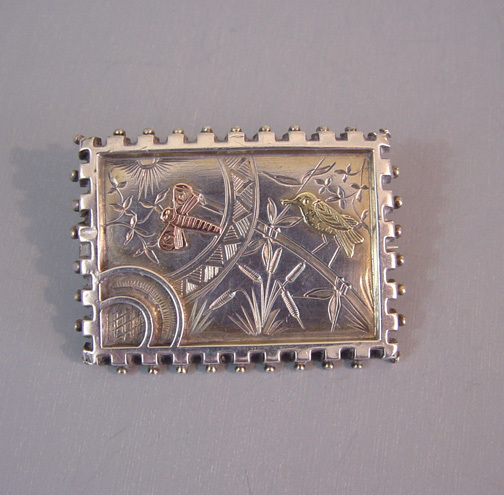 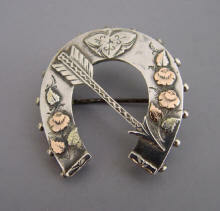 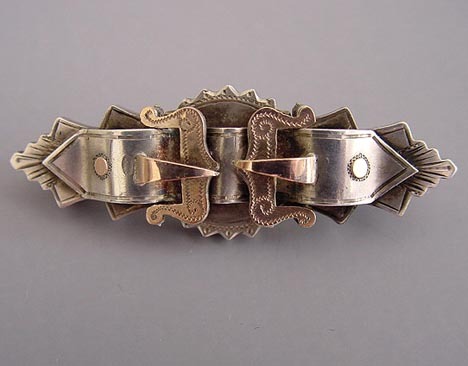 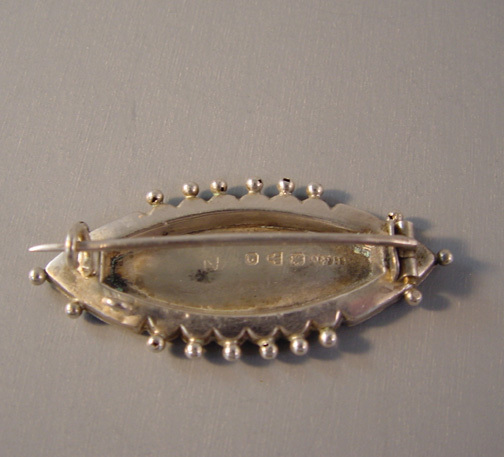 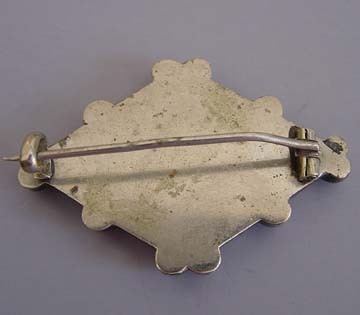 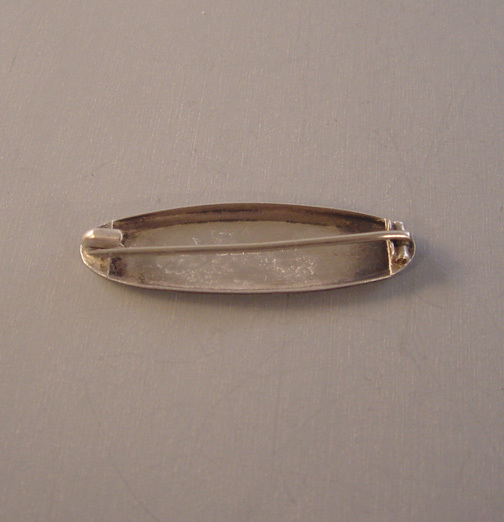 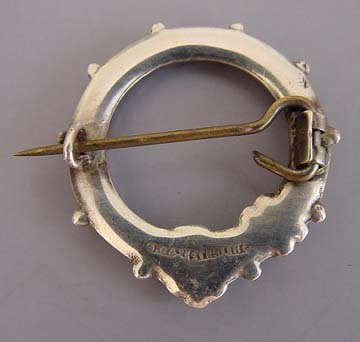 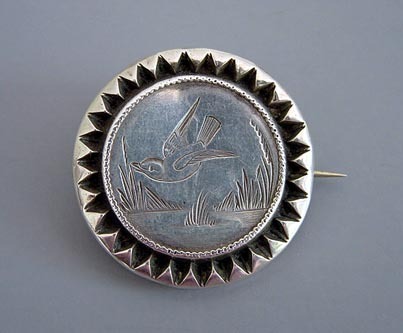 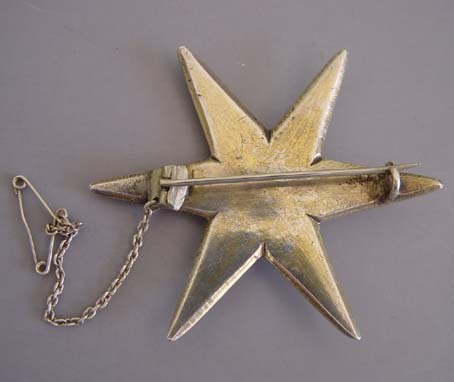 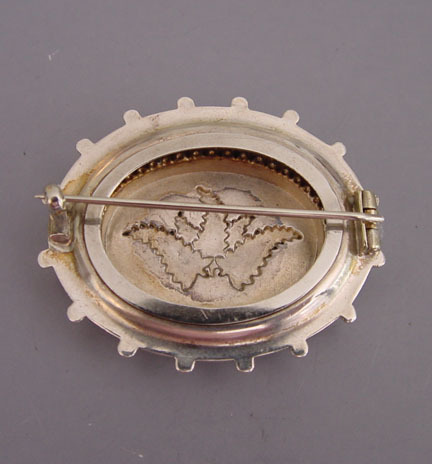 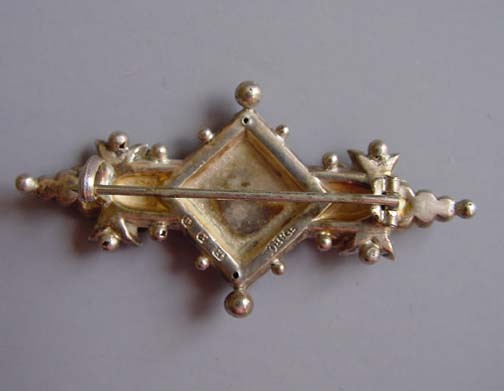 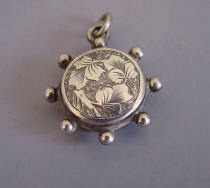 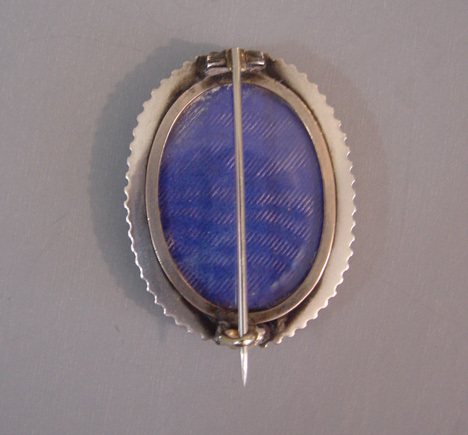 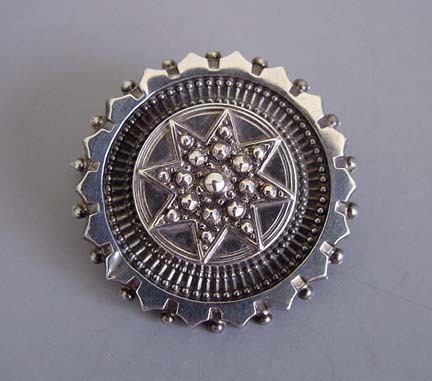 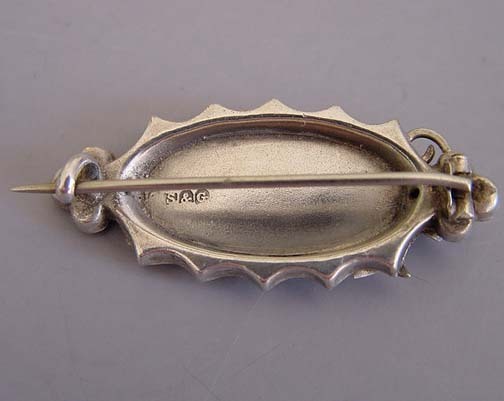 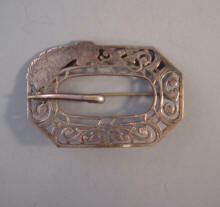 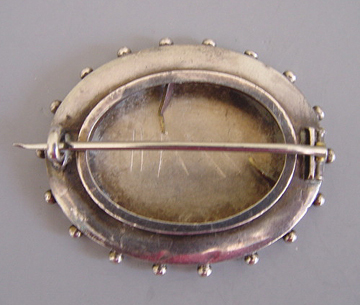 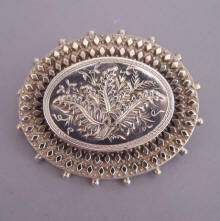 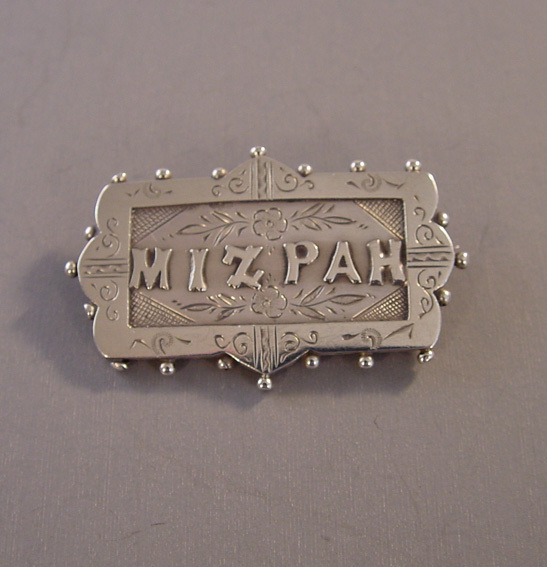 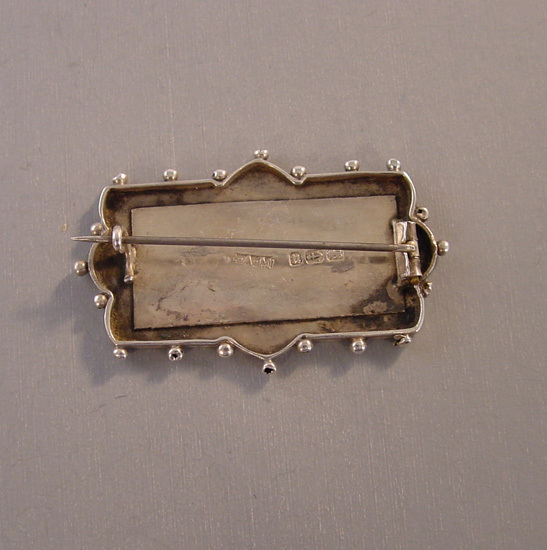 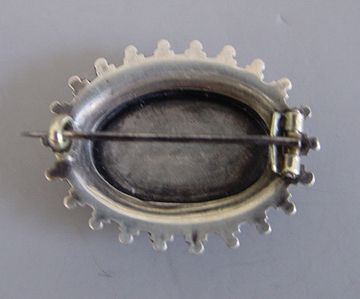 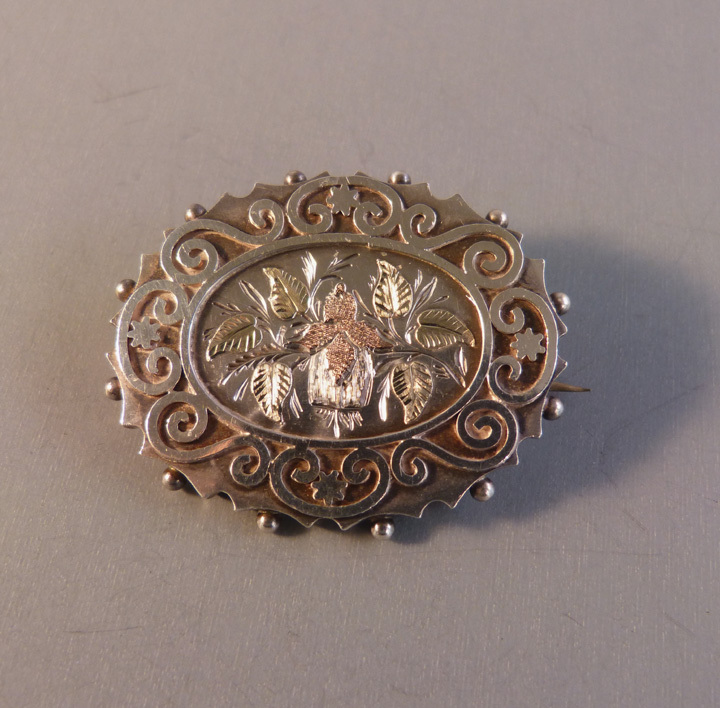 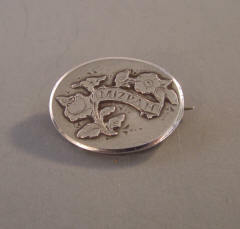 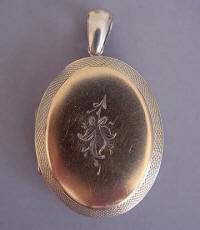 Brooches like this can be seen in Benjamin's "Antique Jewellery" on page 140. 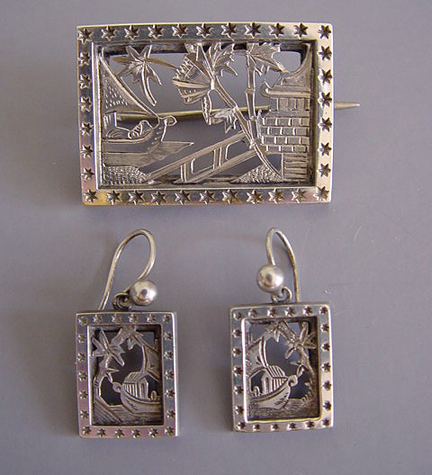 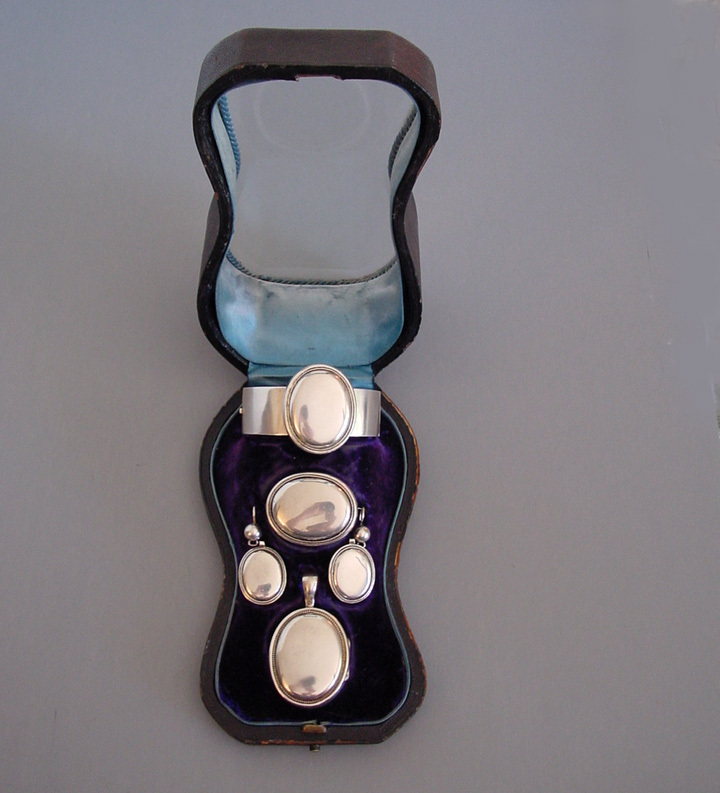 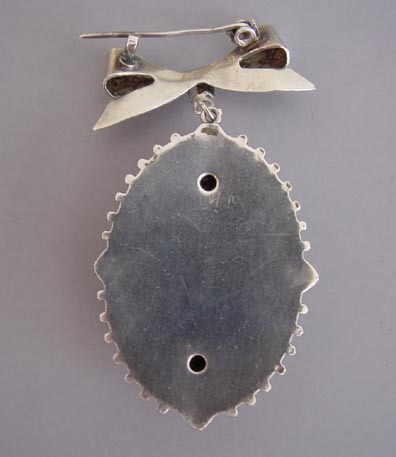 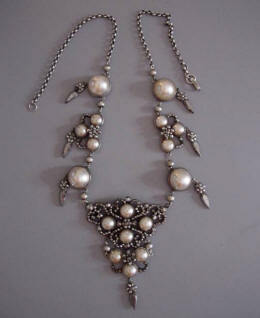 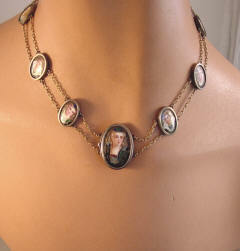 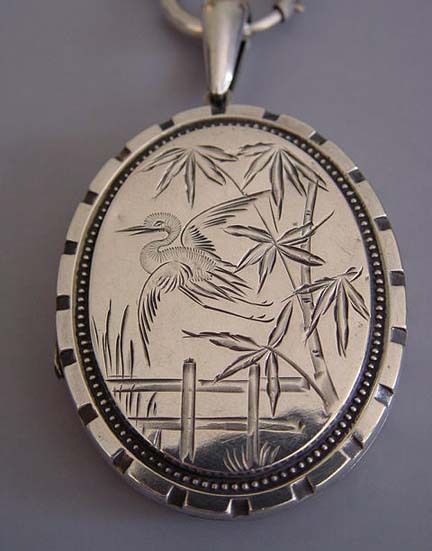 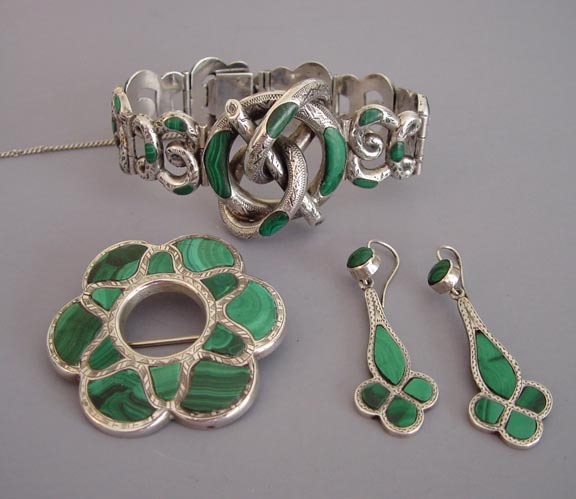 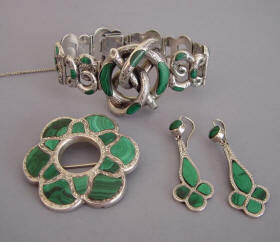 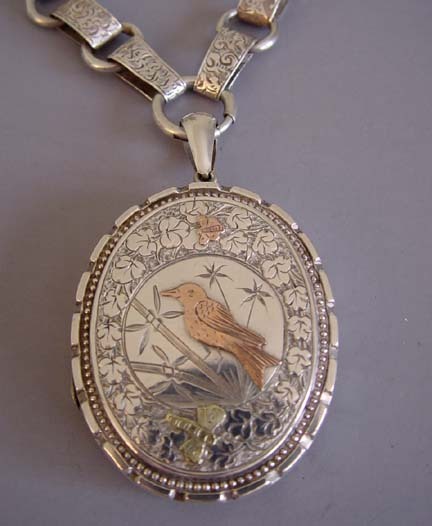 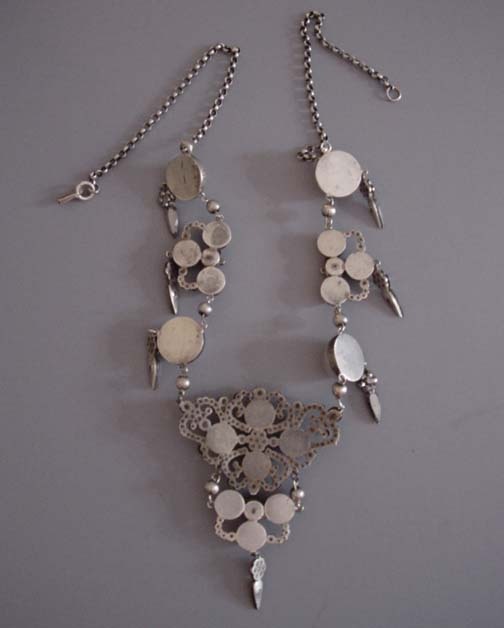 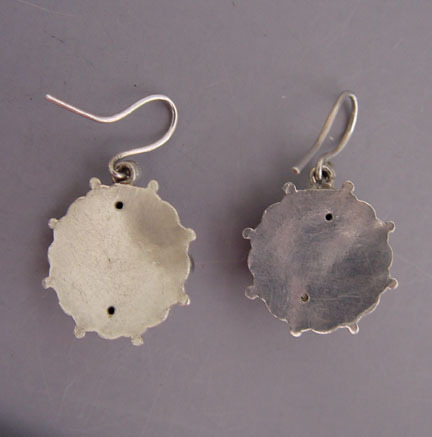 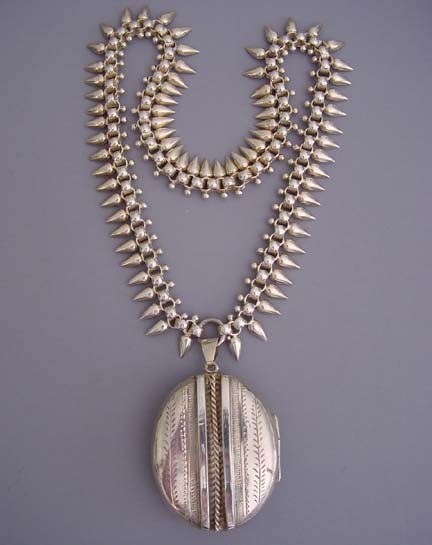 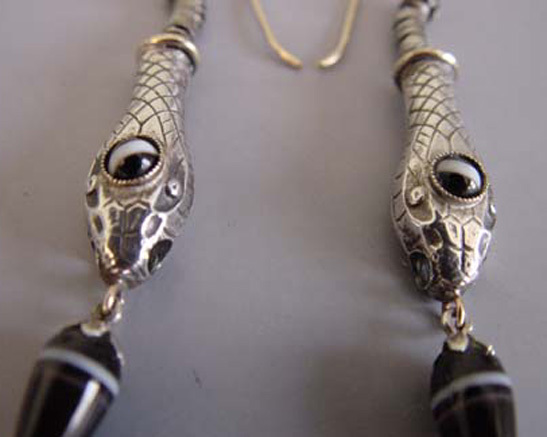 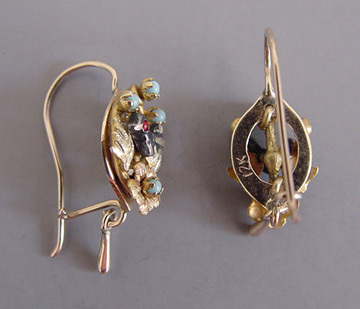 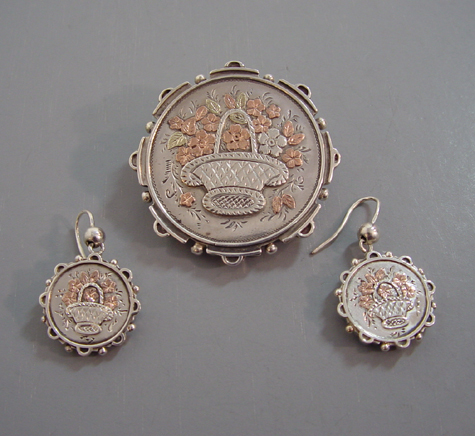 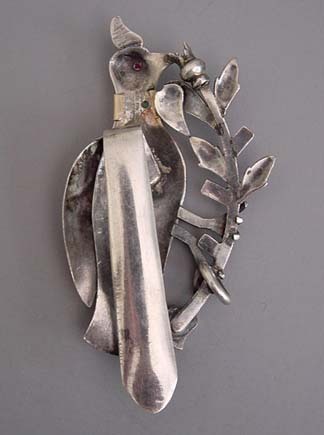 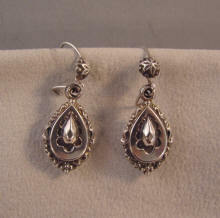 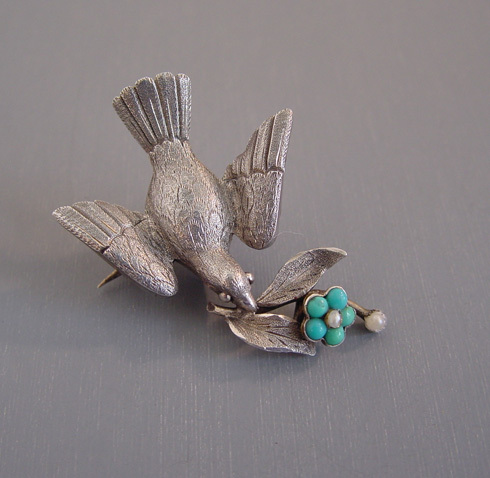 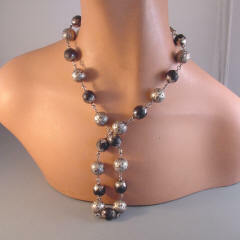 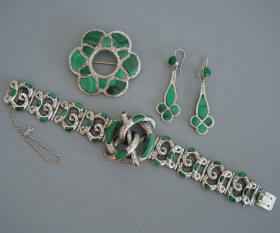 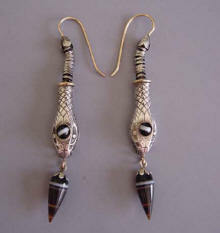 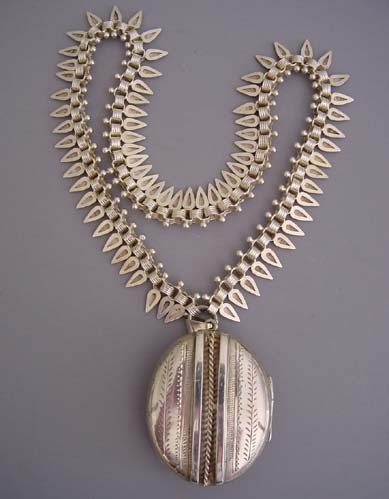 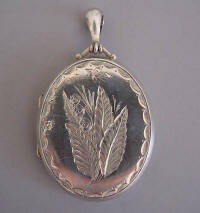 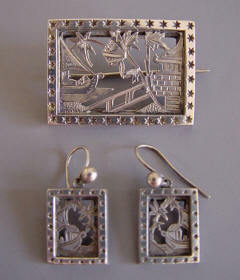 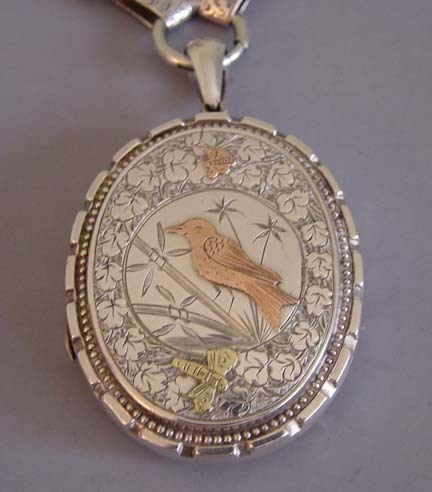 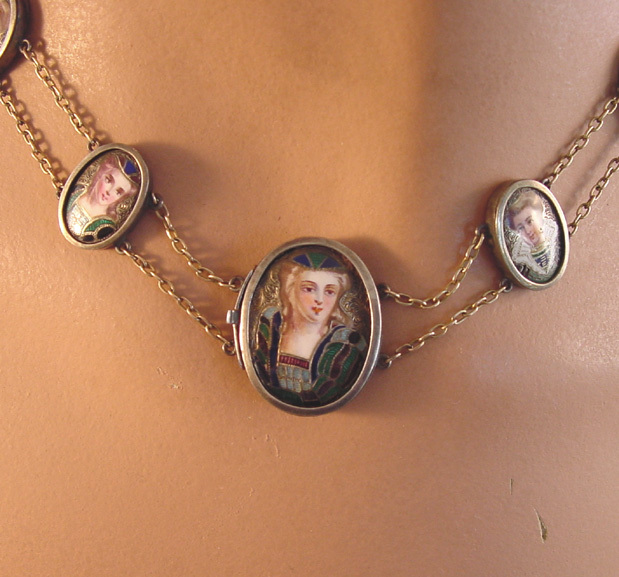 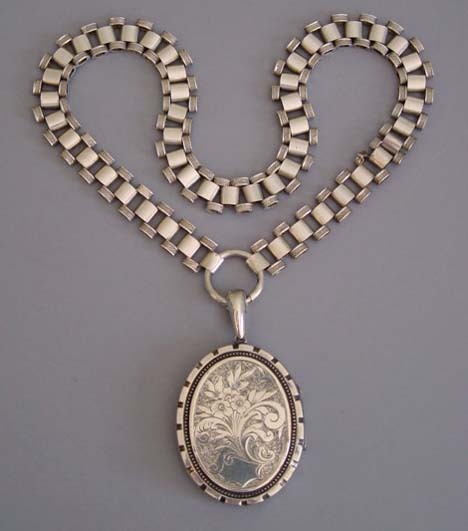 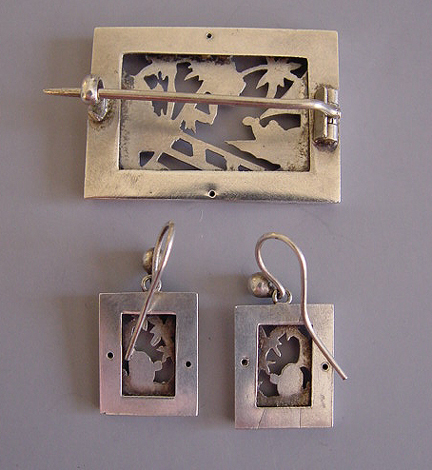 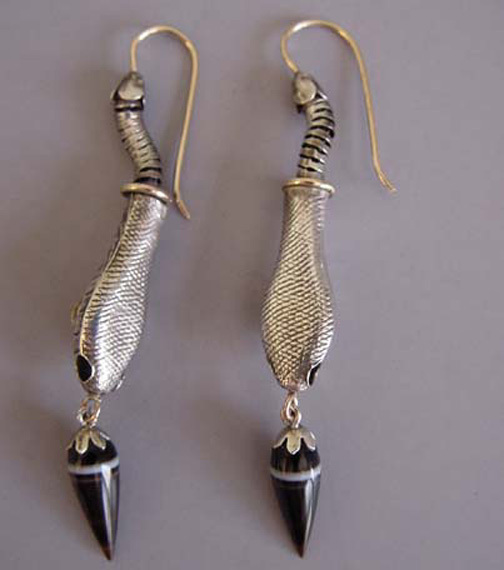 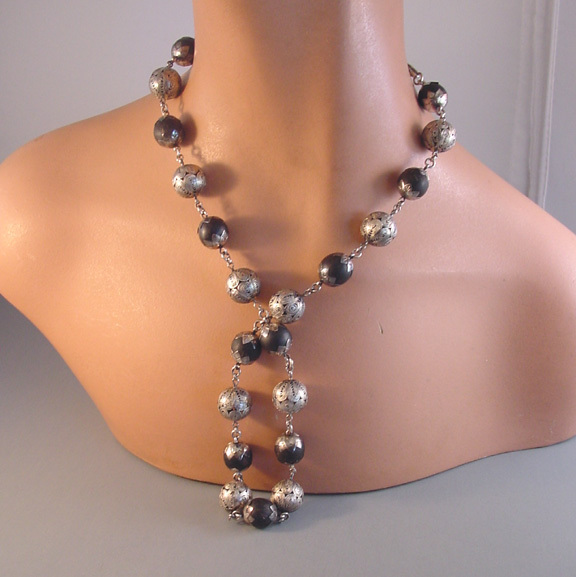 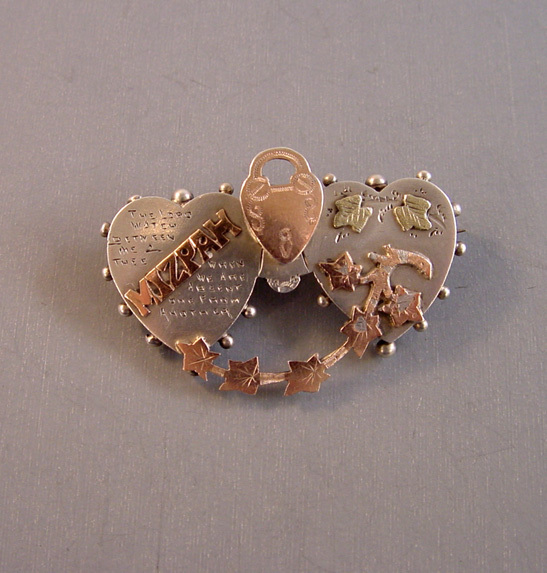 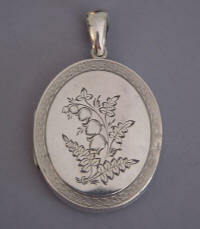 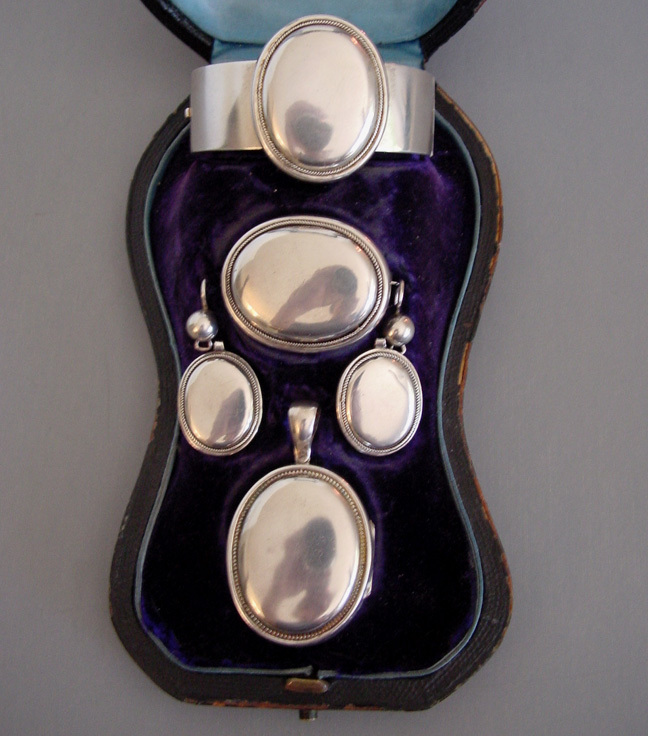 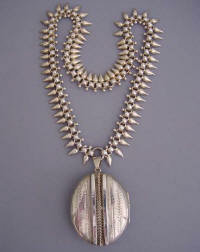 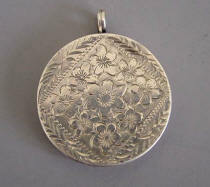 Similar pieces can also be seen in the book, "Warman's Jewelry" 2nd Edition by Christie Romero on page 64. 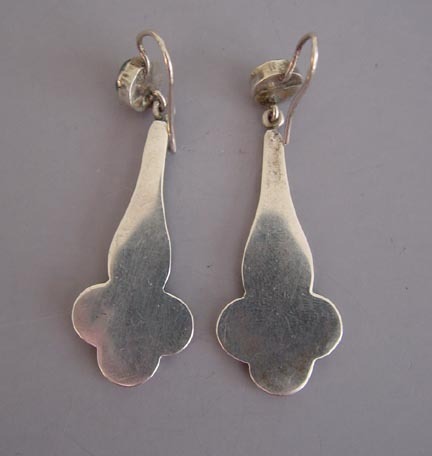 Woodstock was a small town outside Oxford, England, site of the most famous cut steel workshops circa 1761. 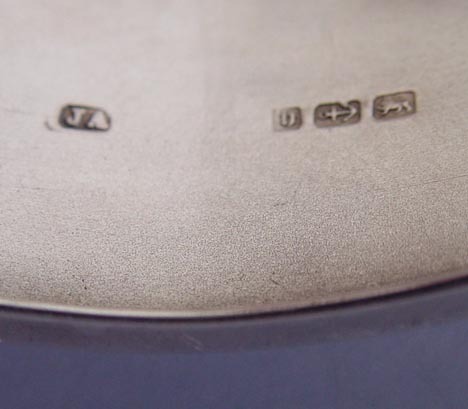 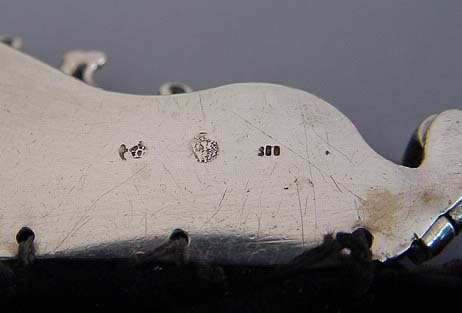 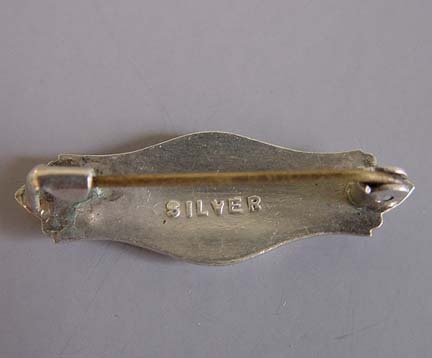 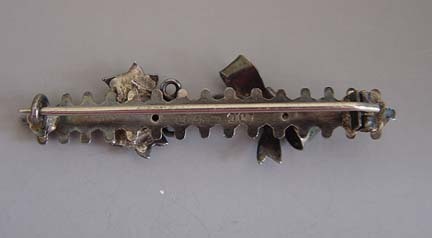 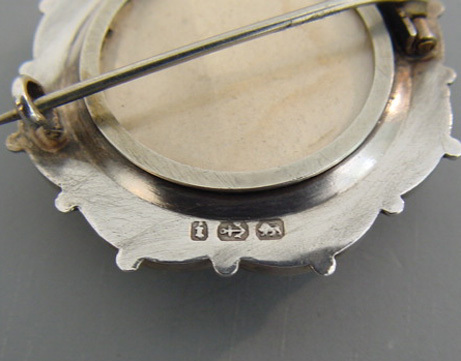 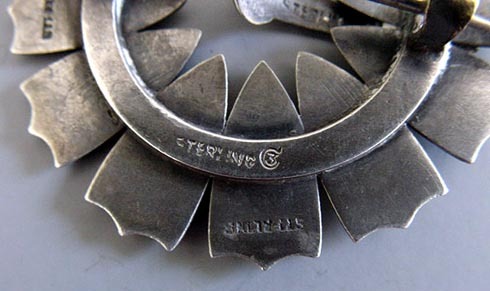 A jeweler during that time to have been selling cut steel jewelry a price higher than gold. 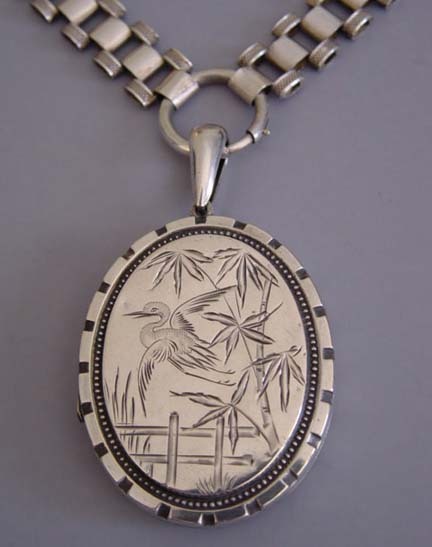 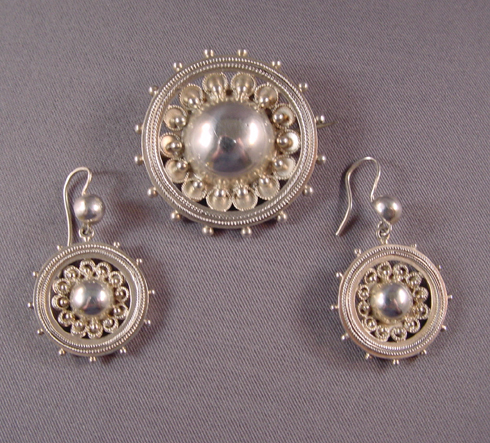 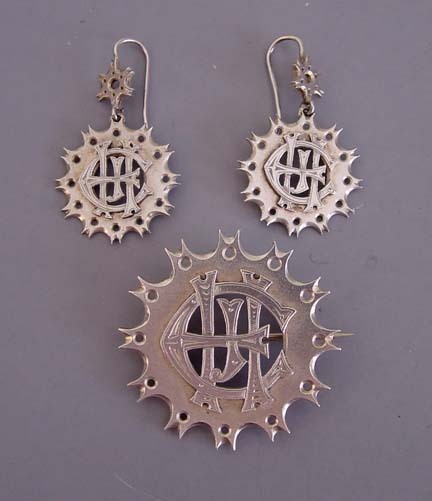 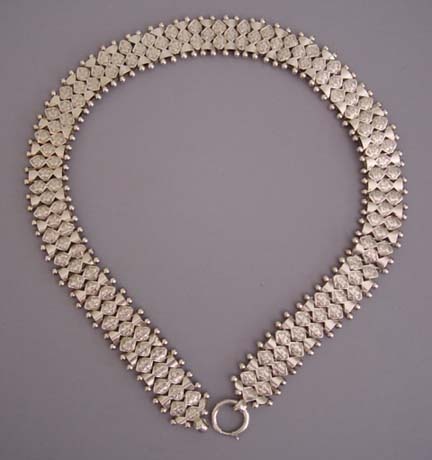 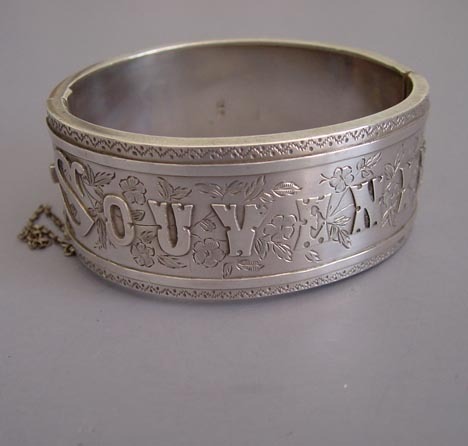 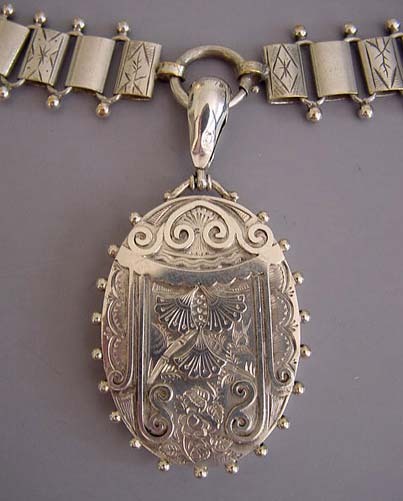 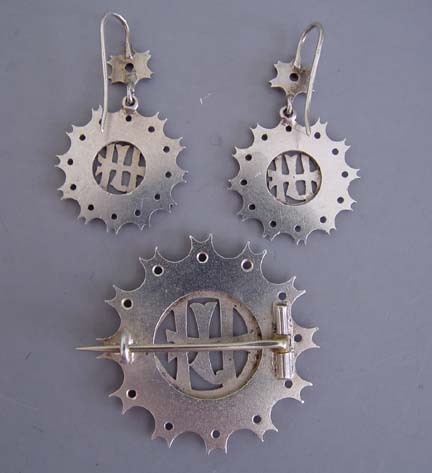 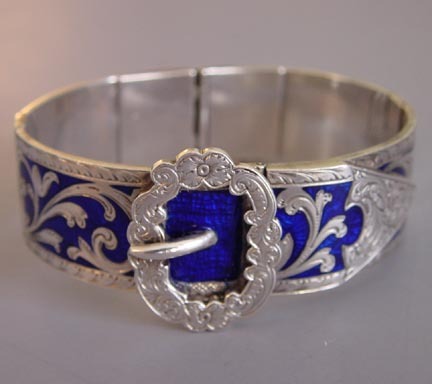 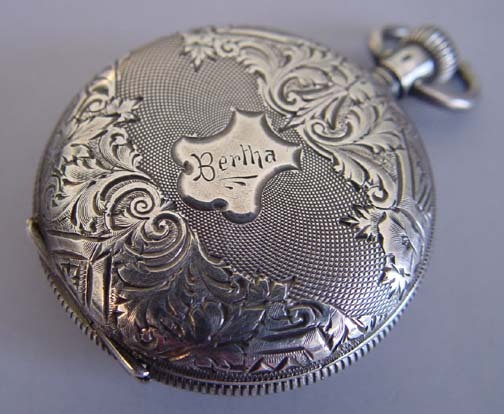 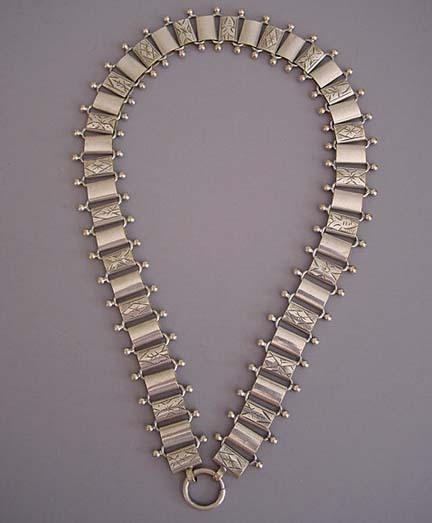 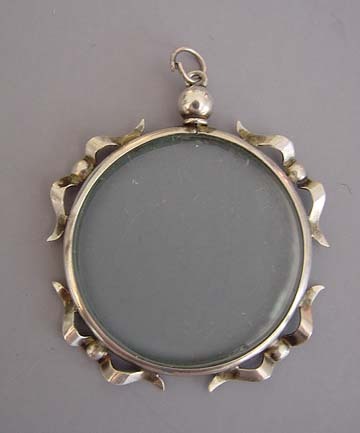 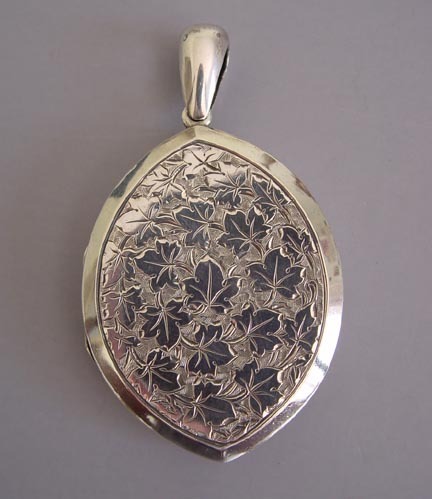 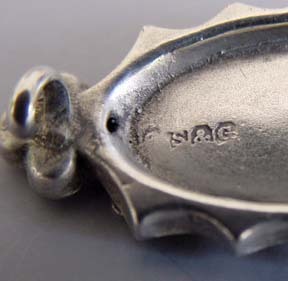 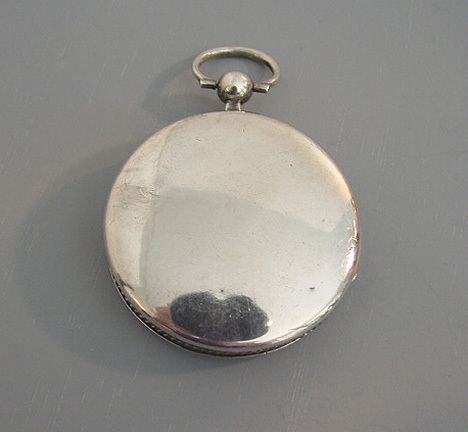 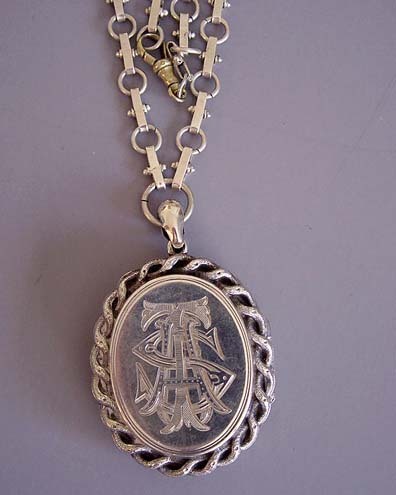 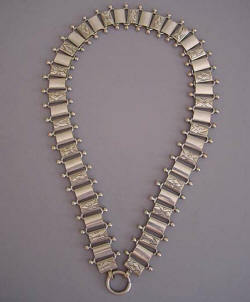 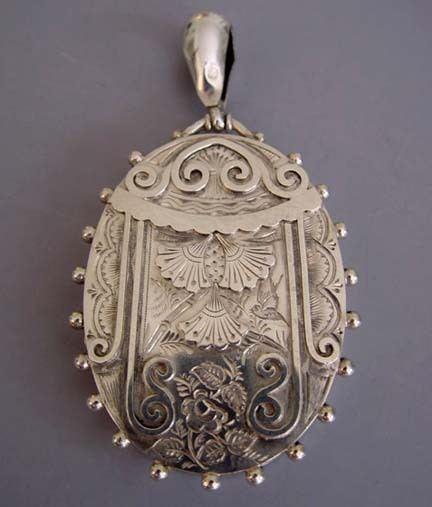 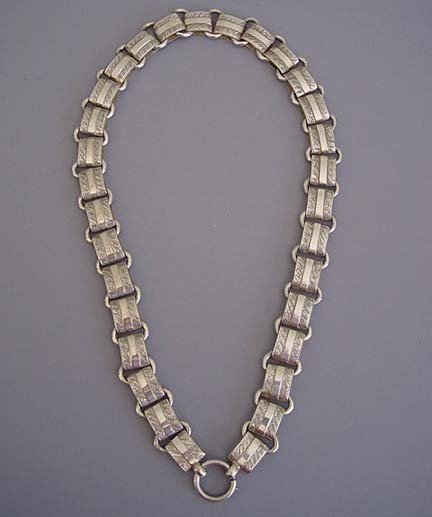 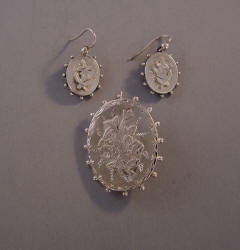 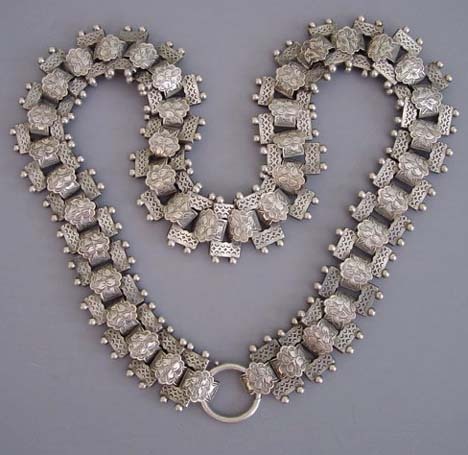 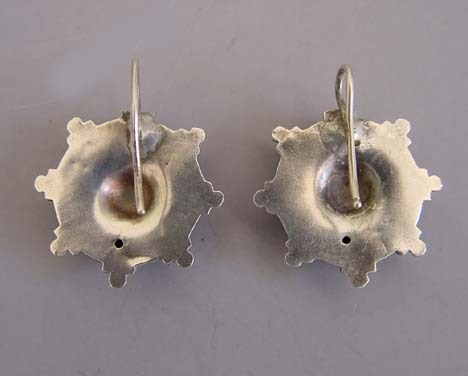 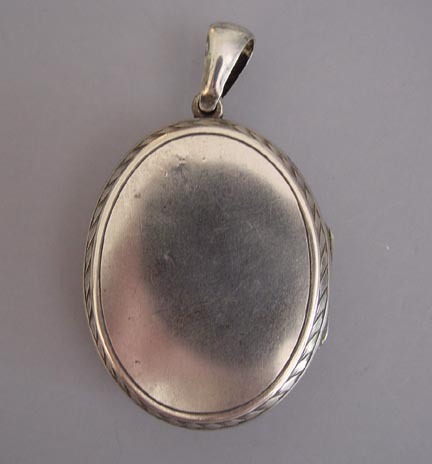 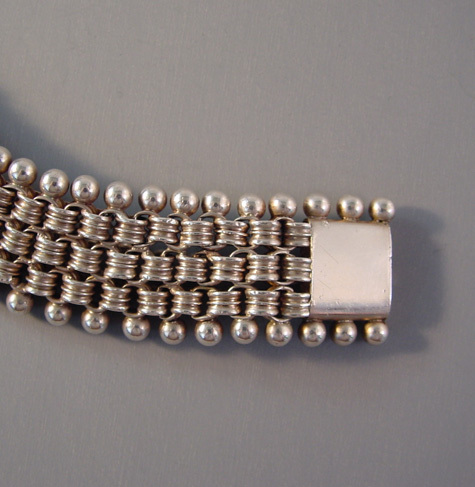 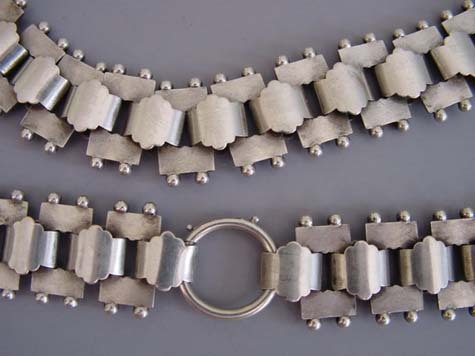 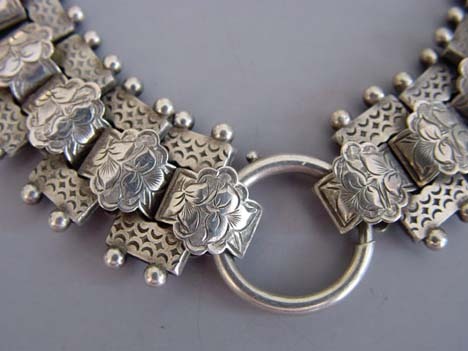 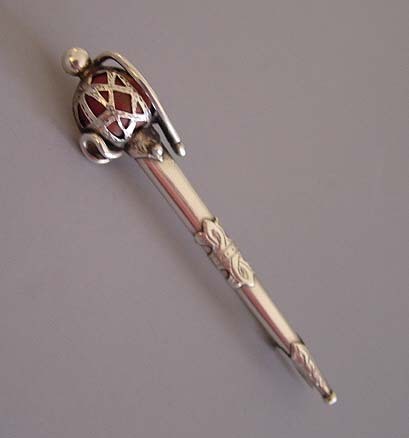 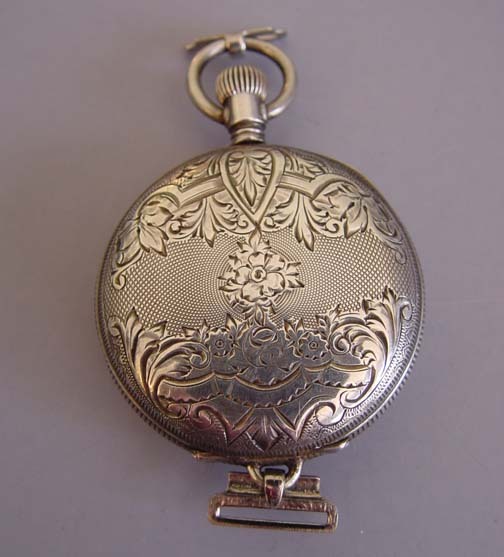 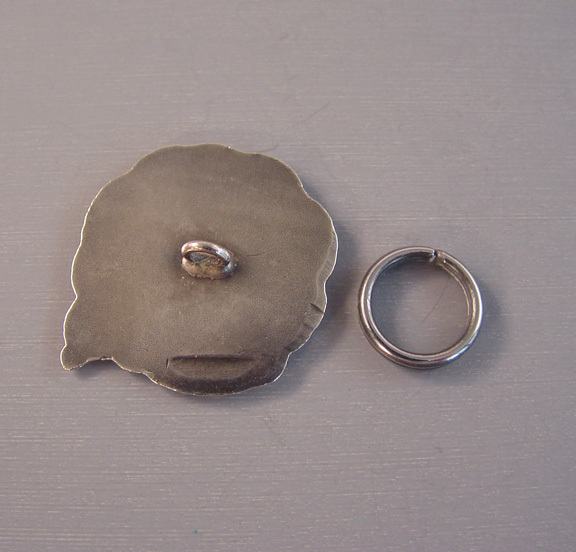 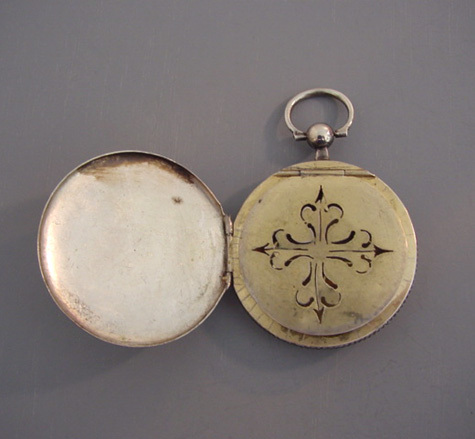 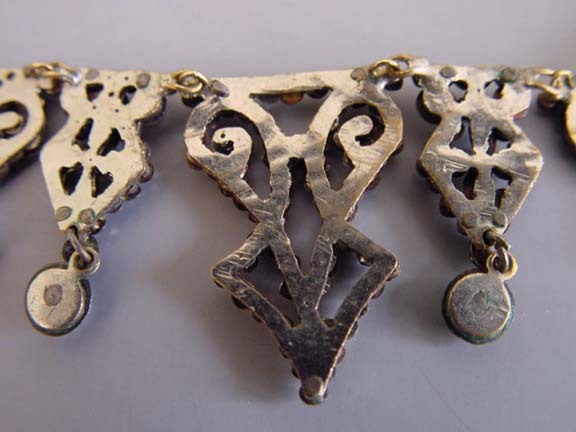 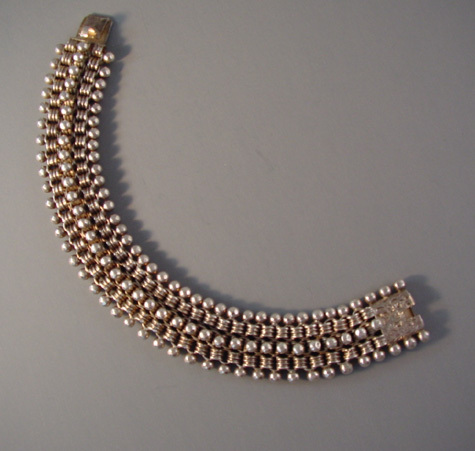 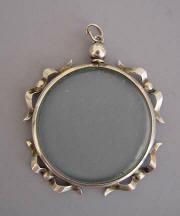 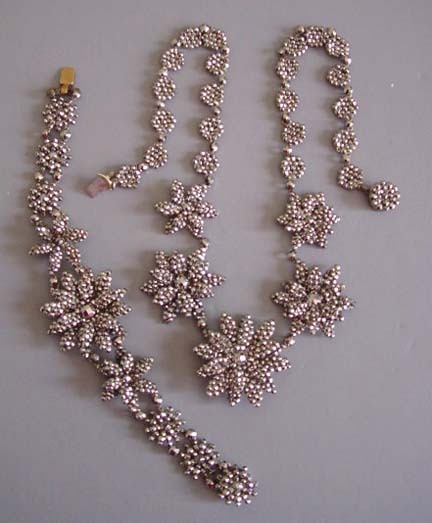 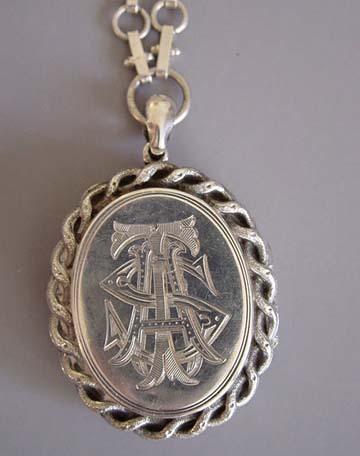 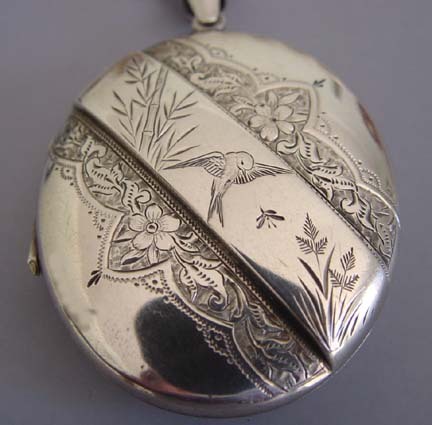 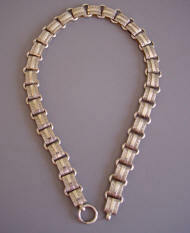 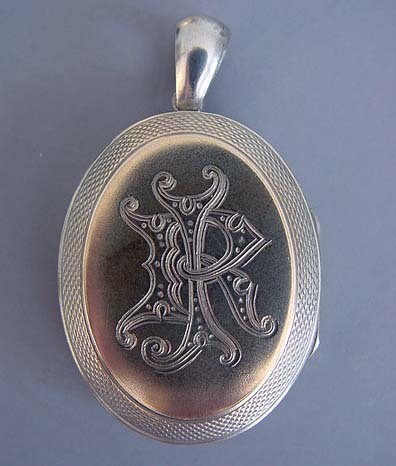 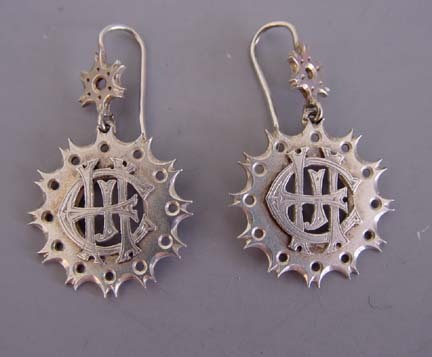 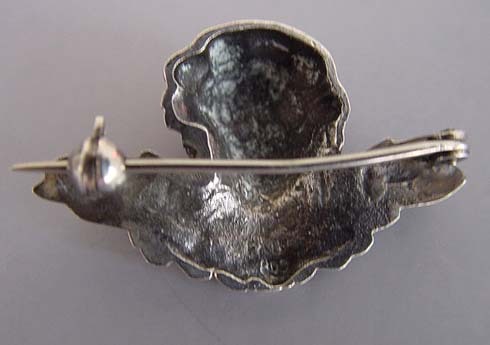 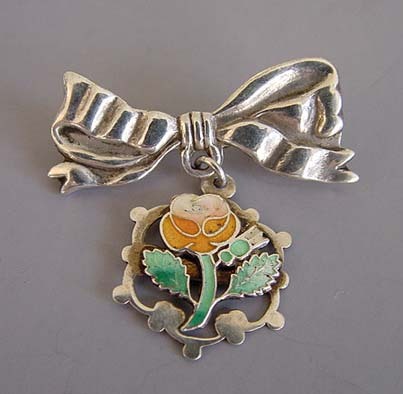 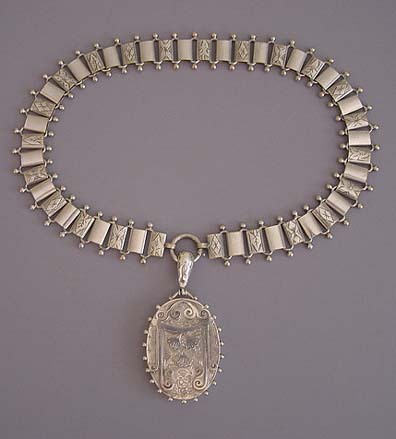 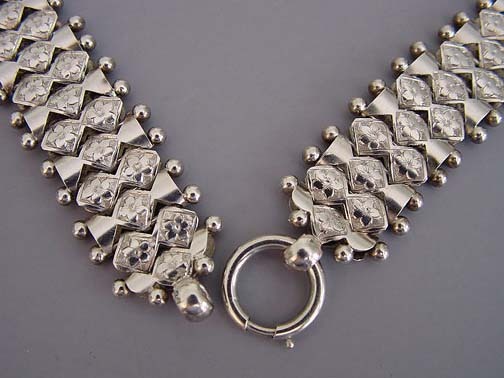 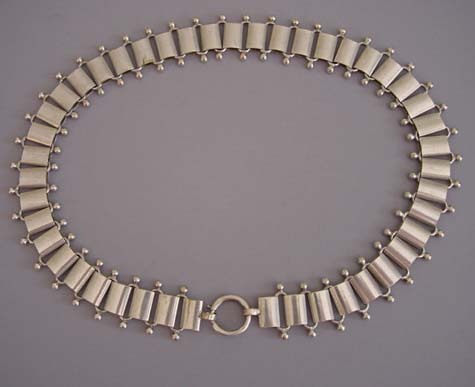 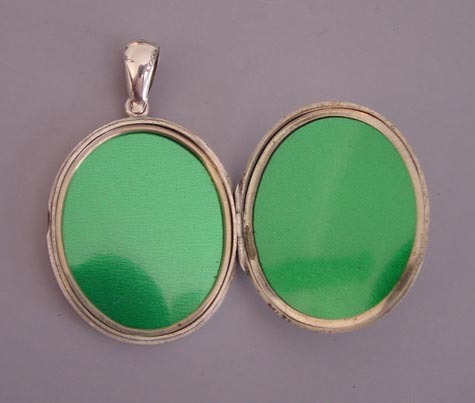 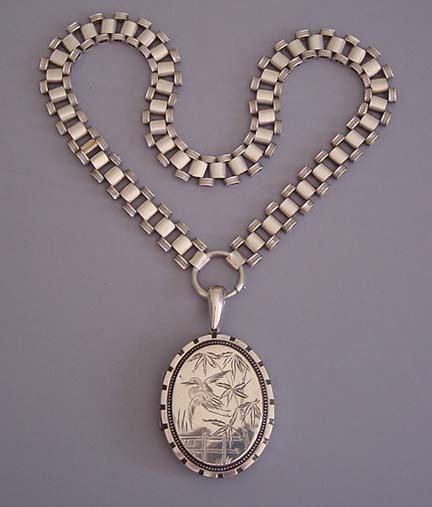 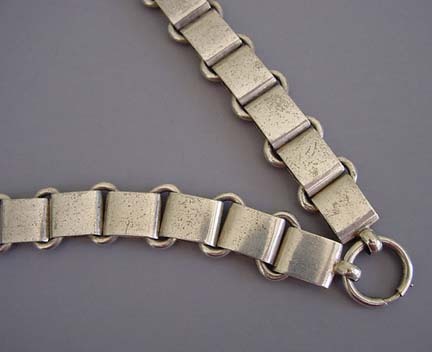 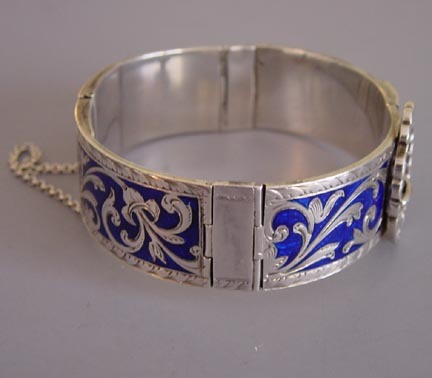 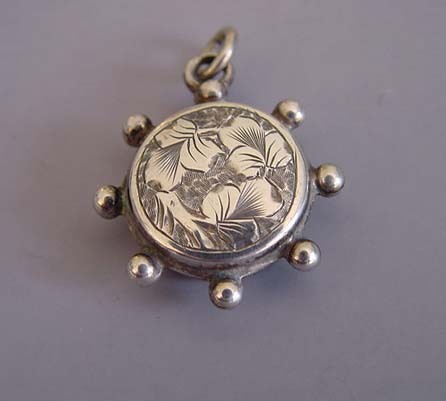 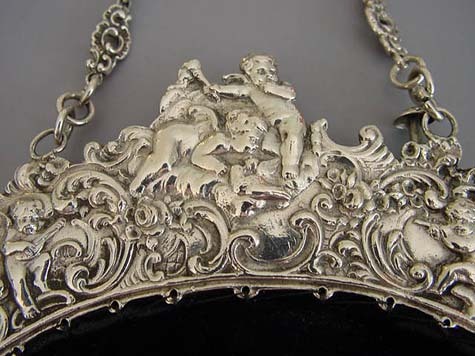 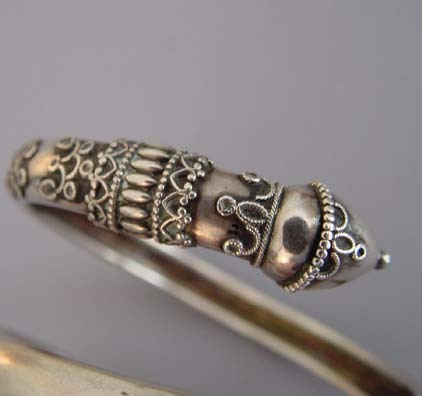 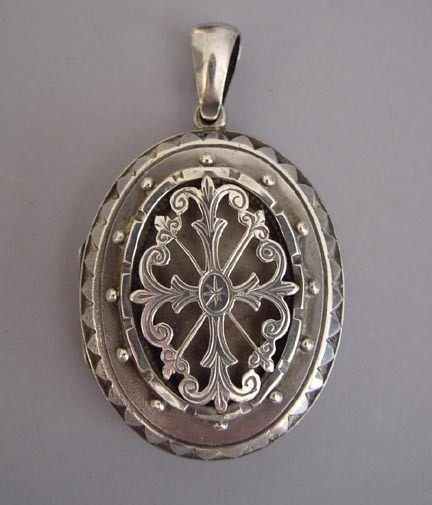 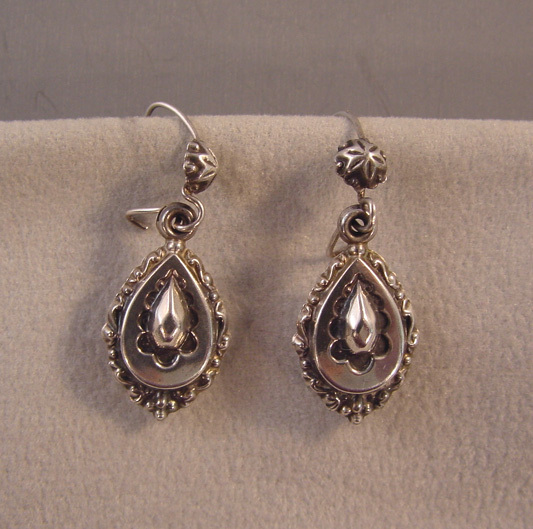 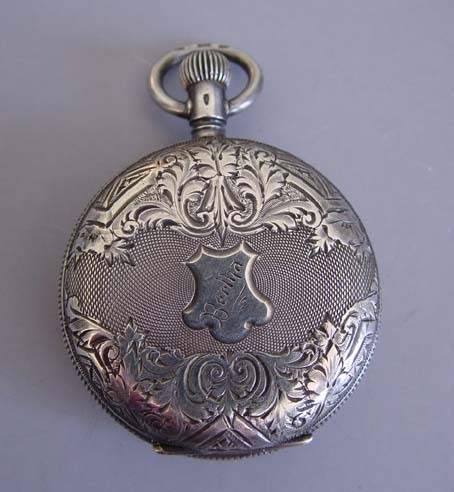 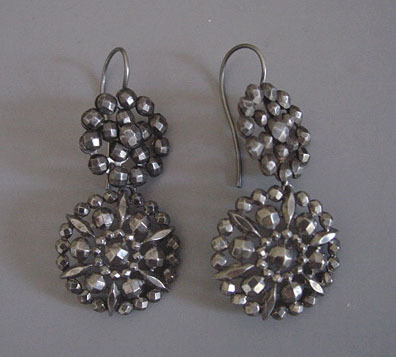 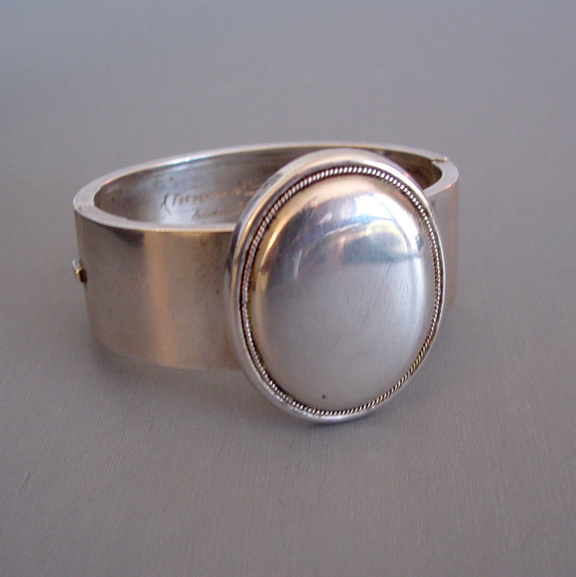 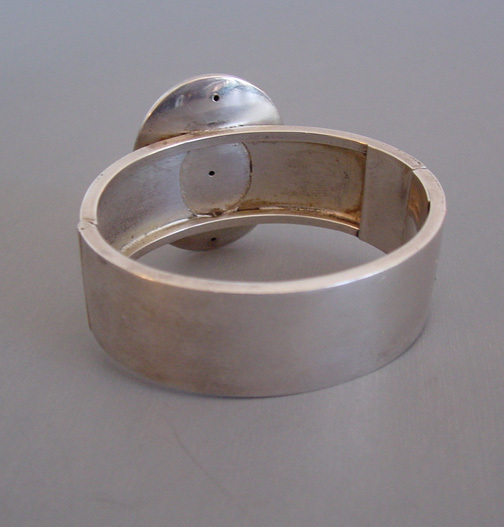 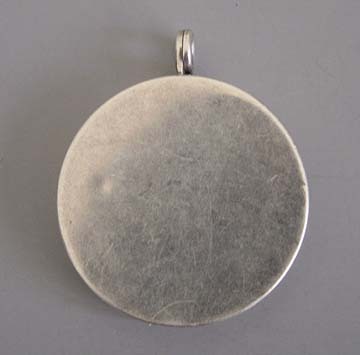 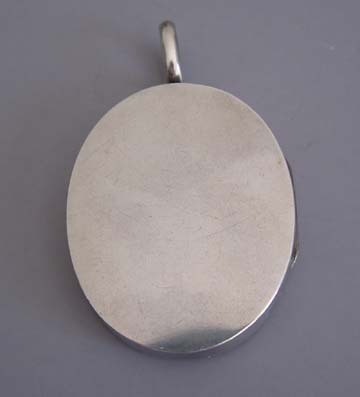 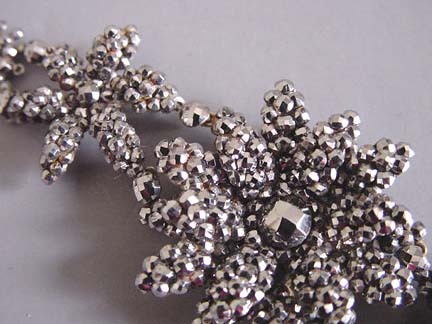 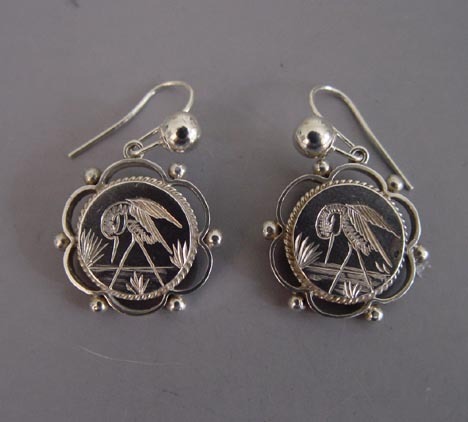 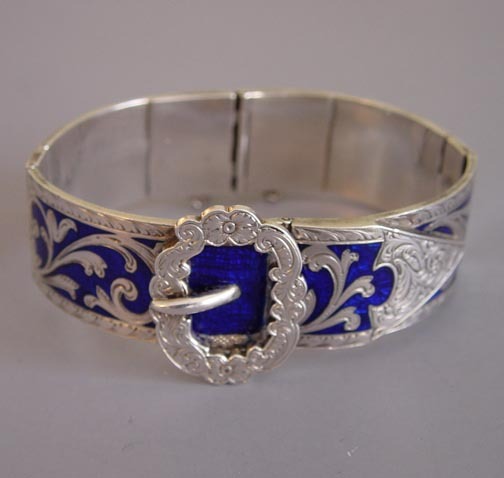 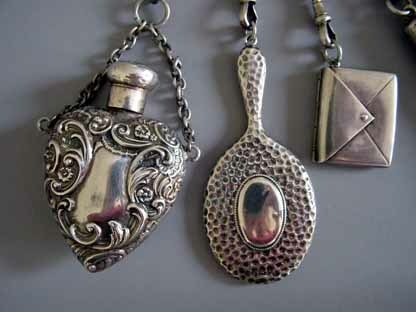 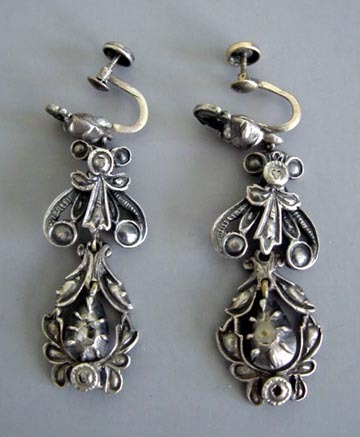 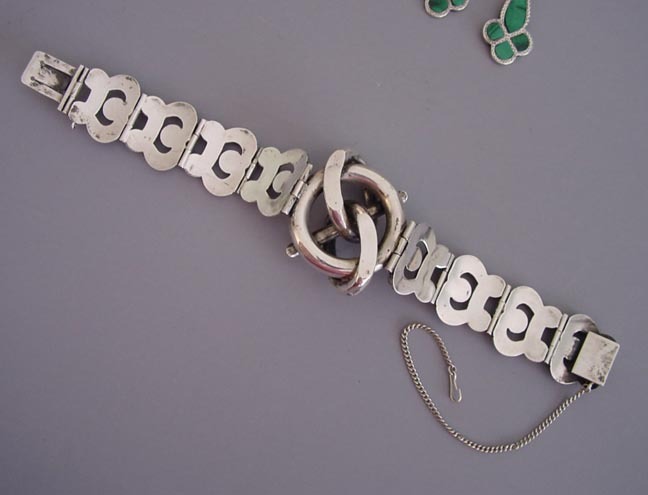 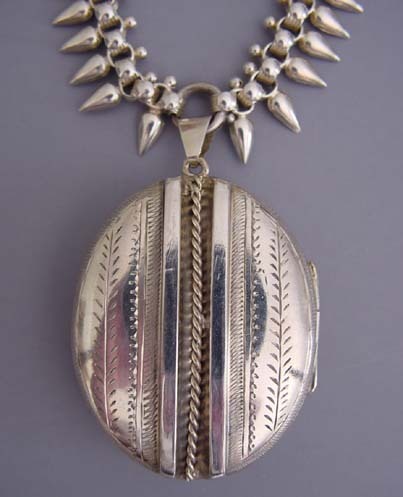 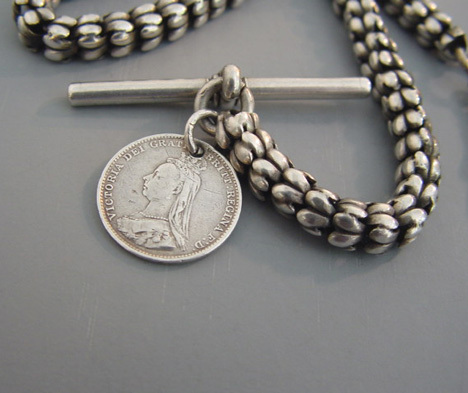 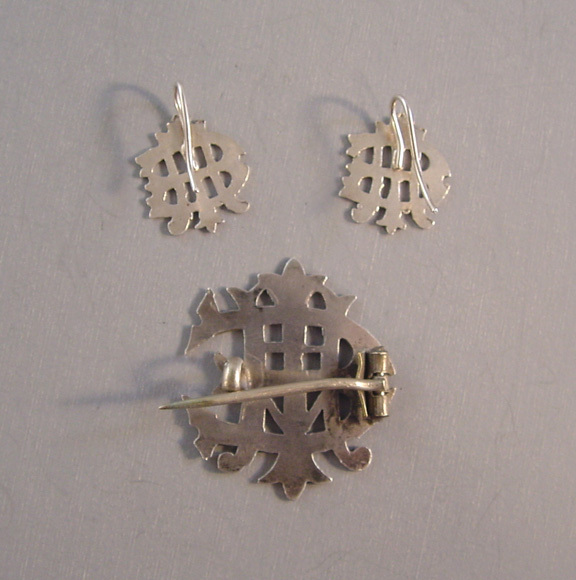 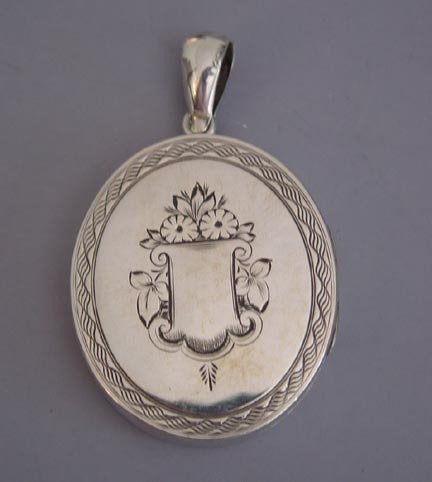 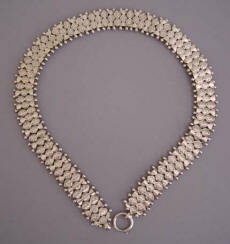 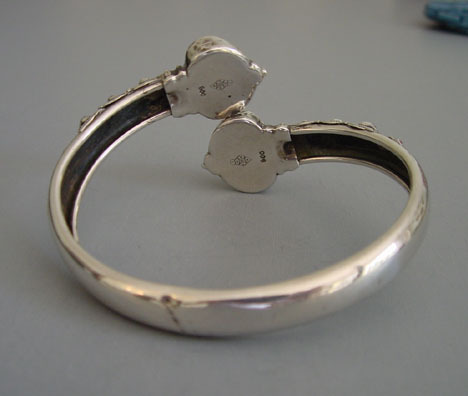 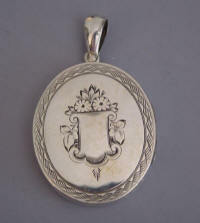 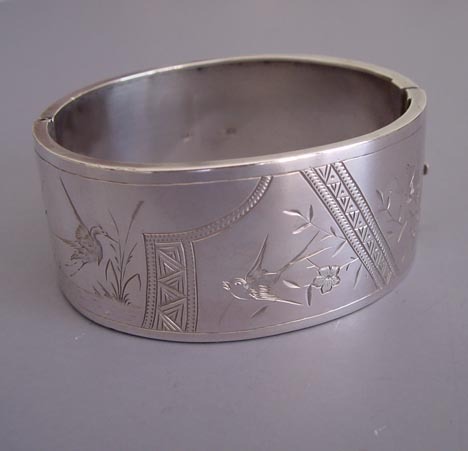 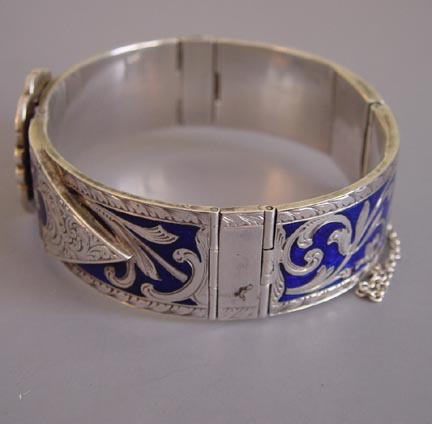 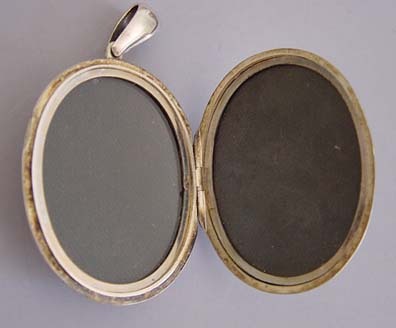 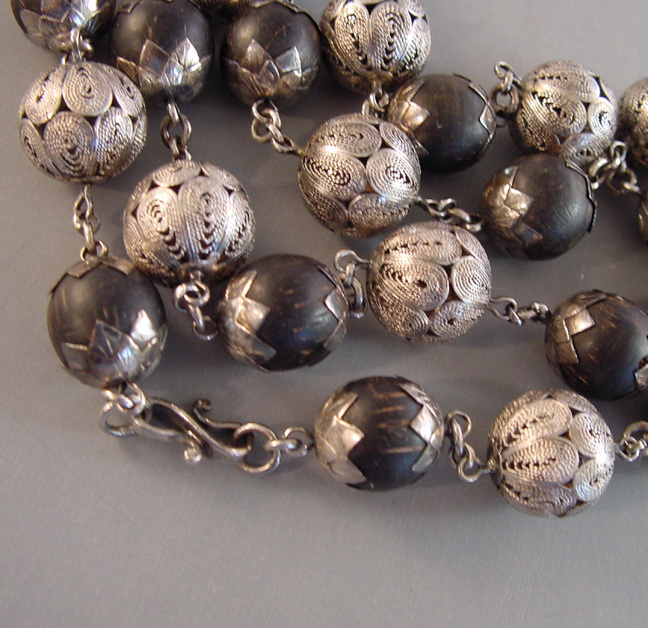 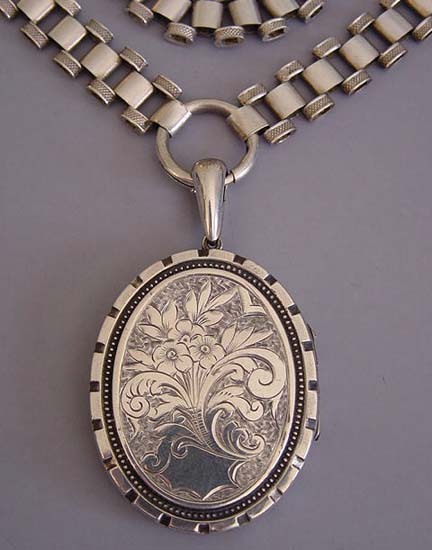 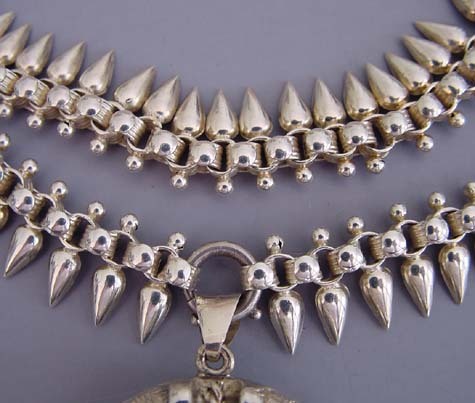 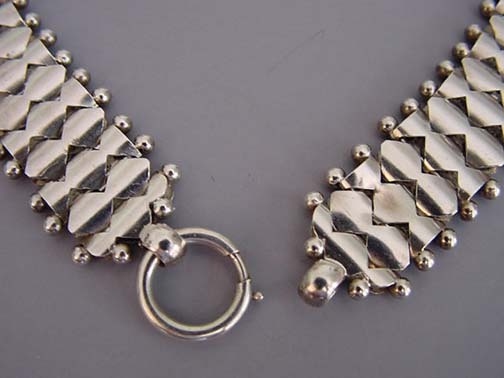 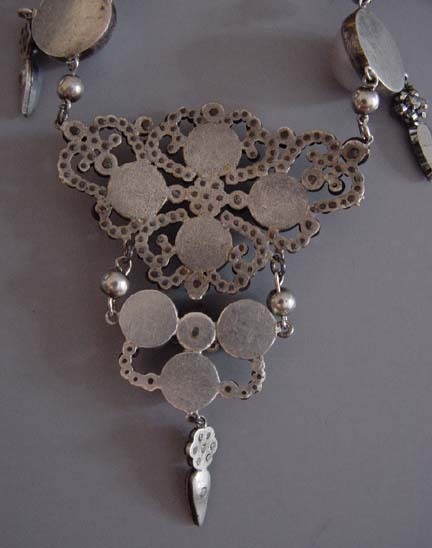 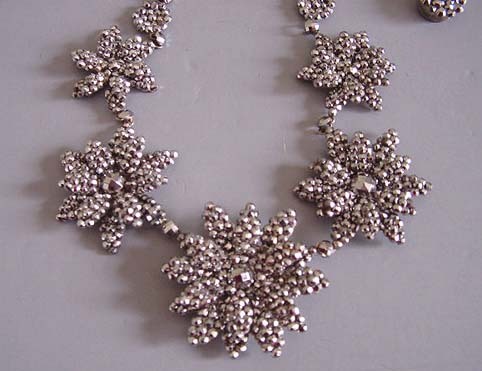 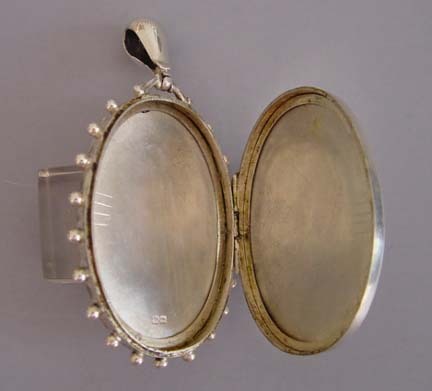 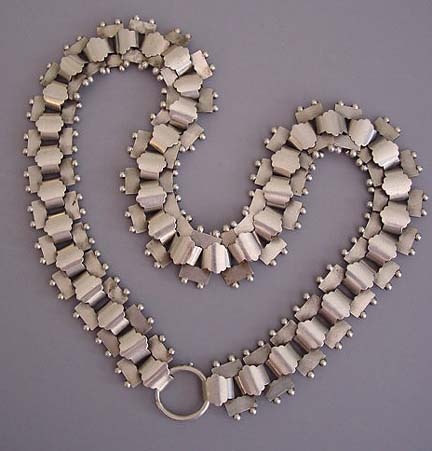 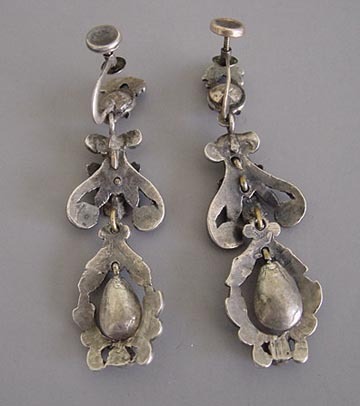 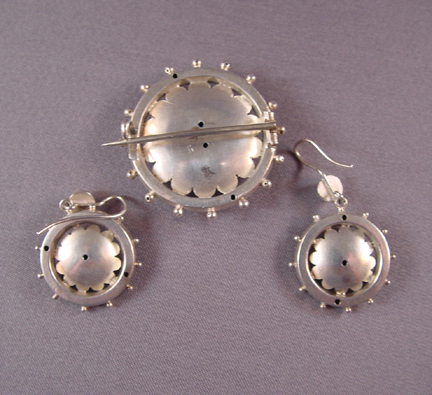 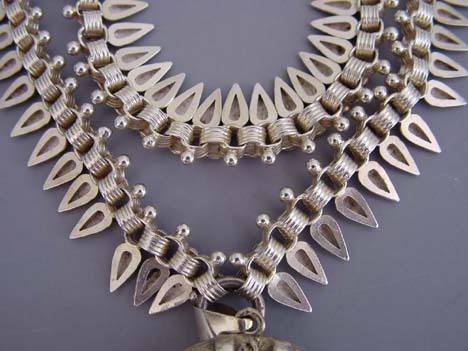 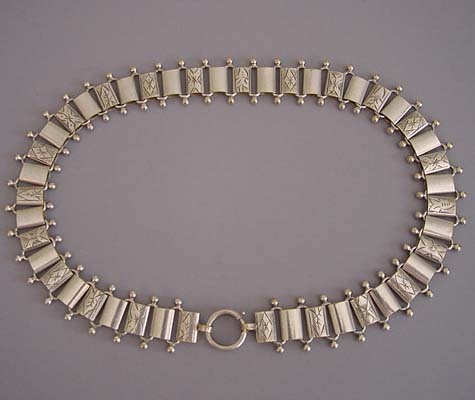 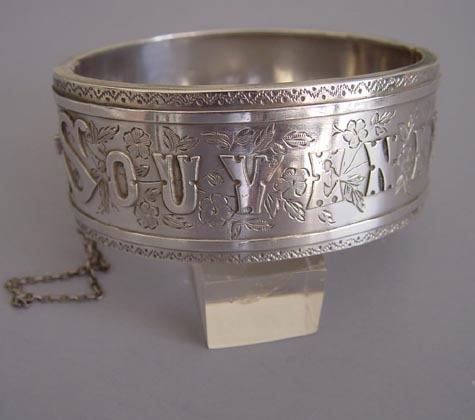 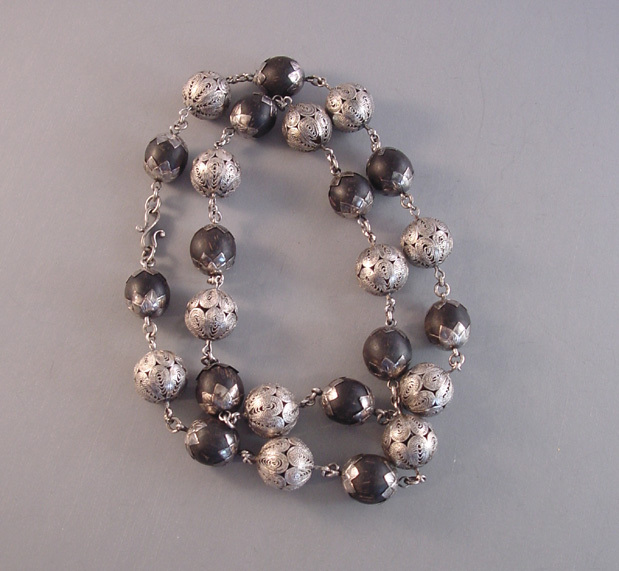 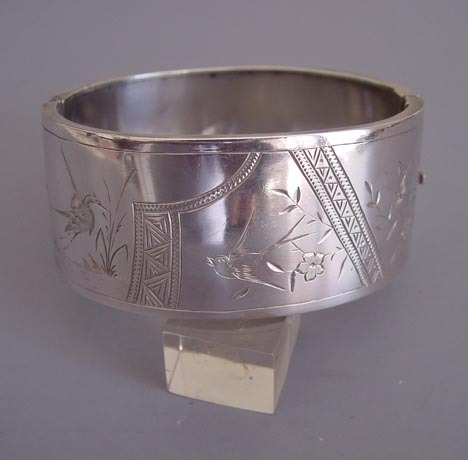 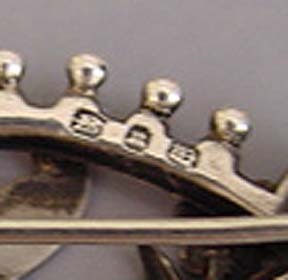 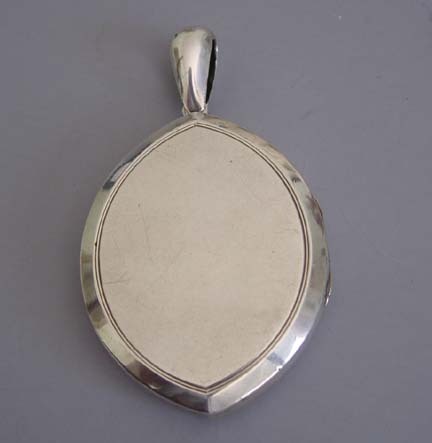 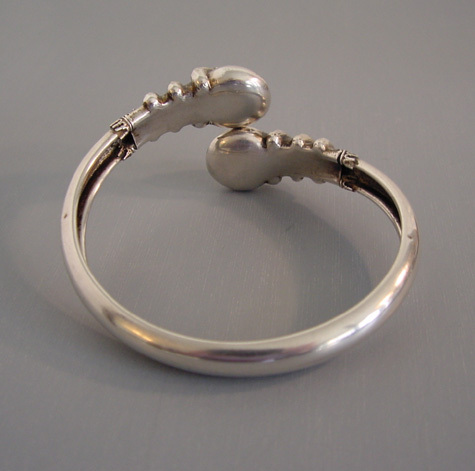 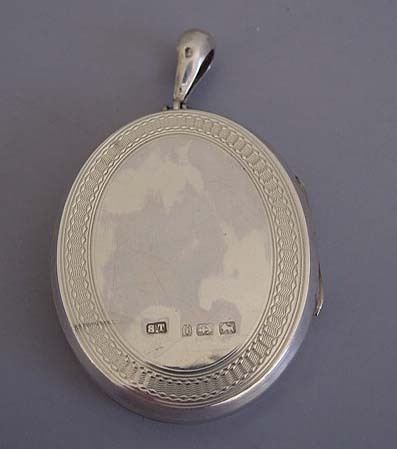 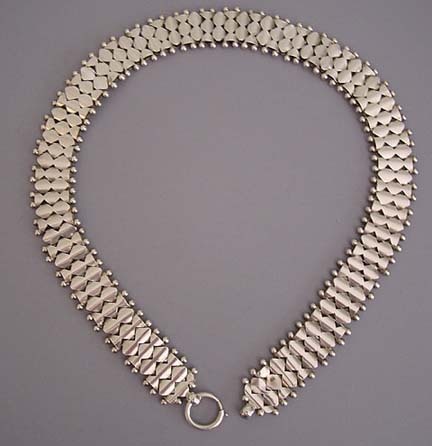 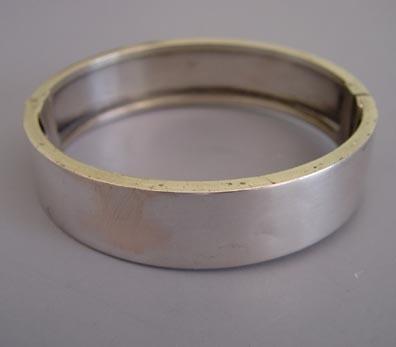 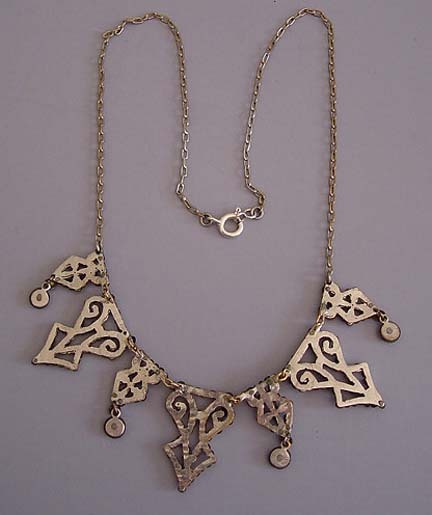 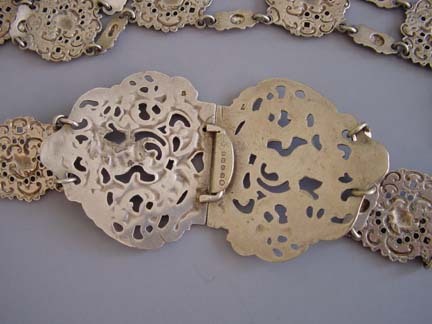 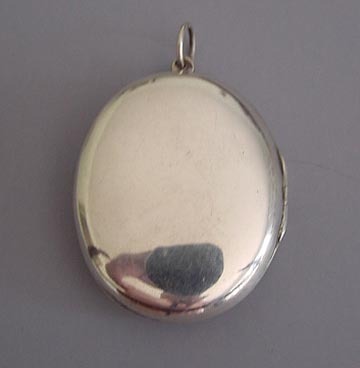 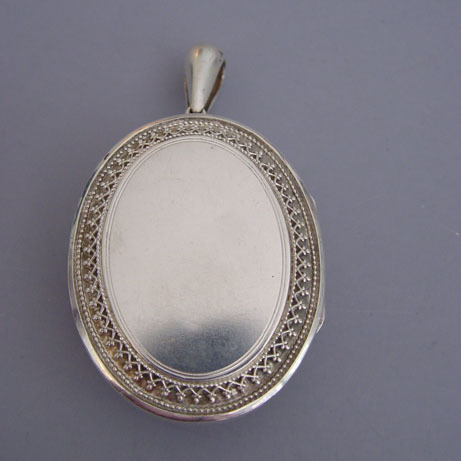 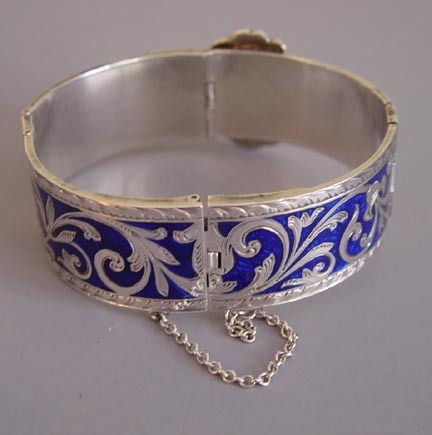 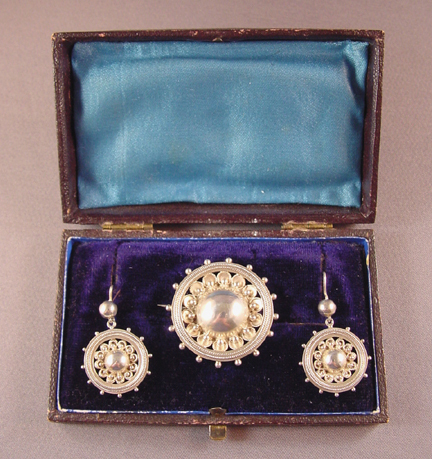 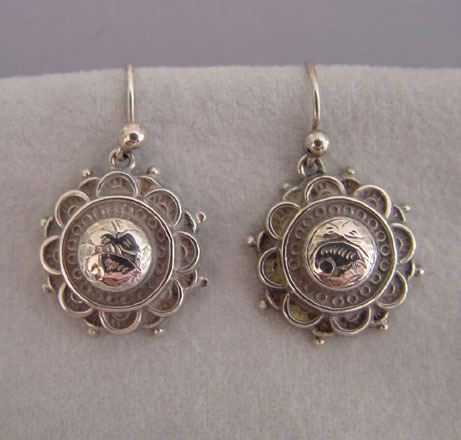 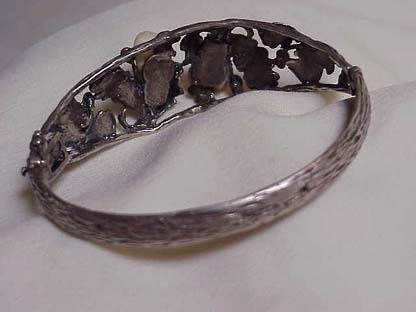 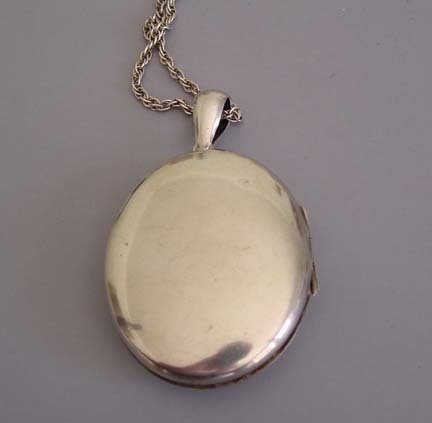 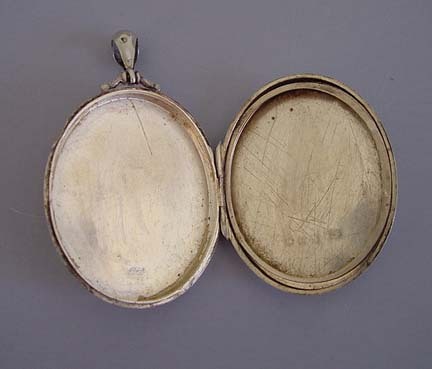 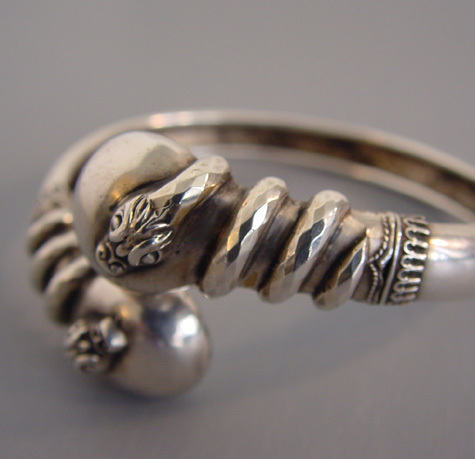 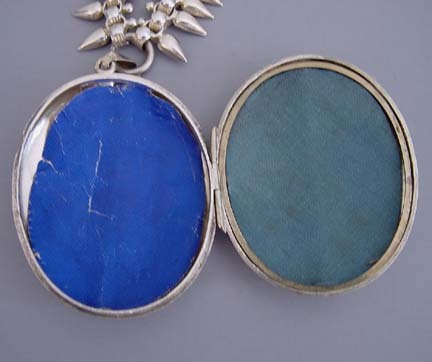 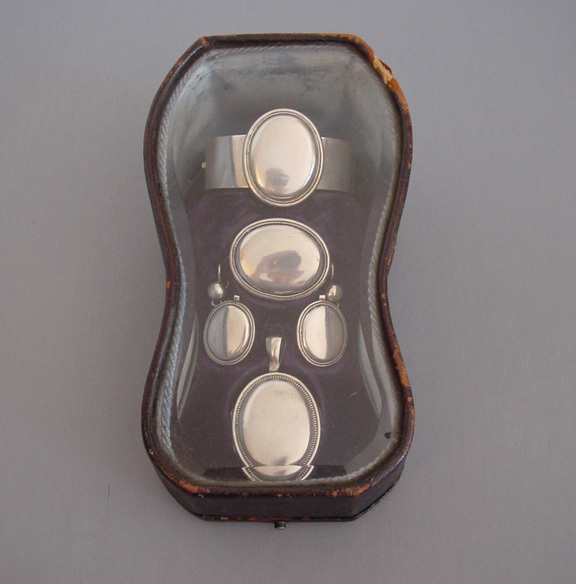 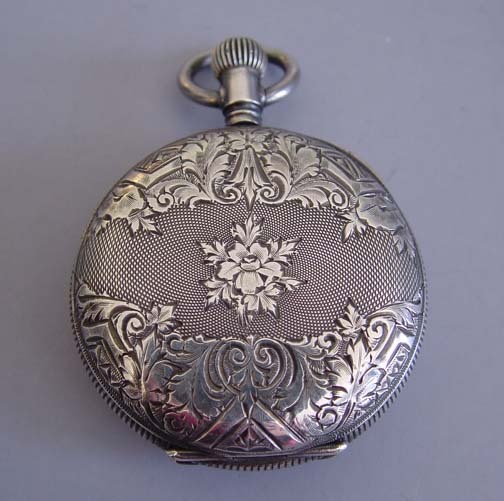 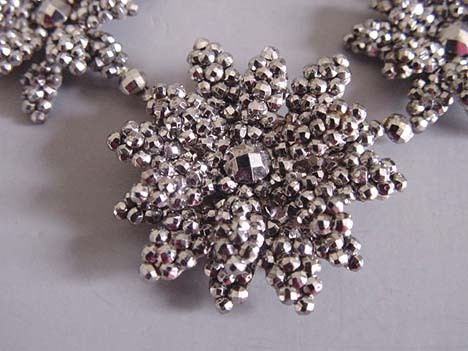 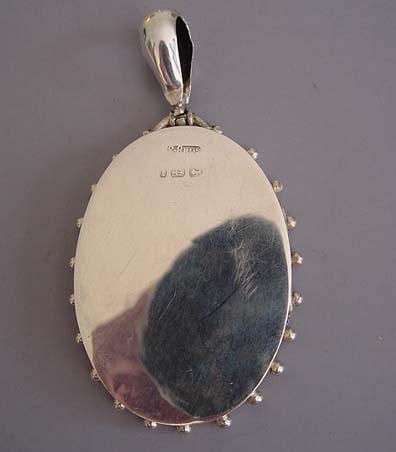 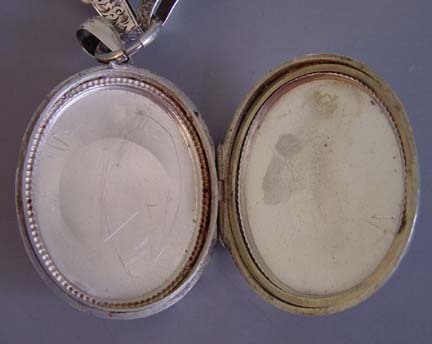 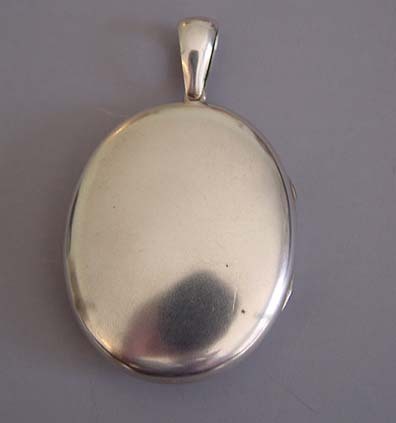 Steel jewellery became fashionable in France and its enormous cost made it popular to the nobility. 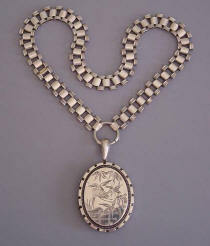 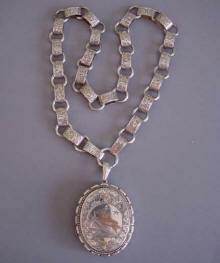 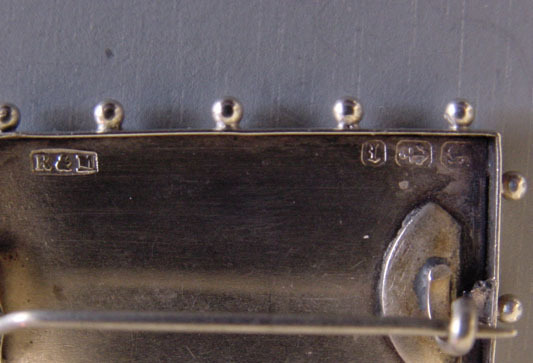 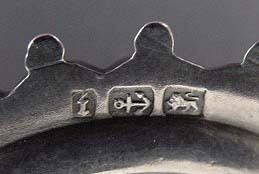 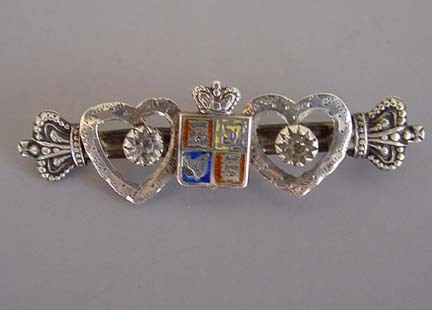 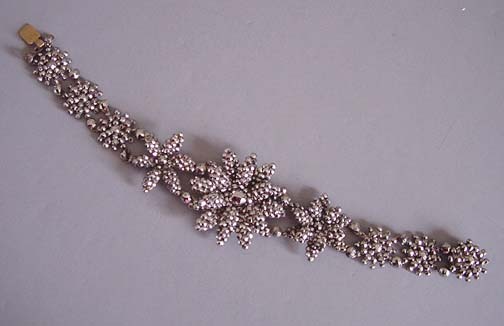 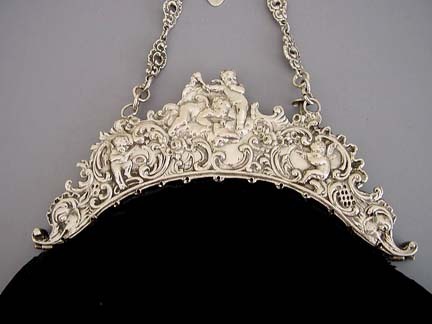 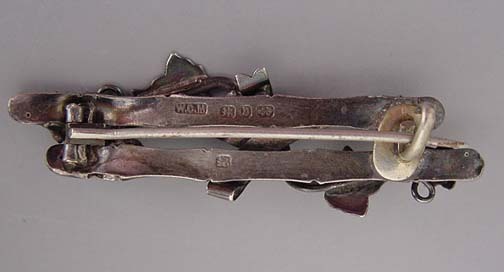 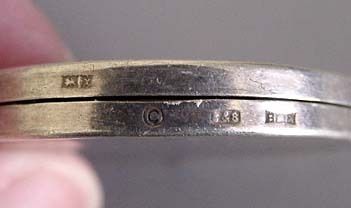 Napoleon, on his second marriage to Marie-Louise of Austria commissioned a whole parure of cut steel for his new bride. 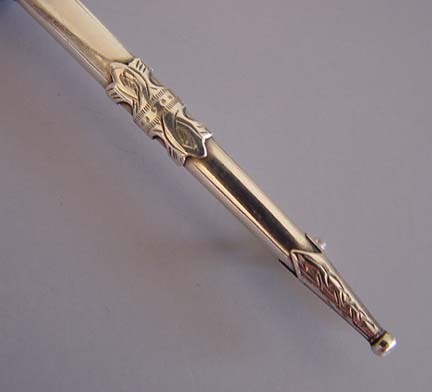 By 1775, Mathew Boulton was the most famous steel worker Matthew Boulton, first in London and then in Birmingham. 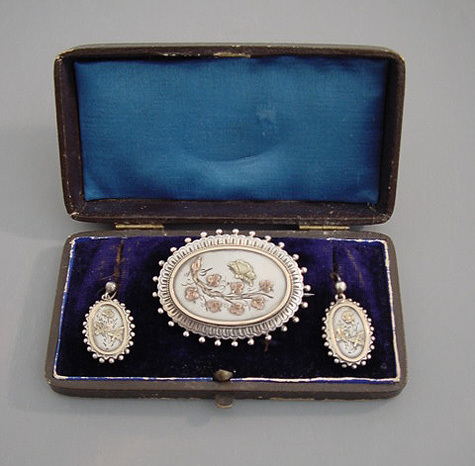 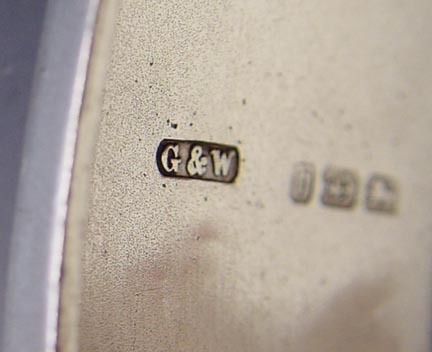 By the 1790s the industry was producing its finest work although the French Revolution robbed the British workshops of their best customer. 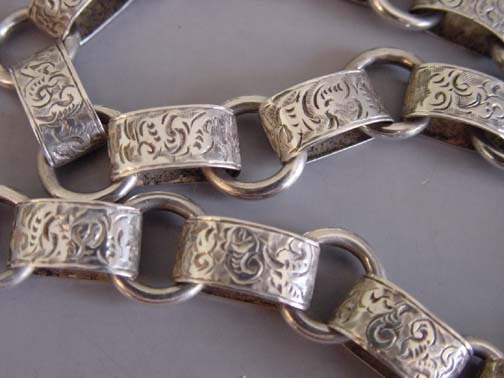 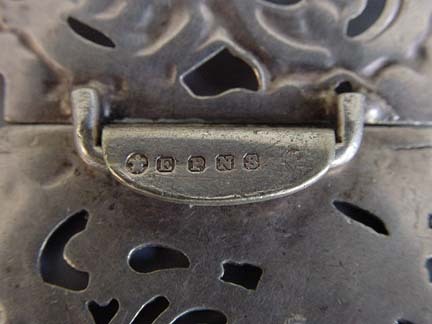 Though many shops in England closed, the French cut steel industry survived to the turn of the 19th century.